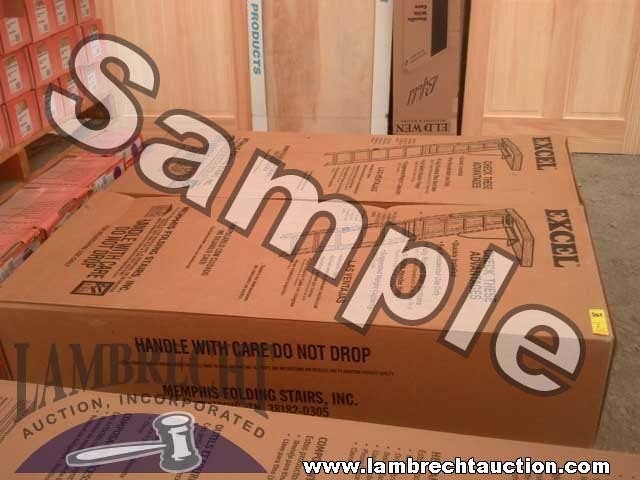 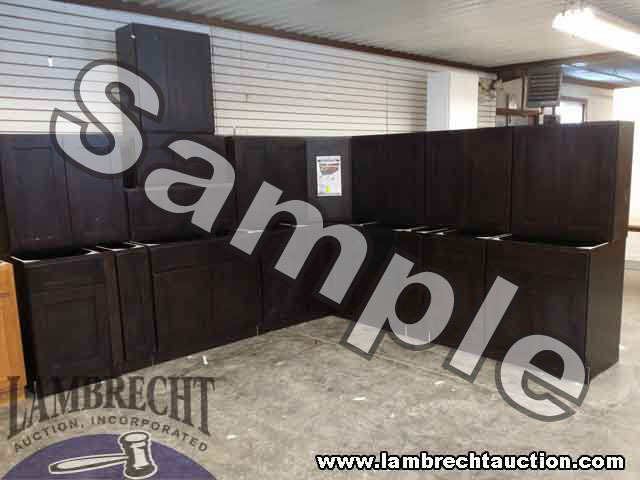 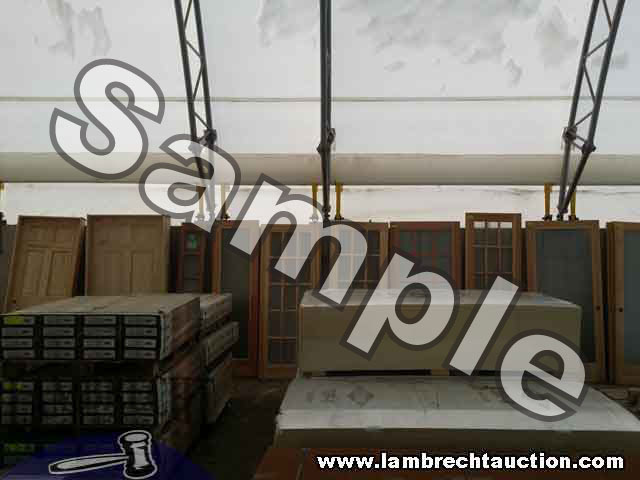 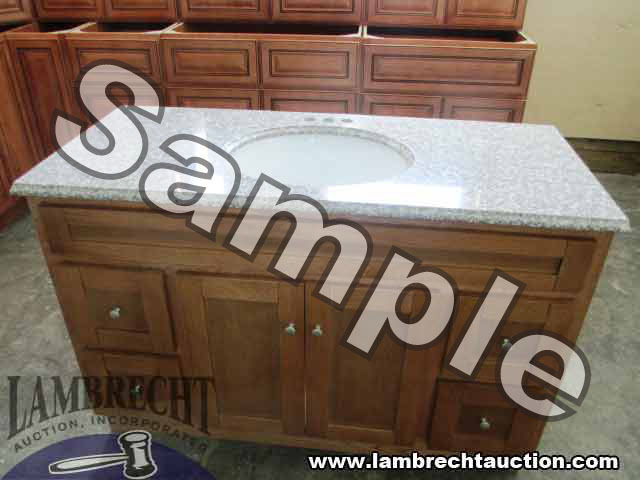 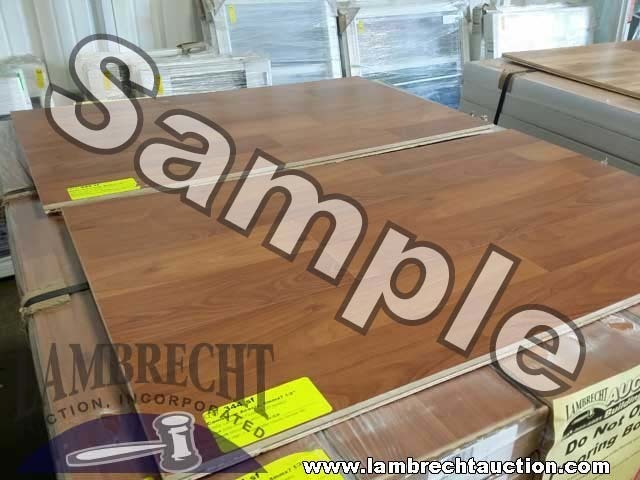 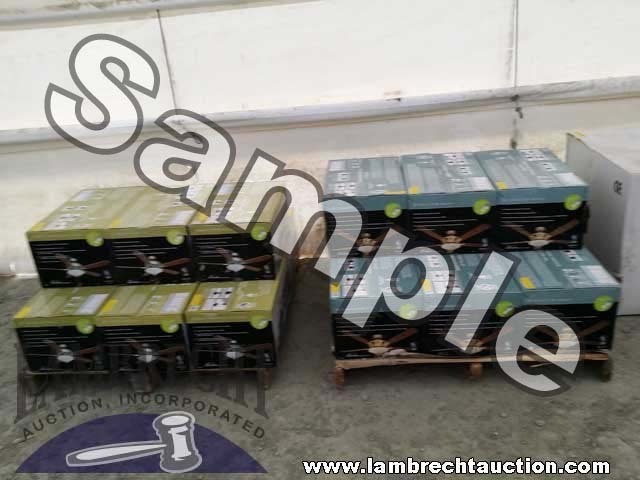 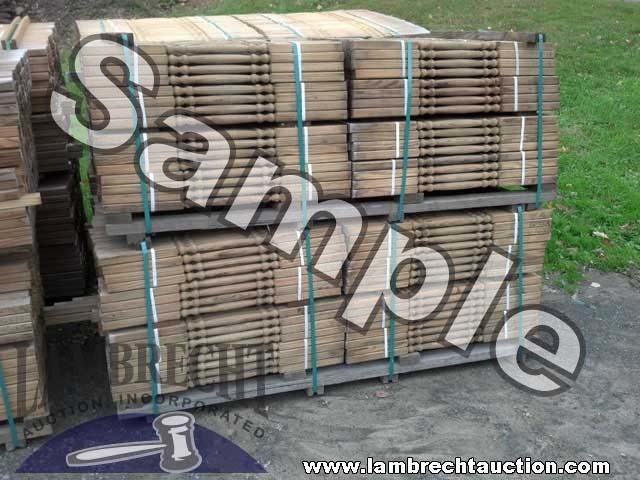 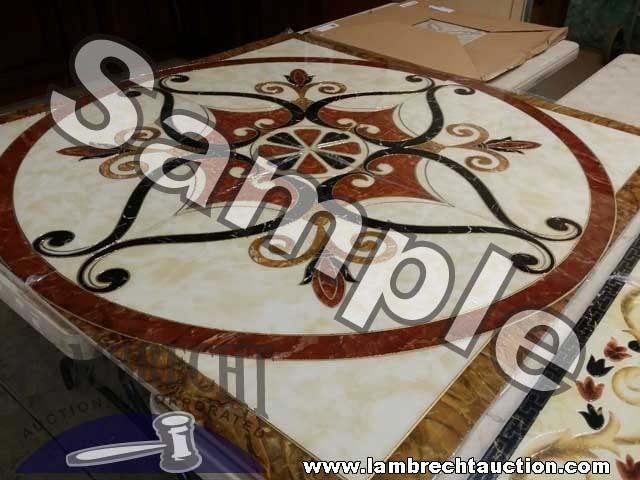 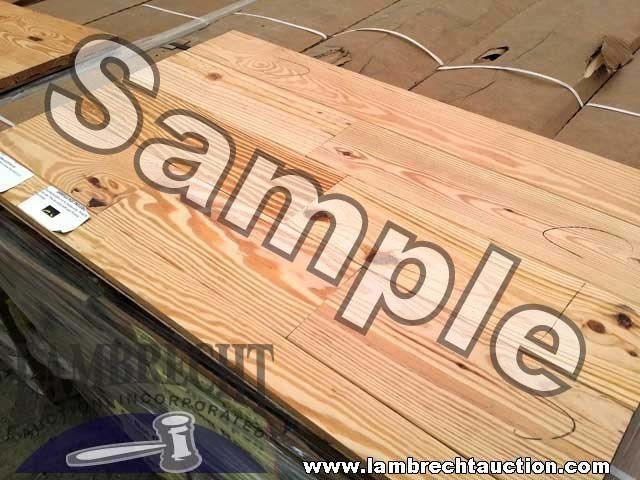 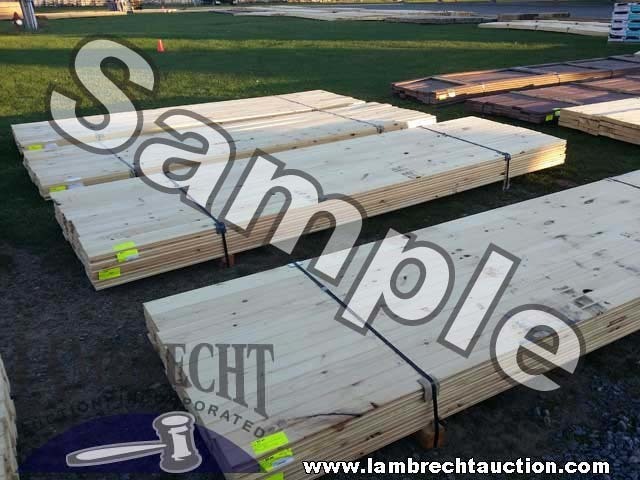 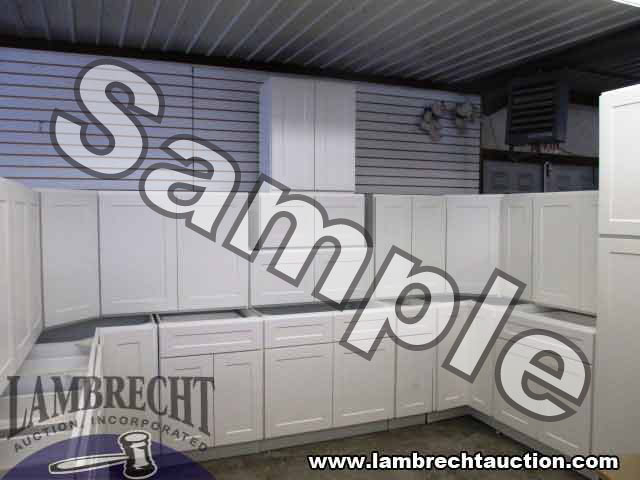 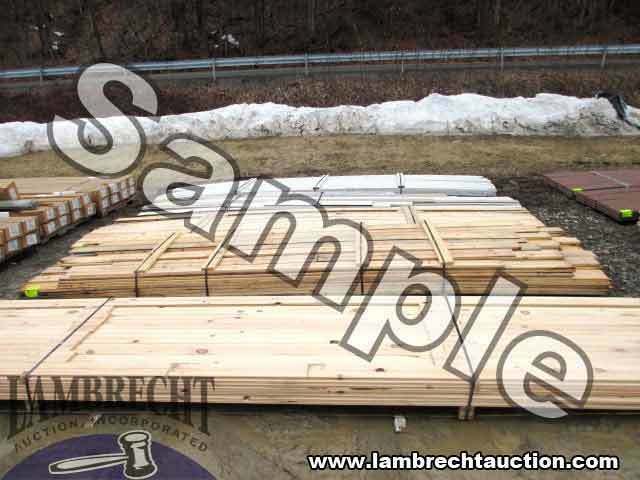 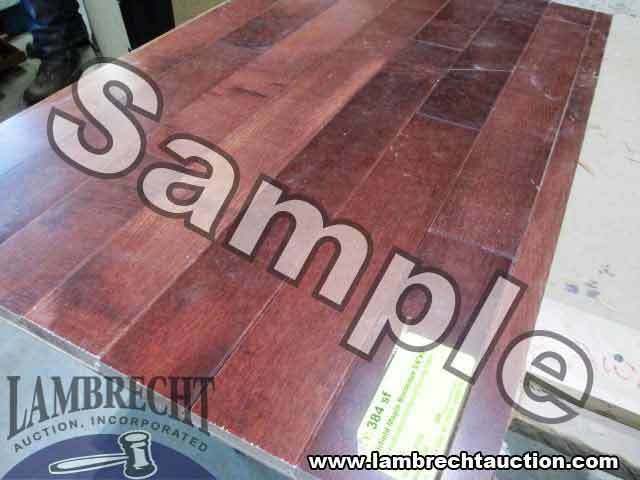 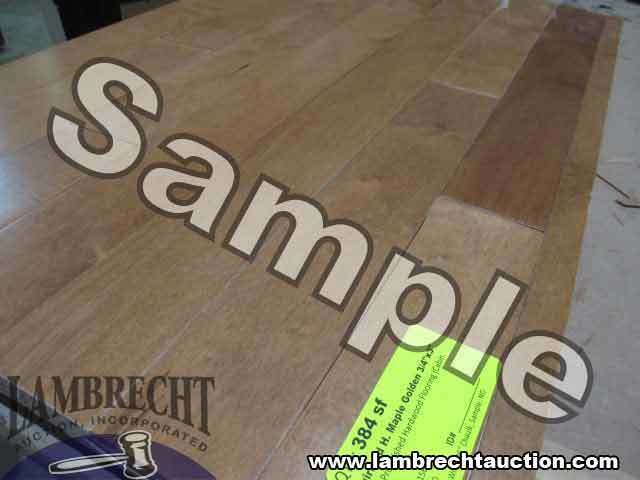 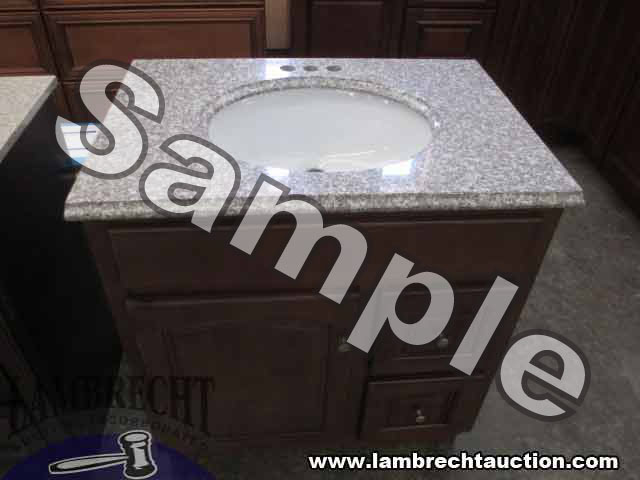 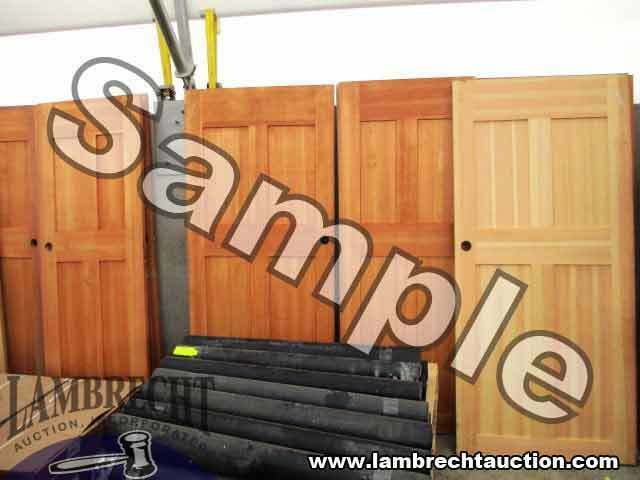 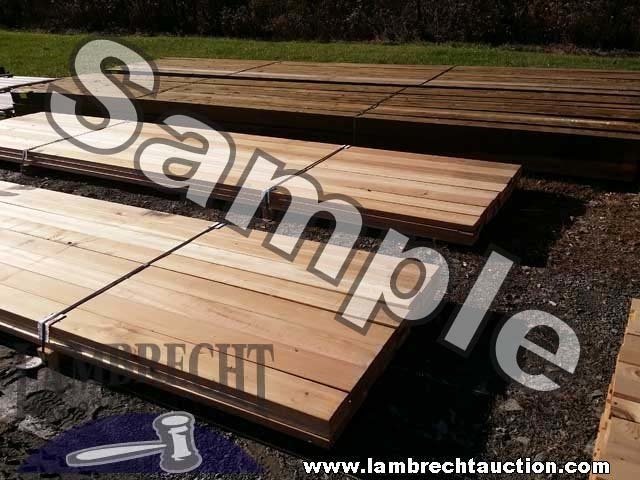 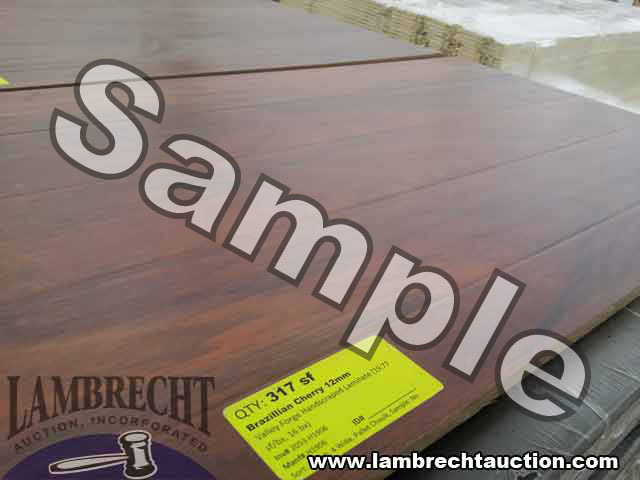 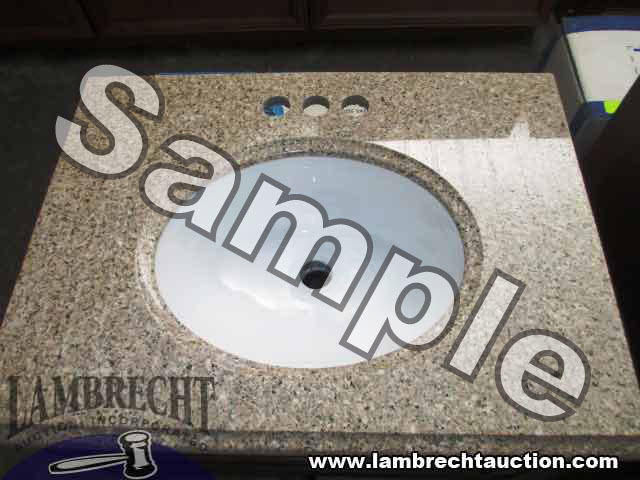 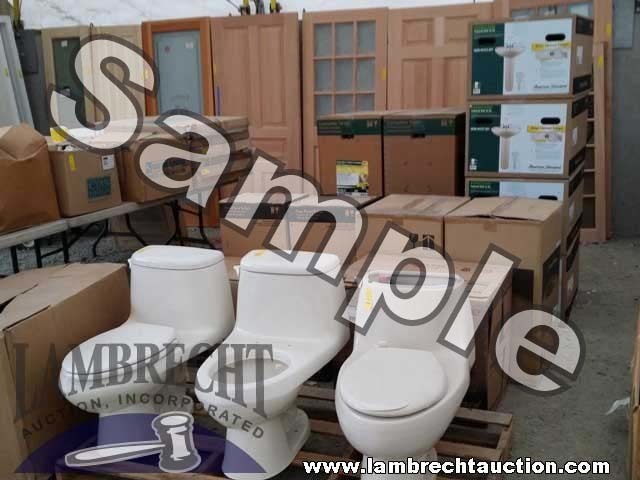 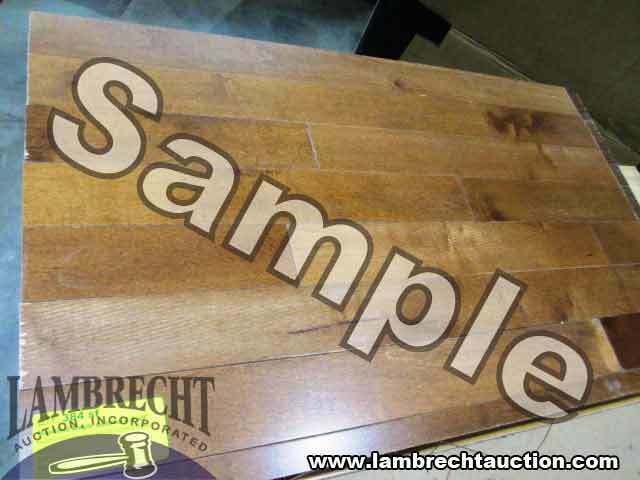 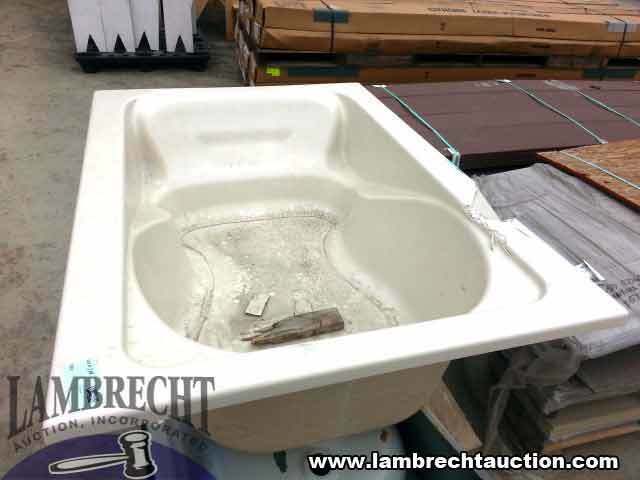 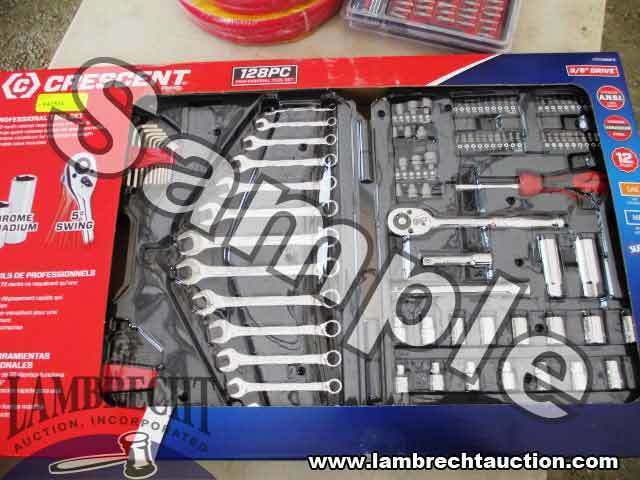 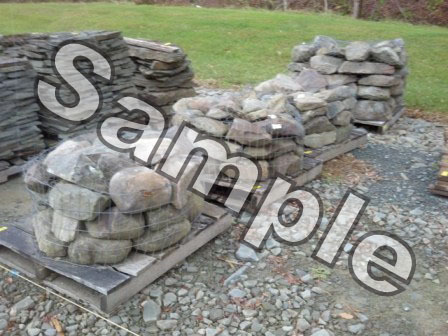 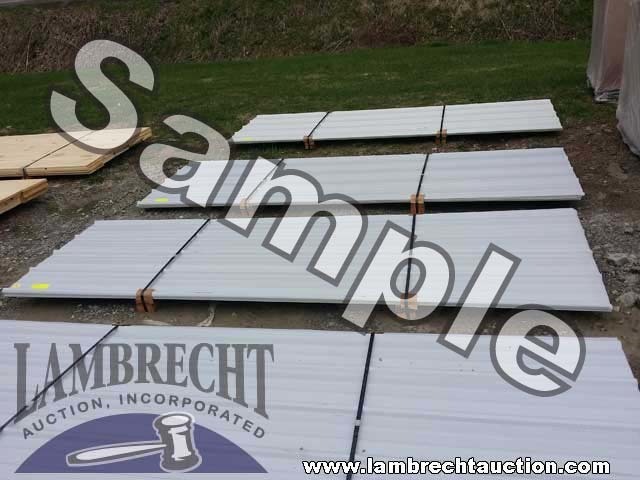 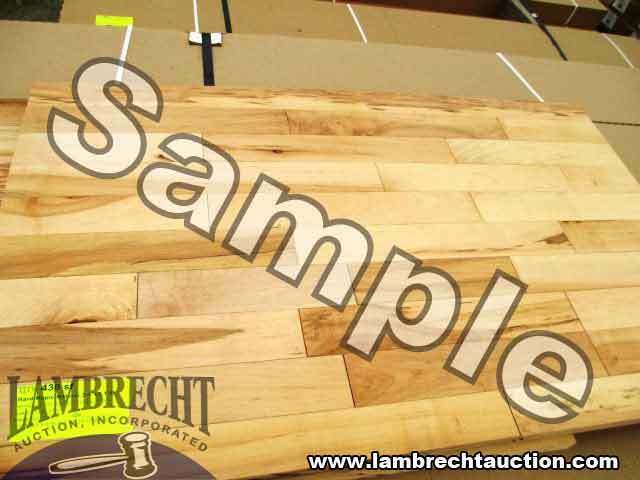 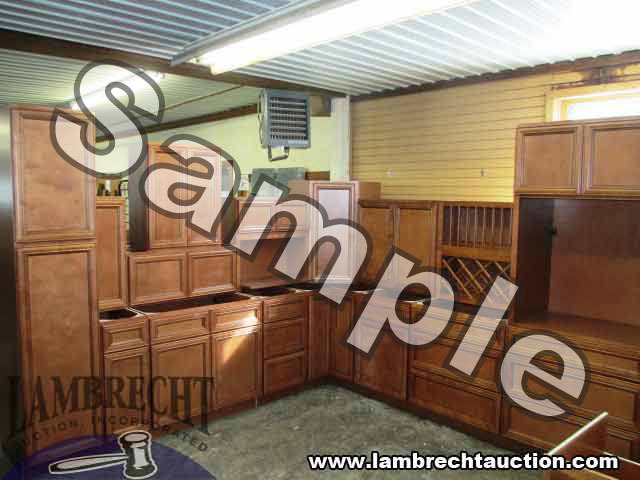 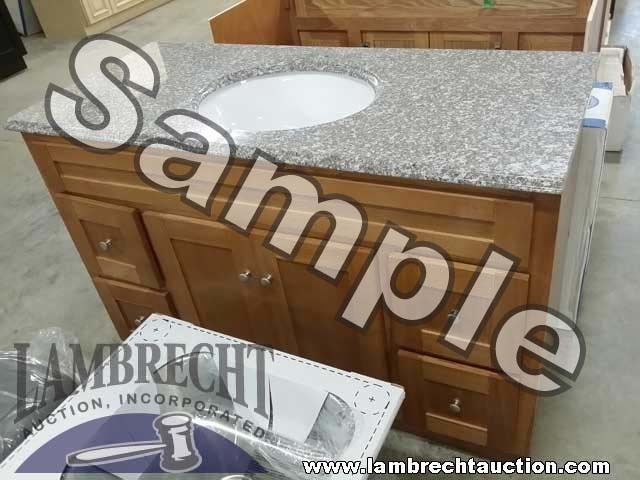 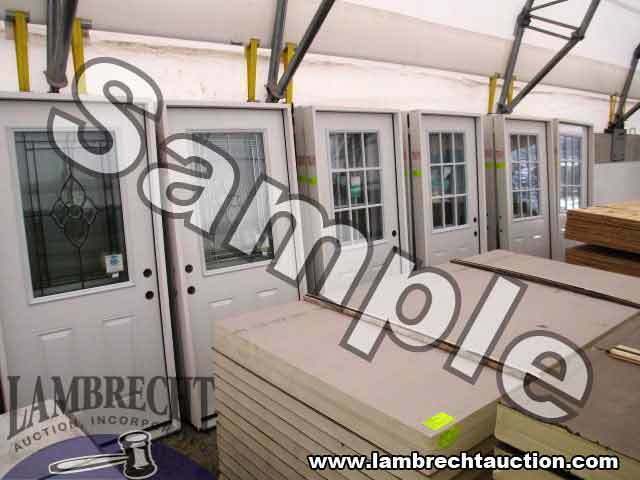 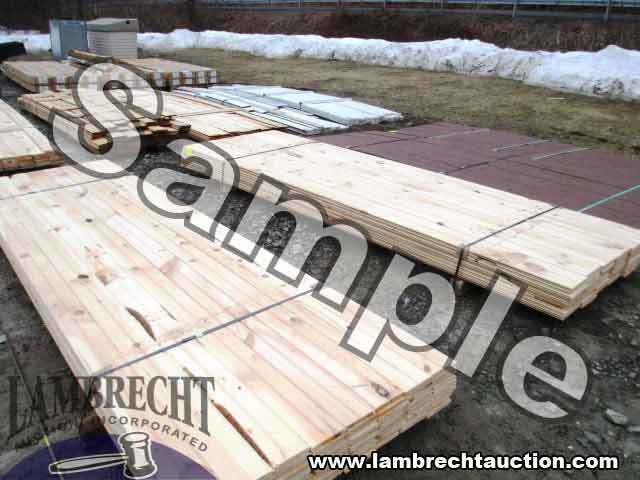 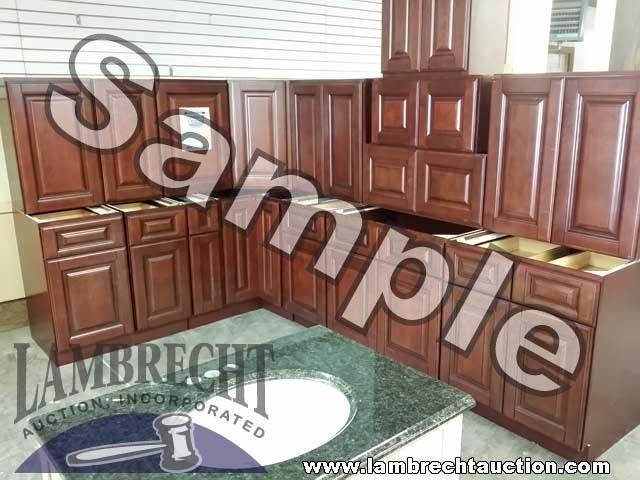 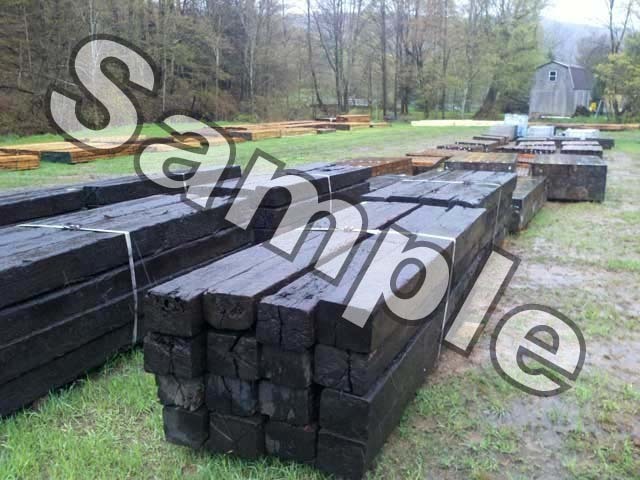 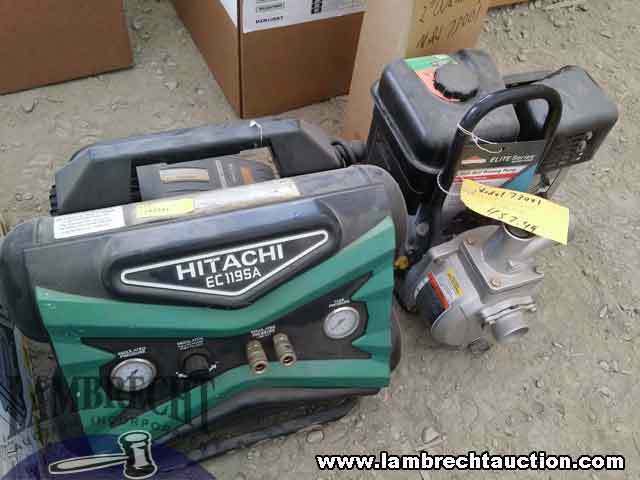 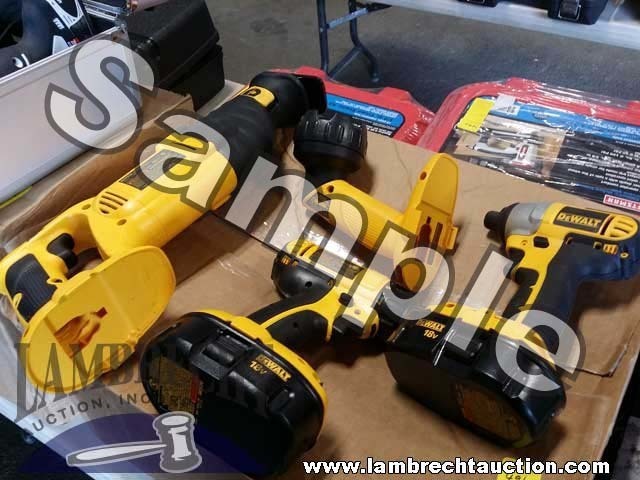 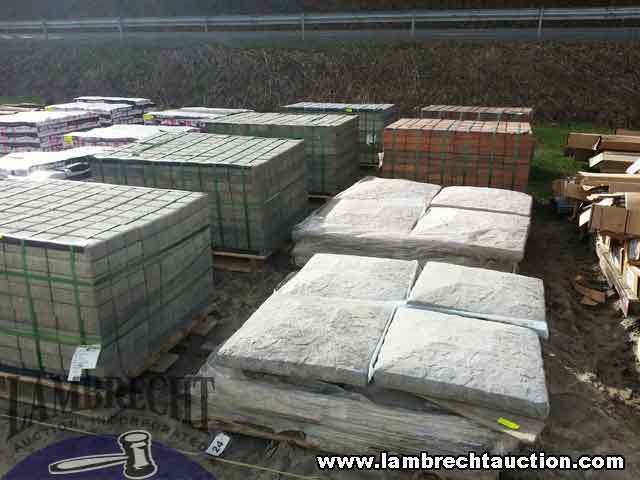 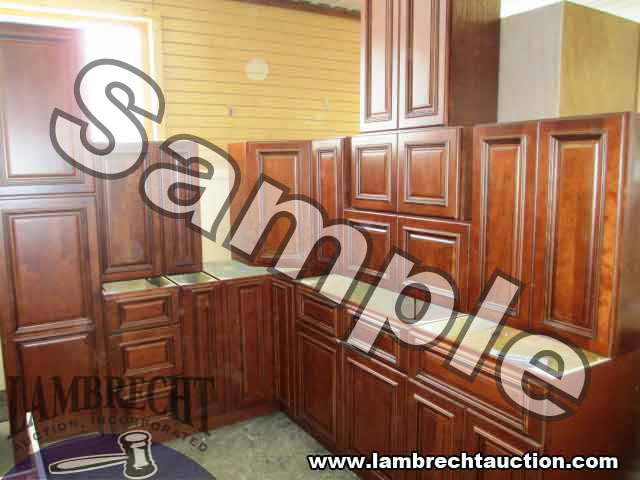 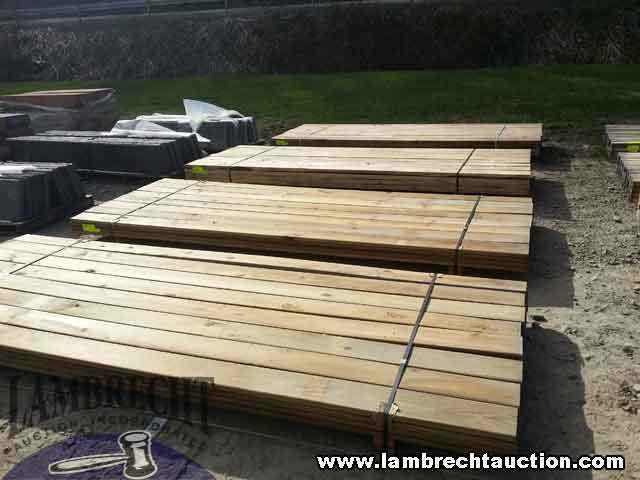 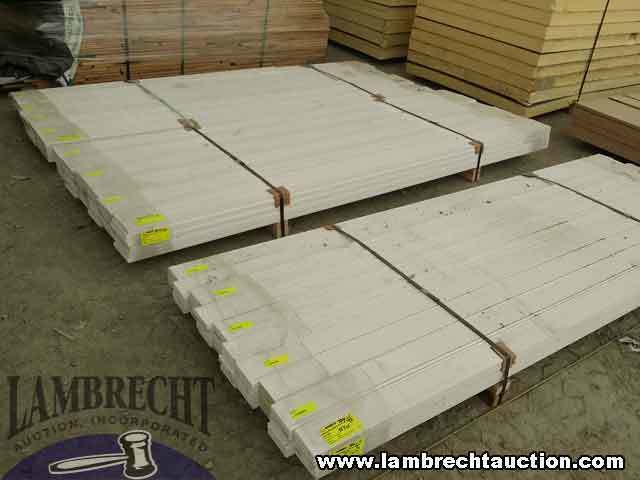 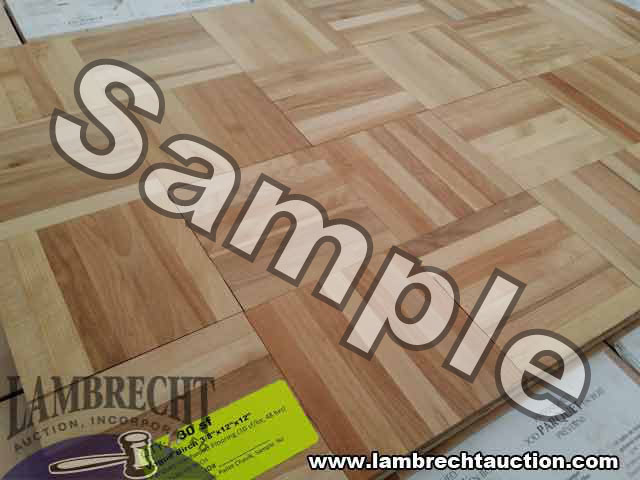 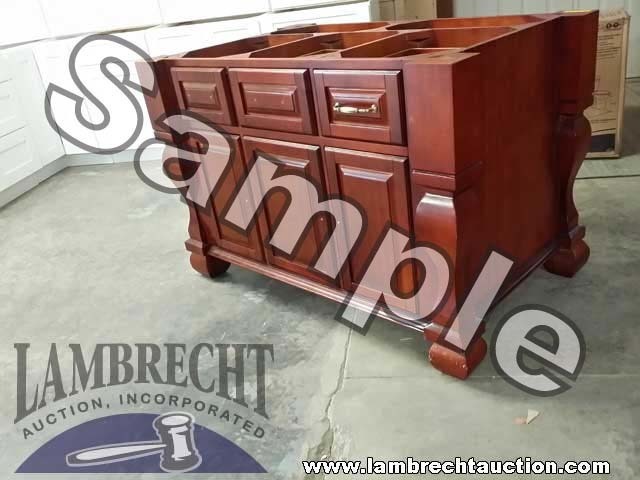 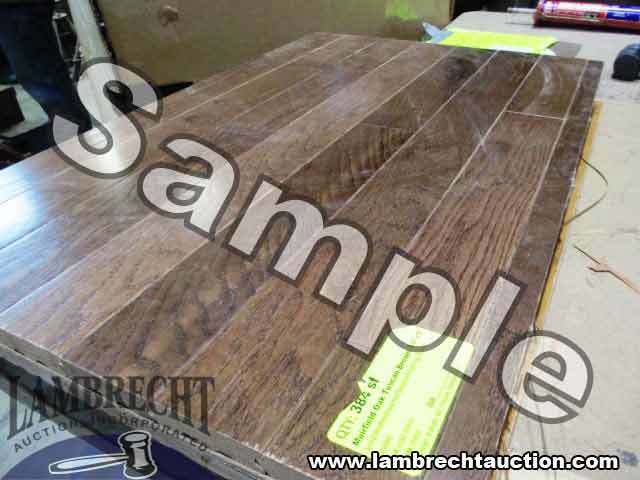 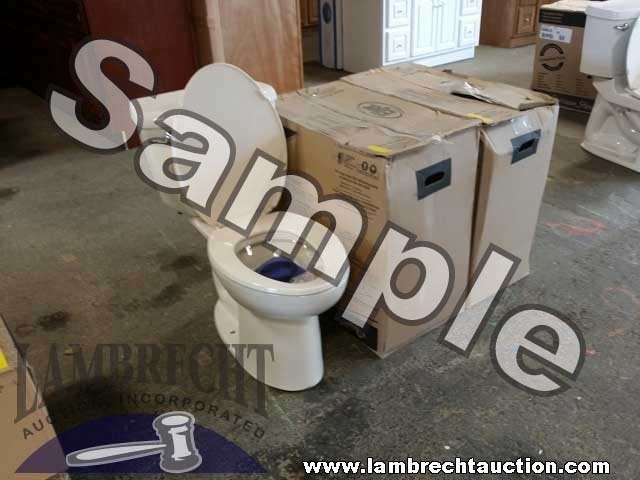 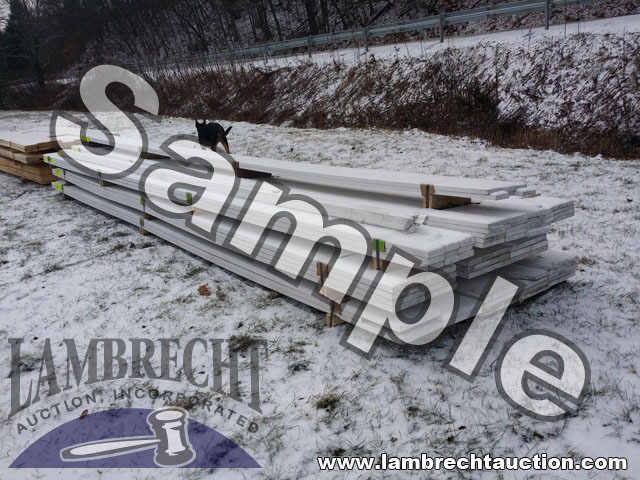 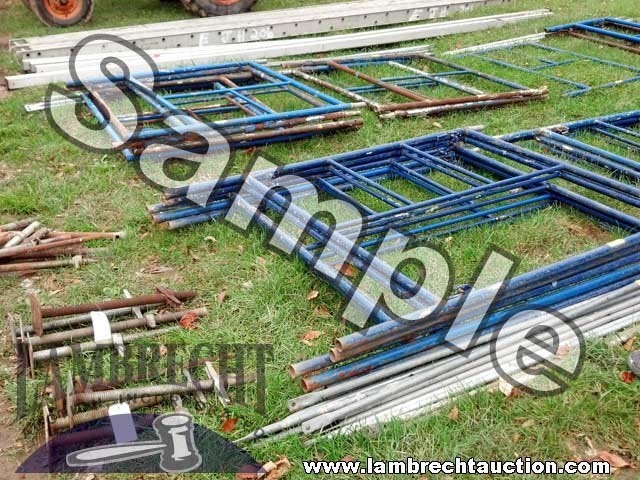 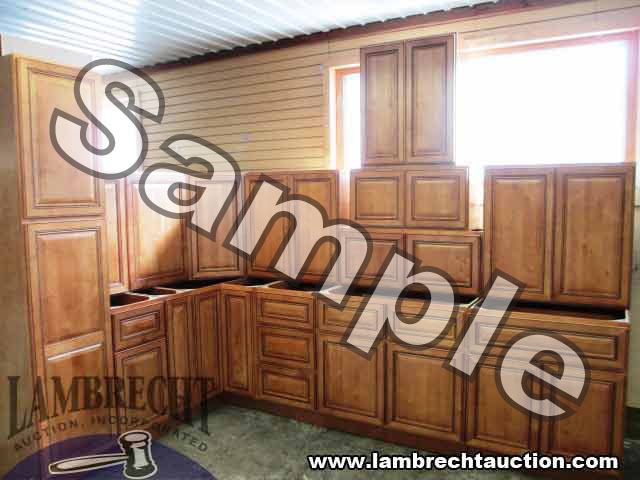 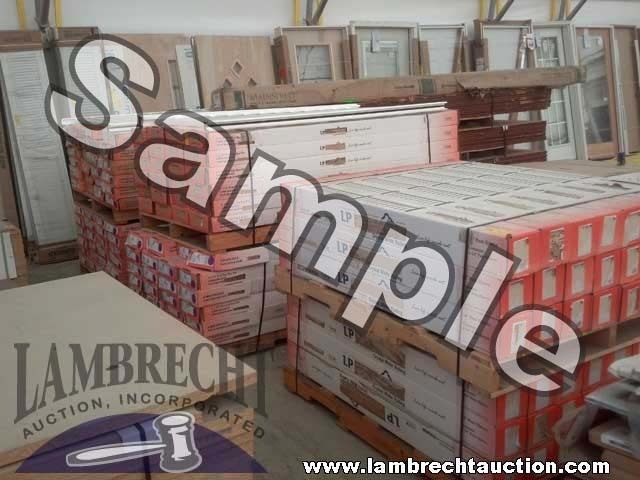 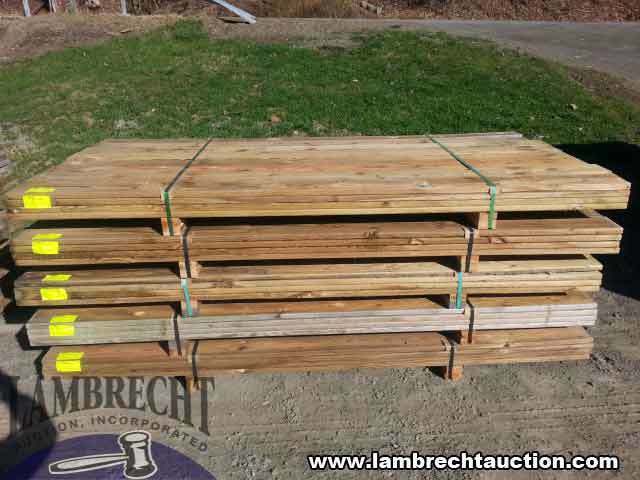 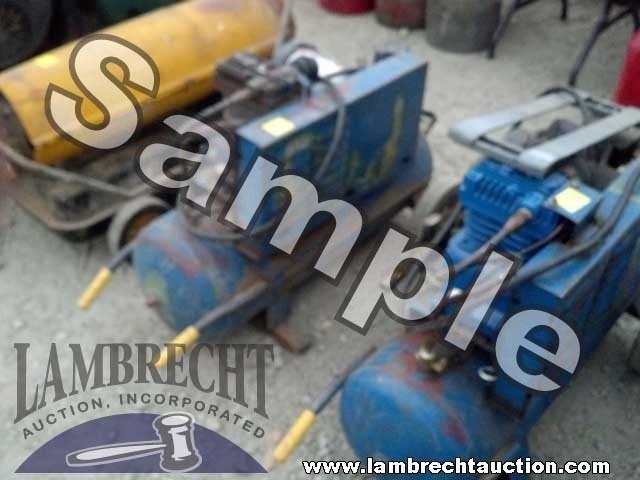 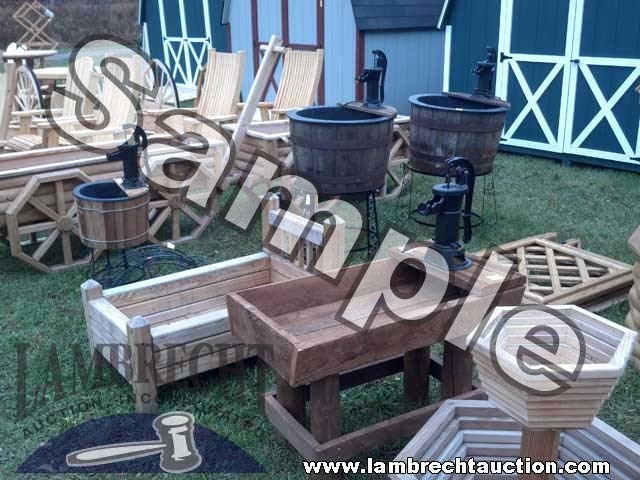 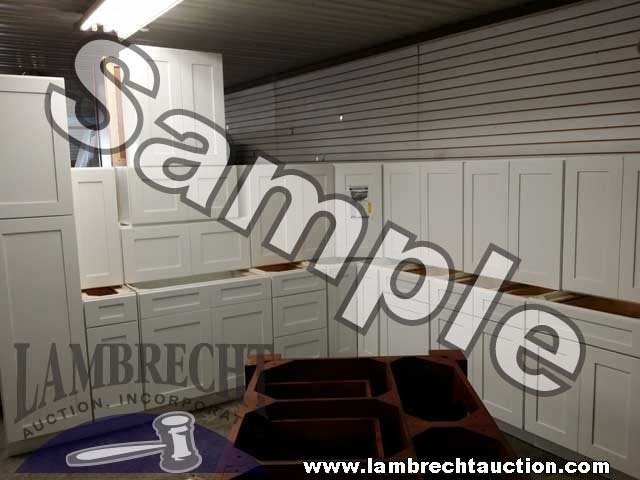 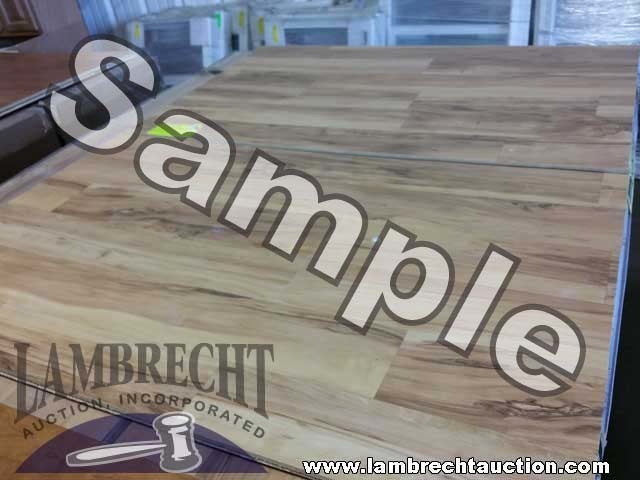 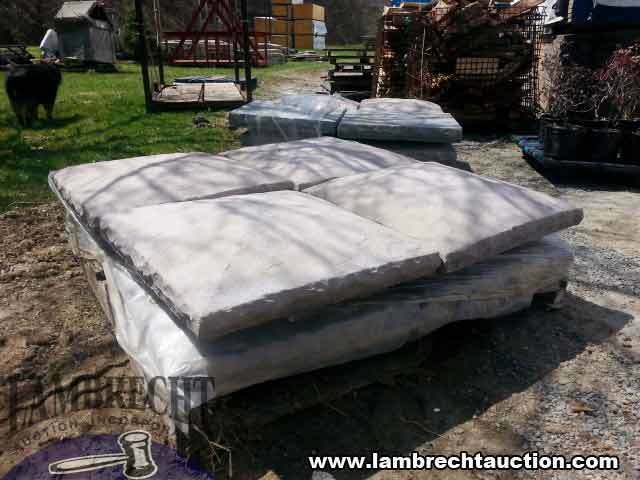 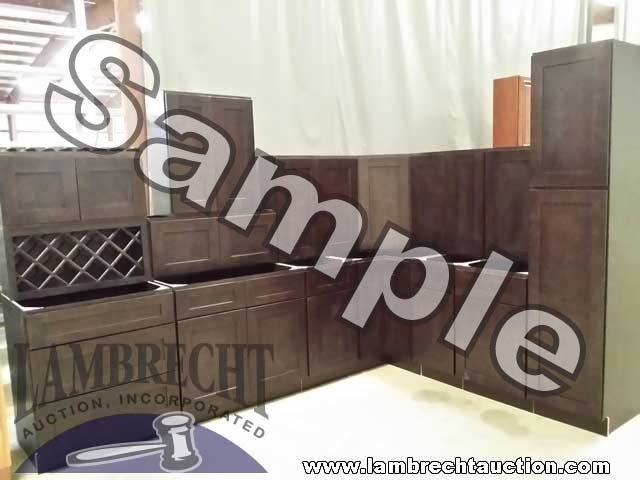 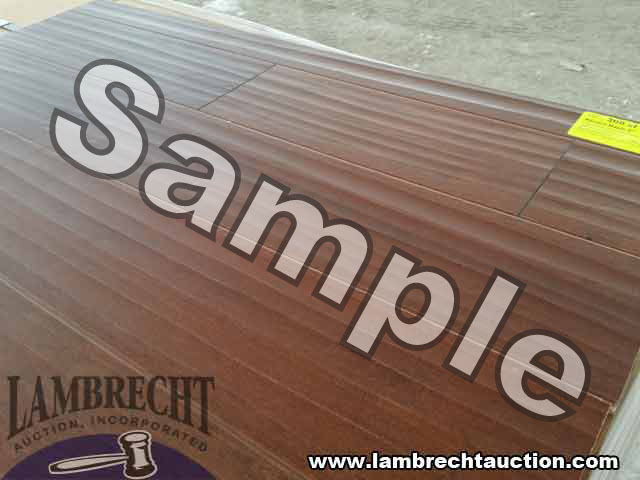 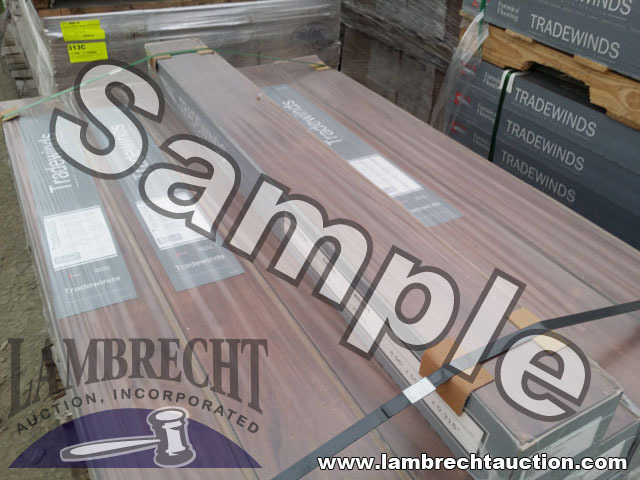 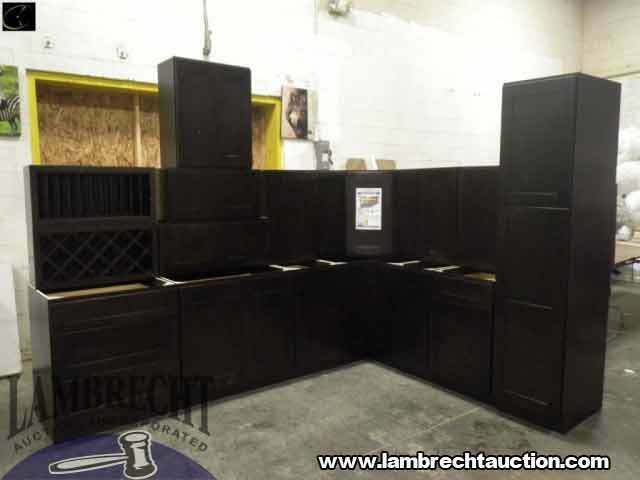 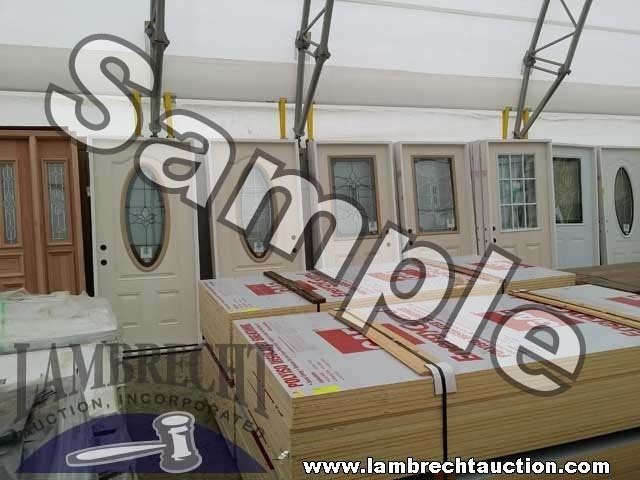 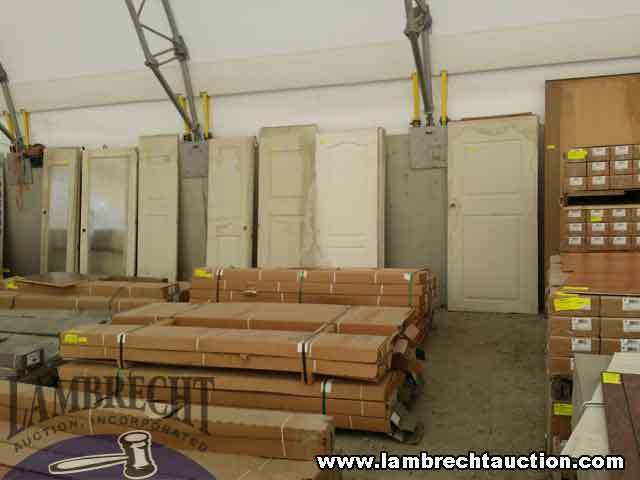 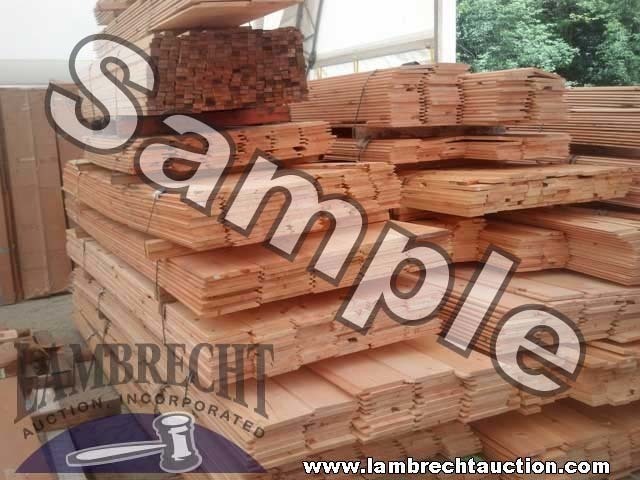 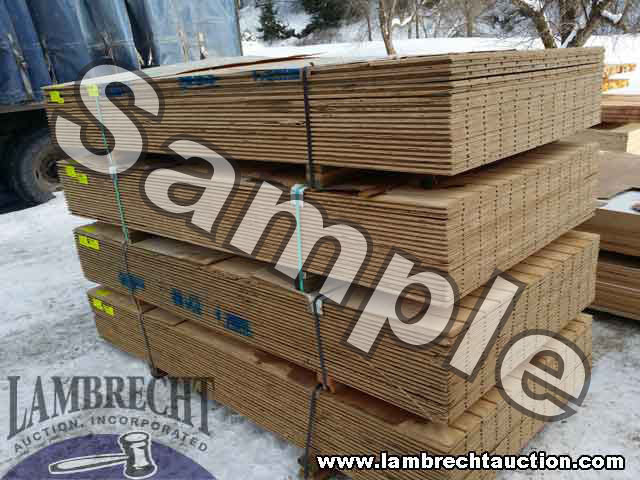 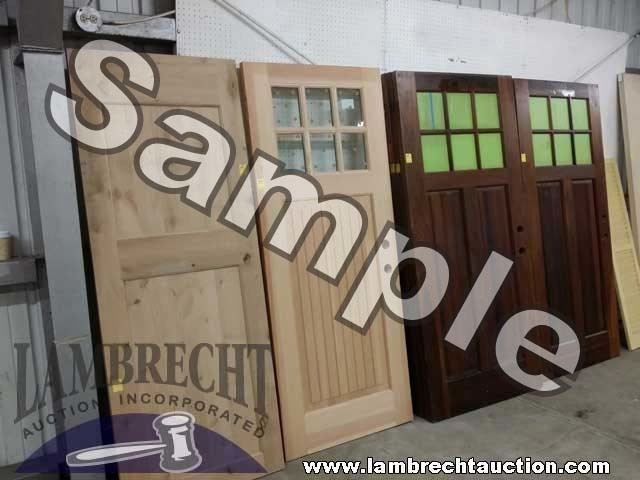 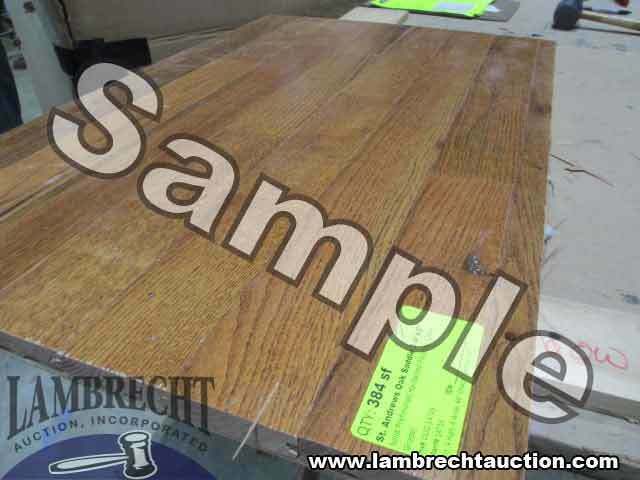 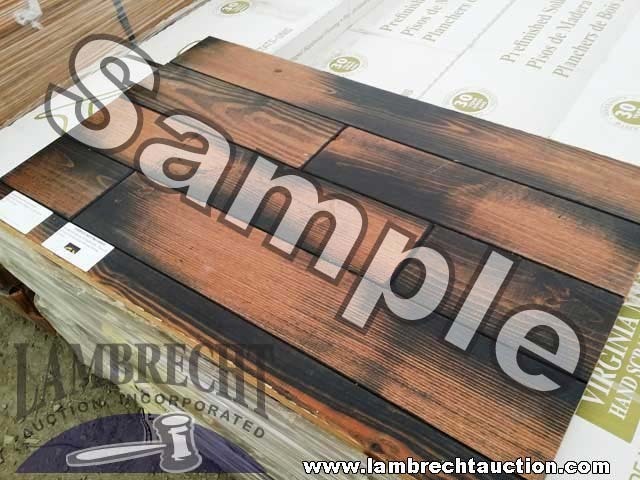 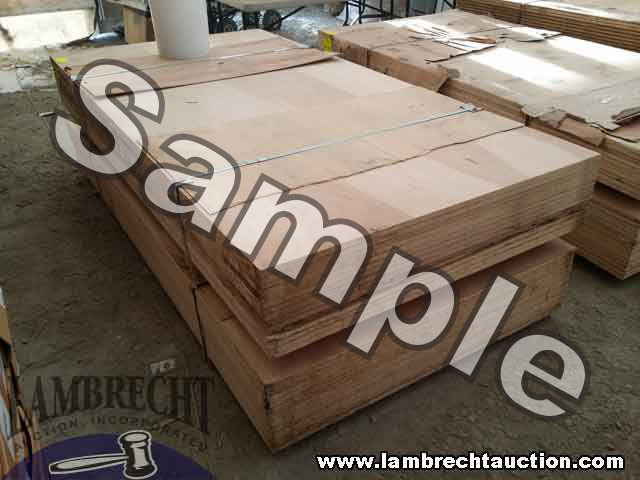 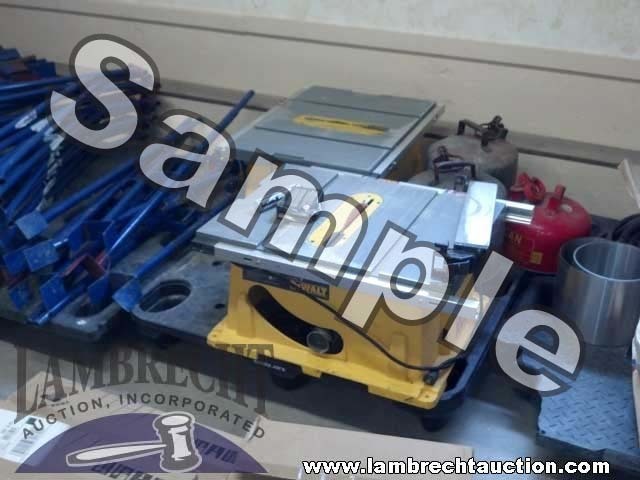 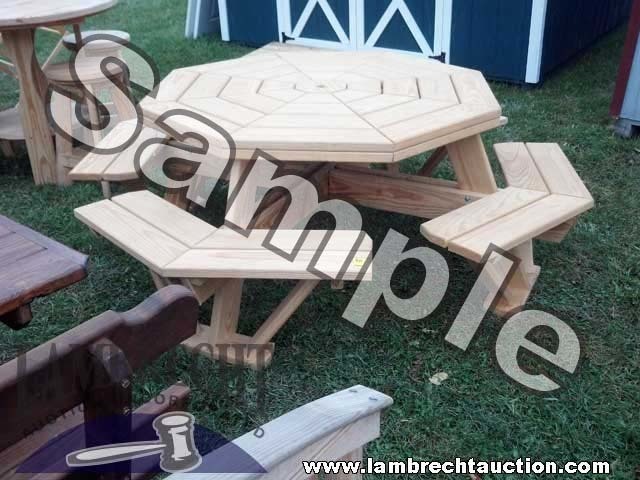 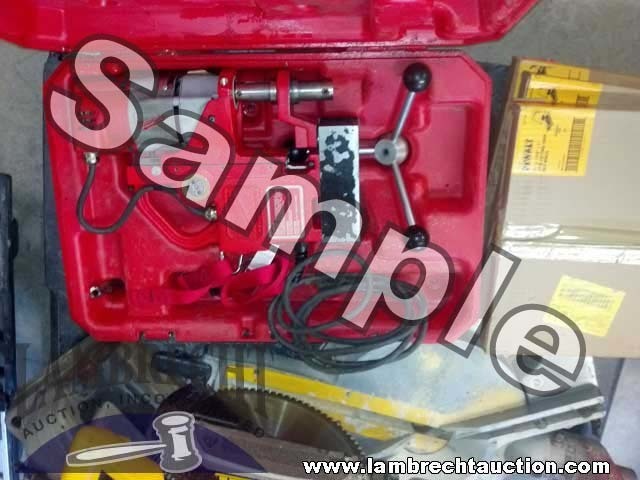 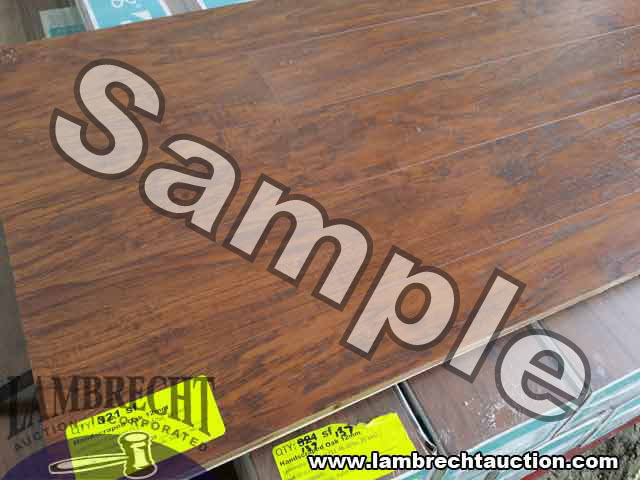 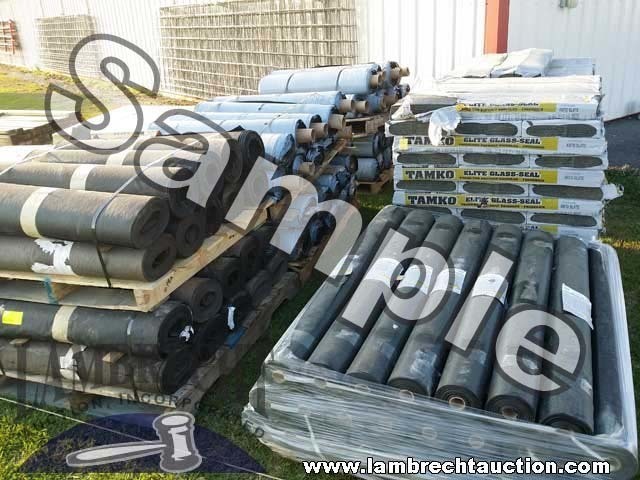 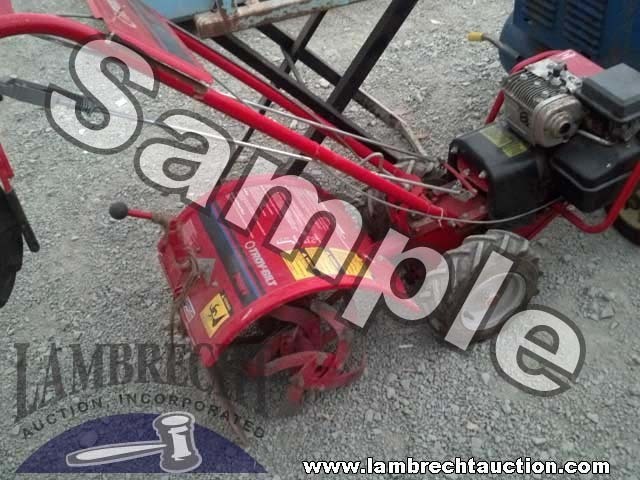 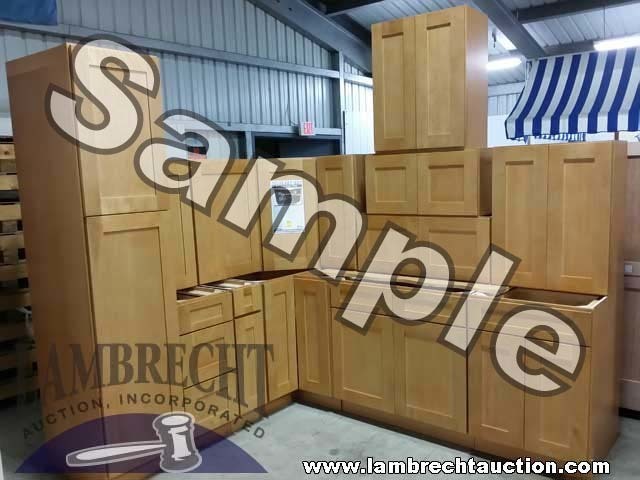 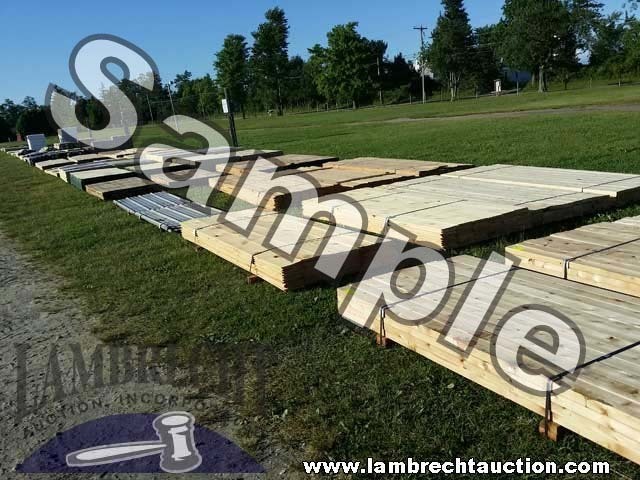 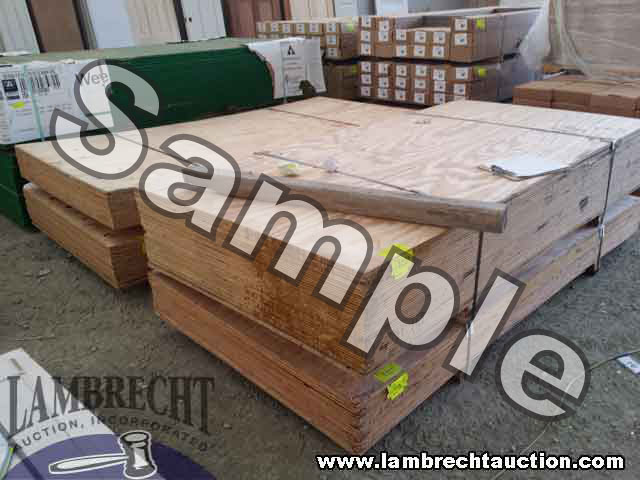 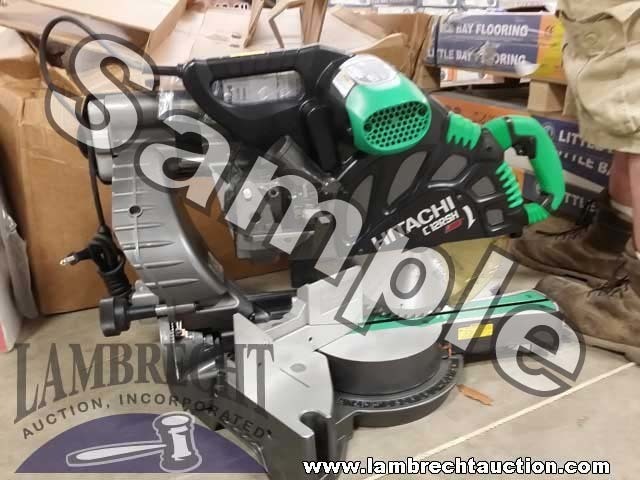 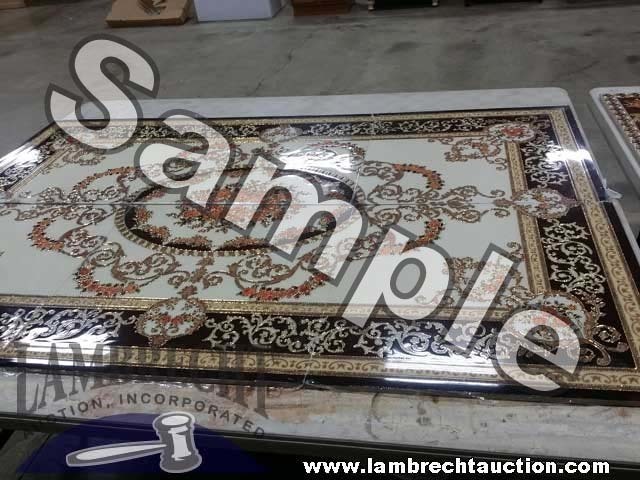 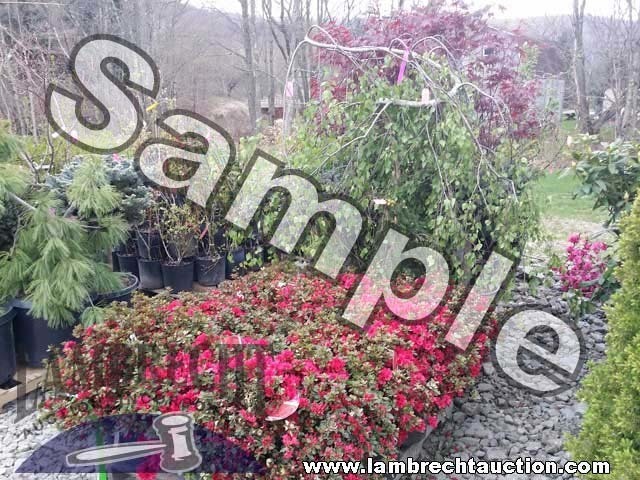 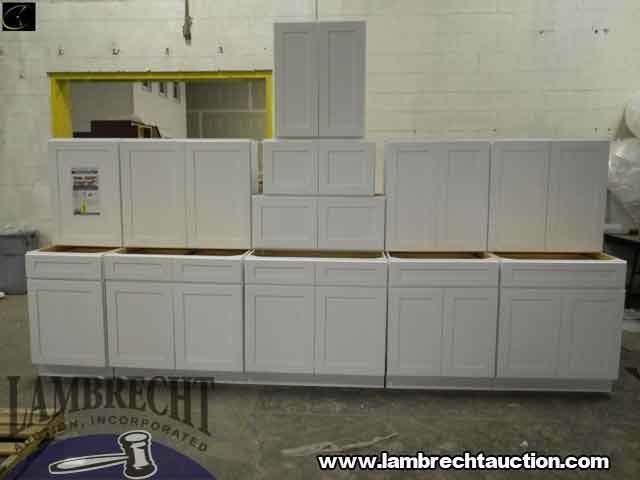 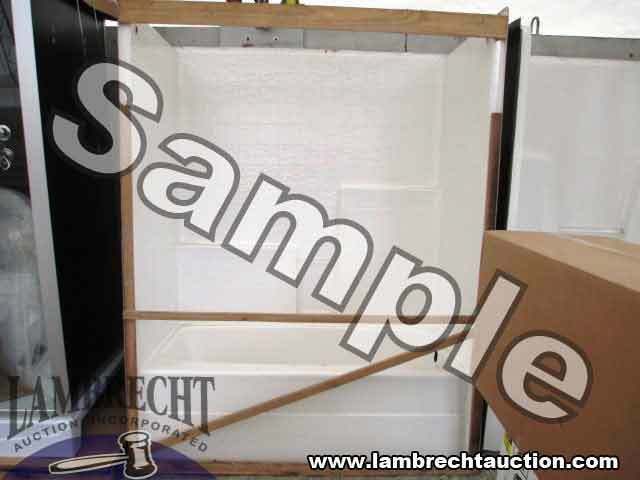 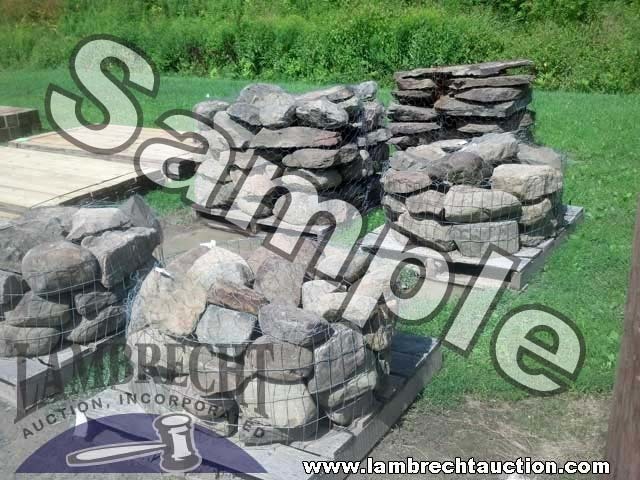 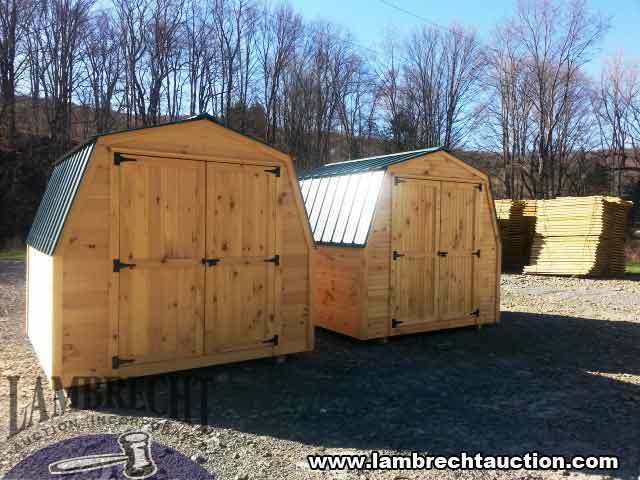 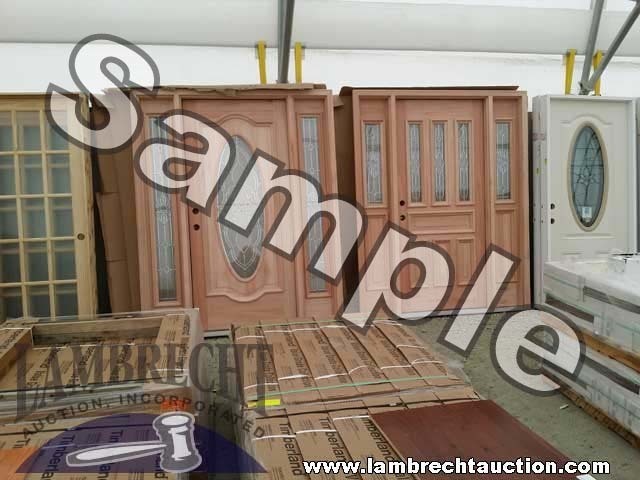 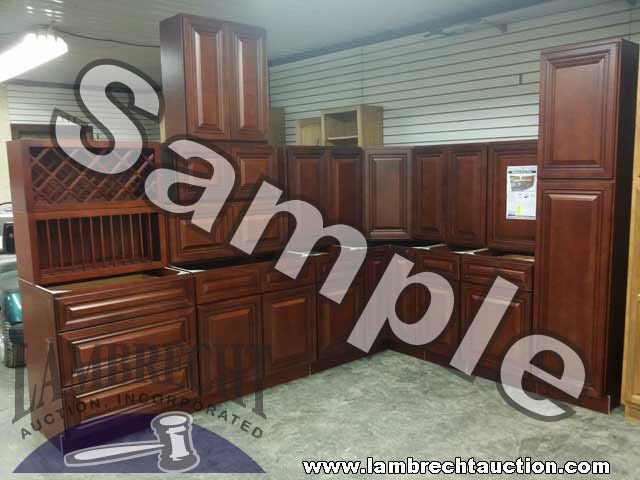 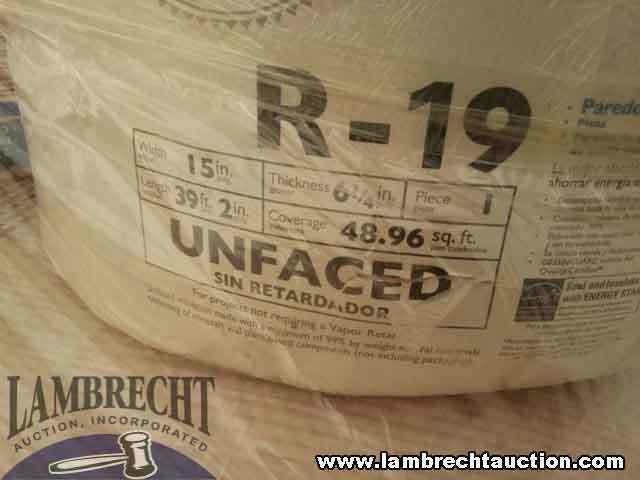 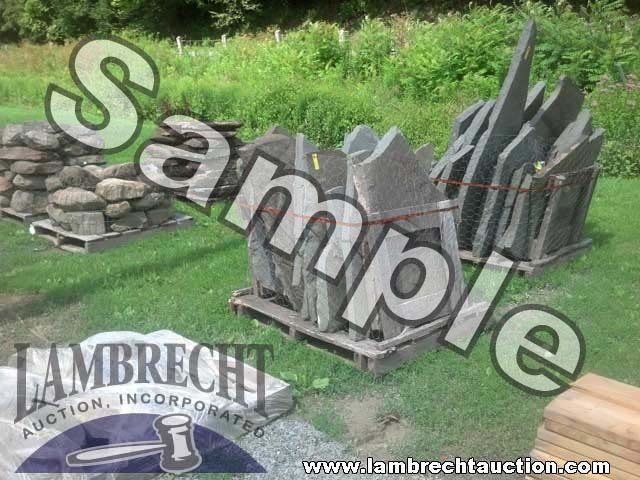 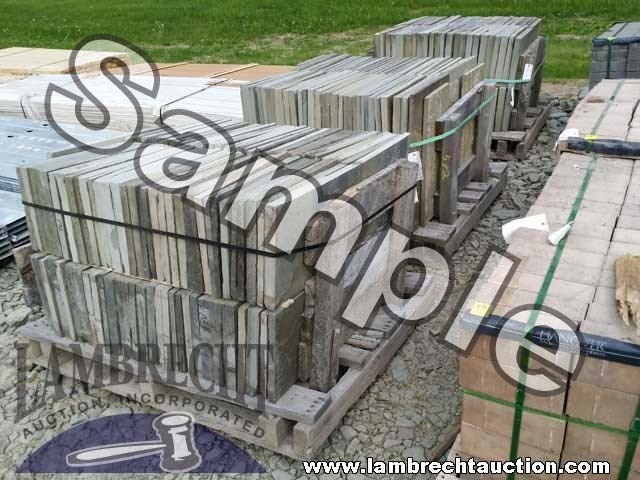 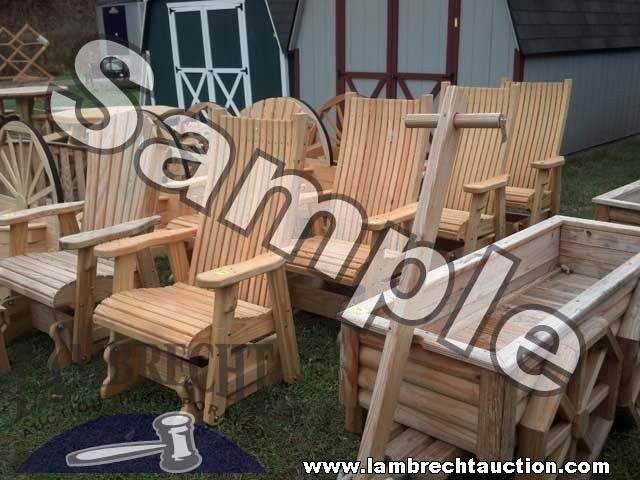 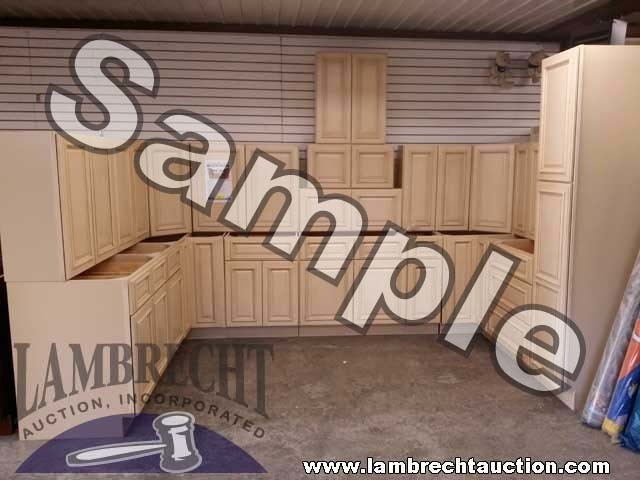 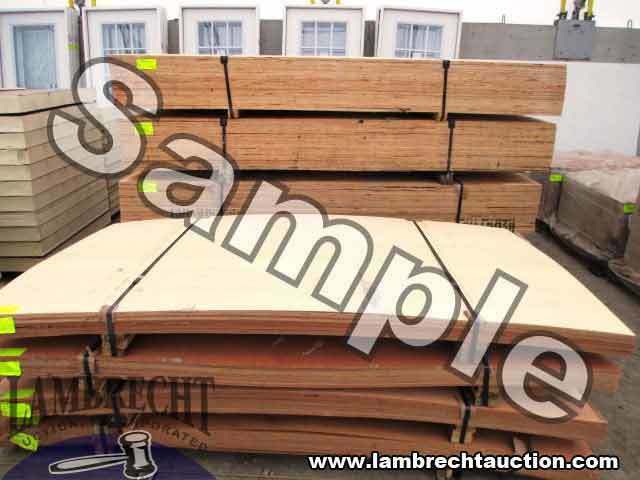 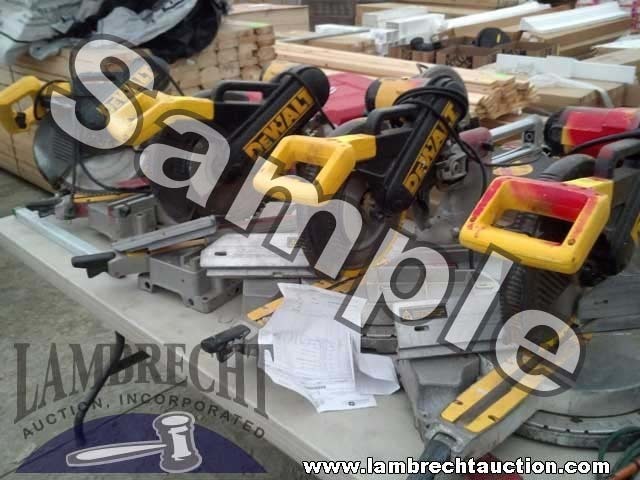 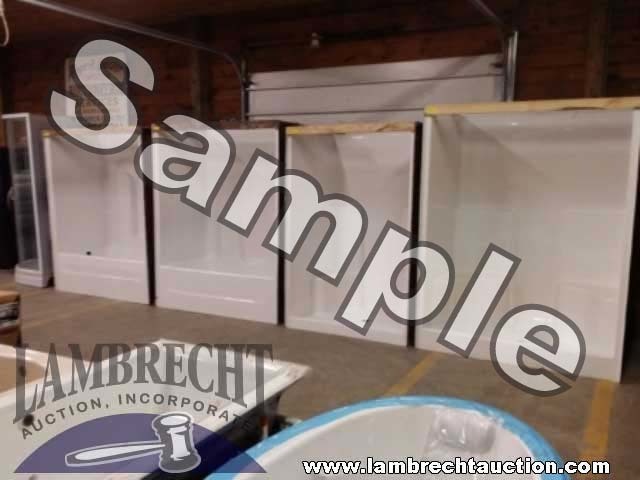 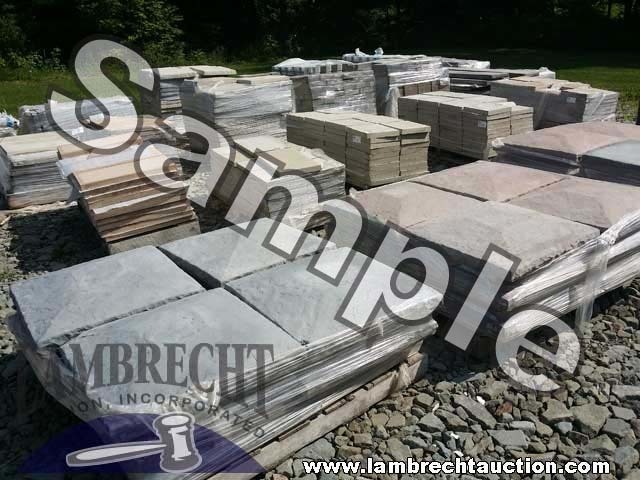 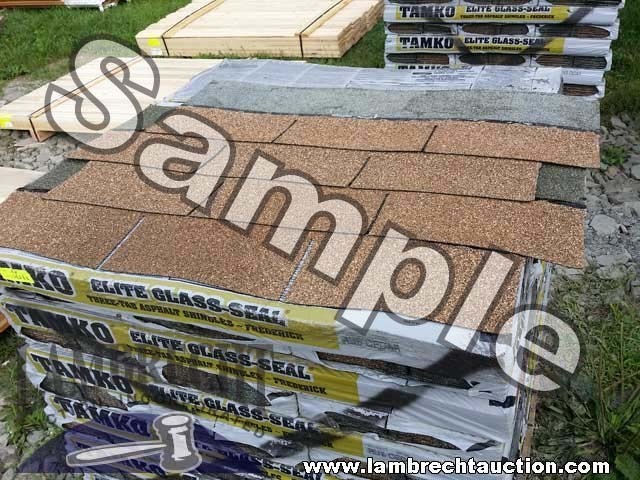 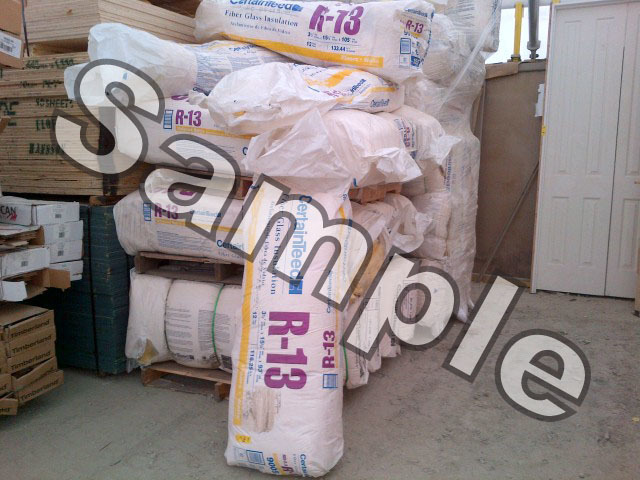 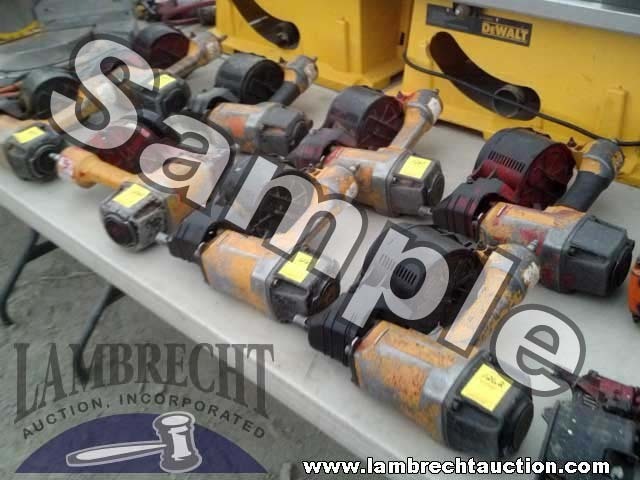 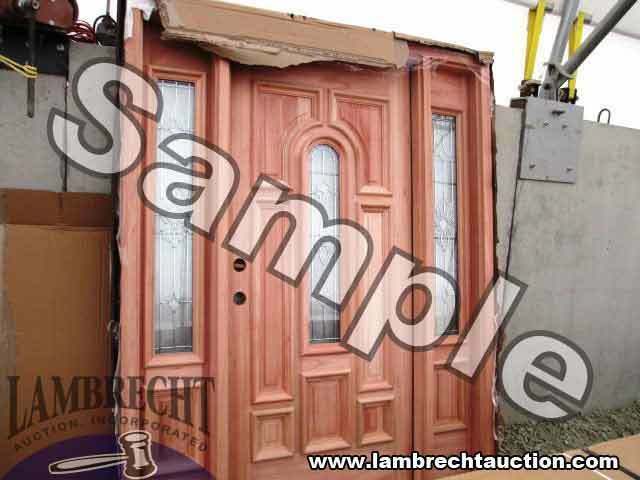 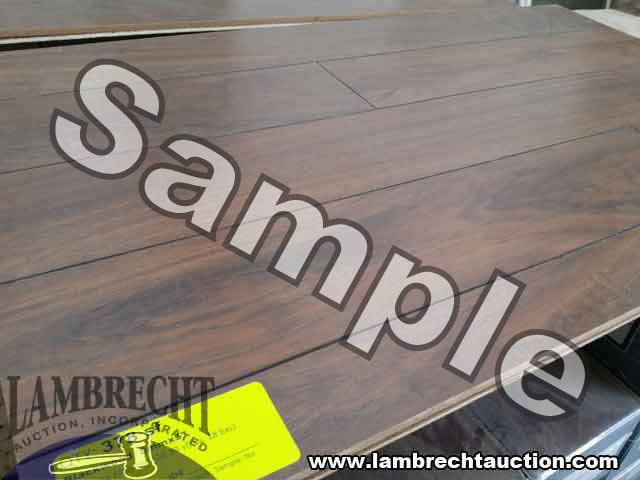 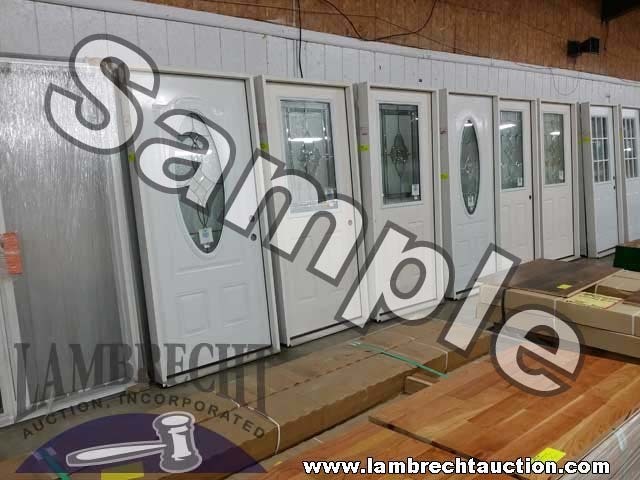 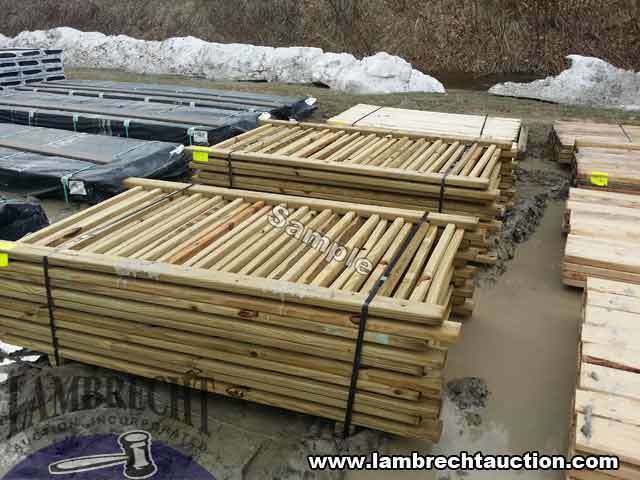 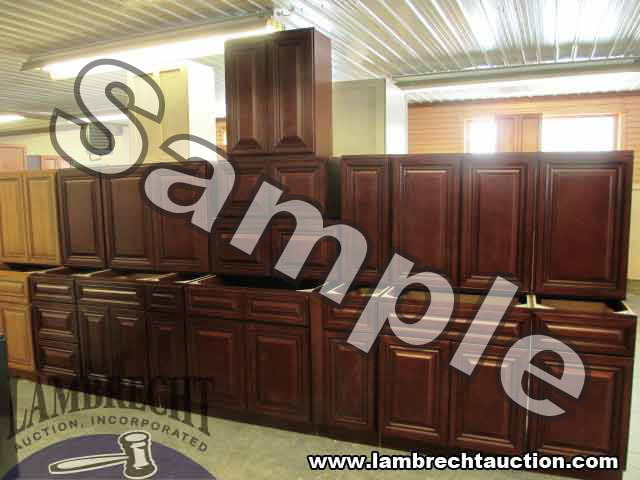 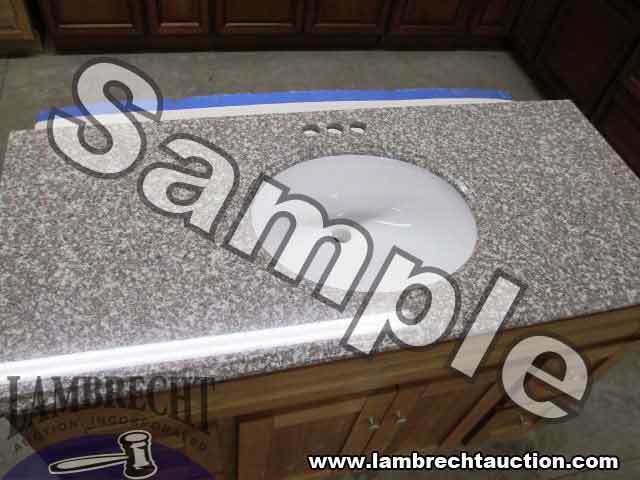 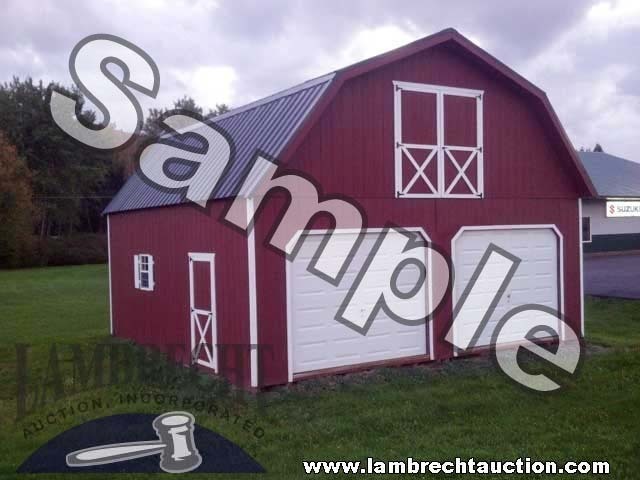 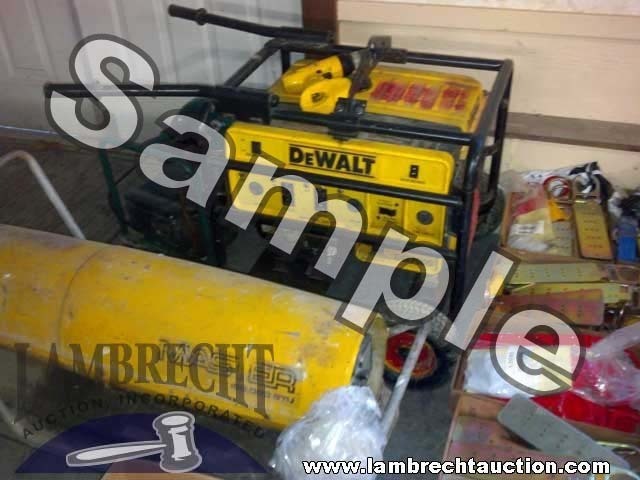 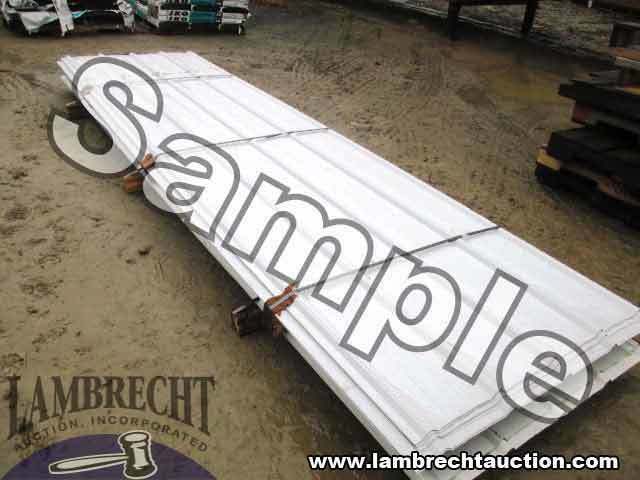 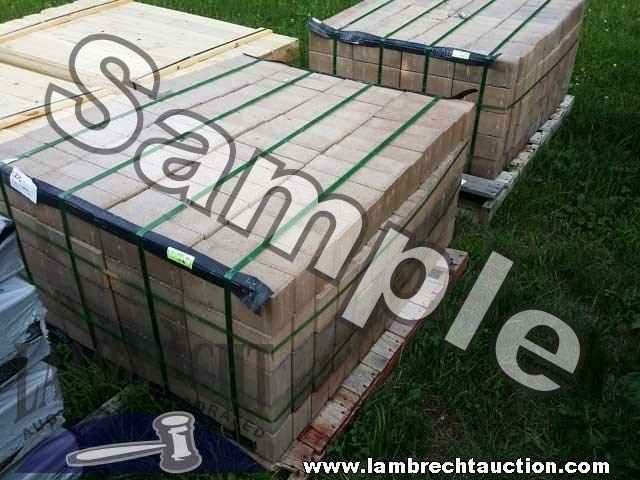 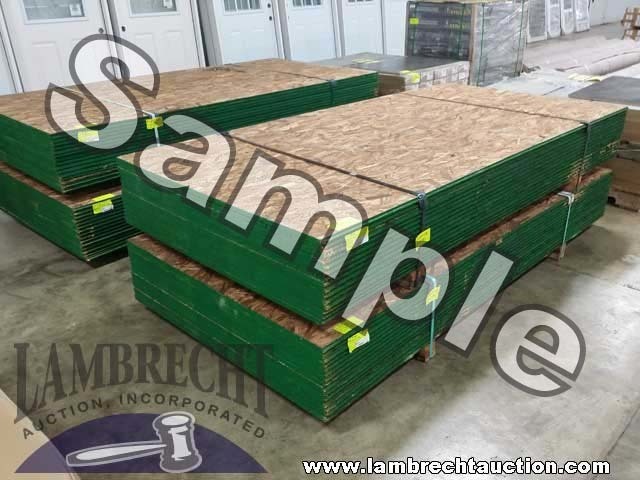 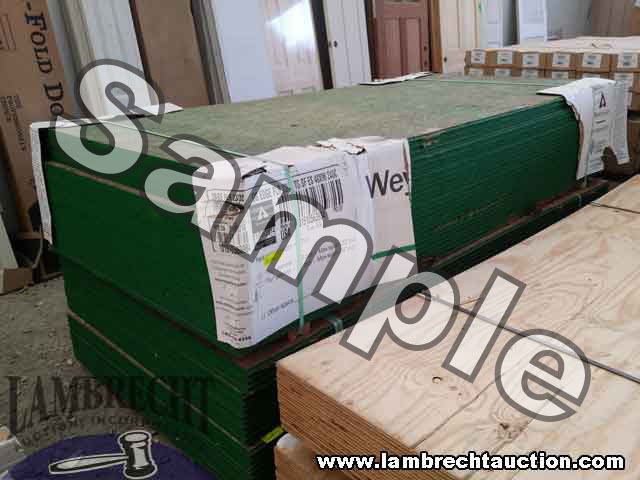 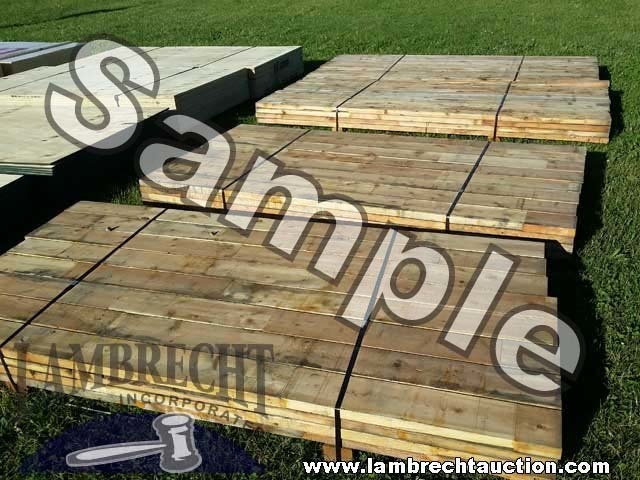 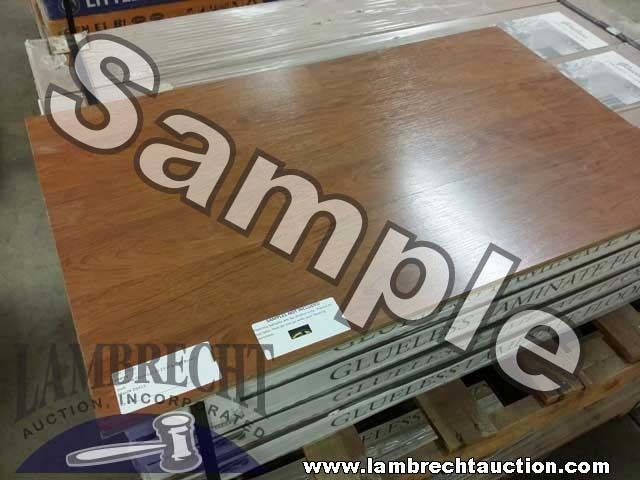 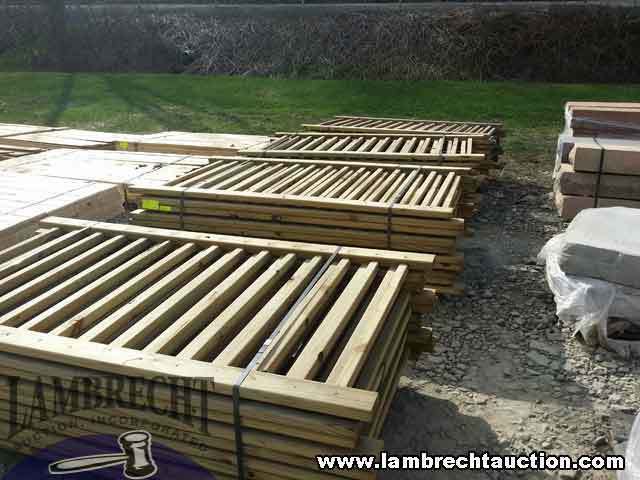 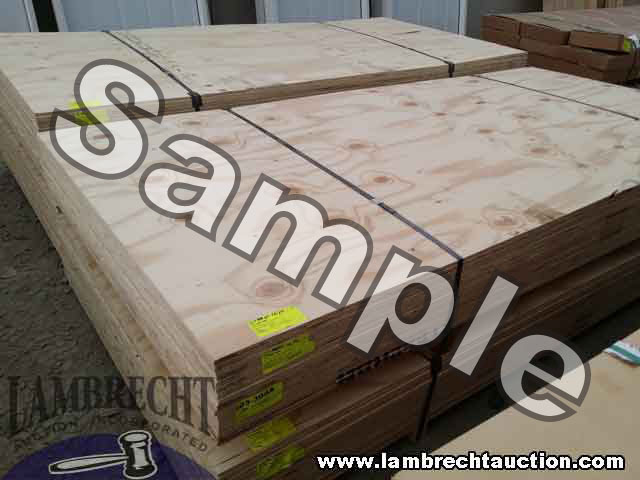 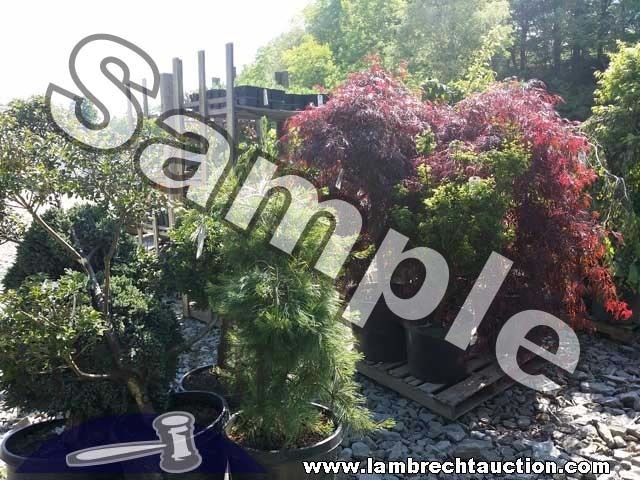 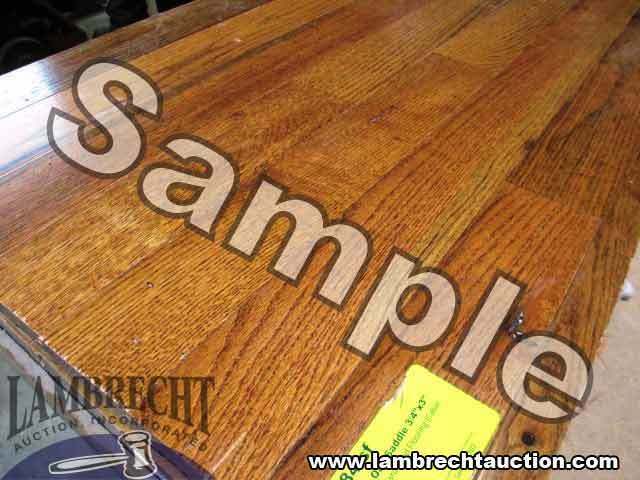 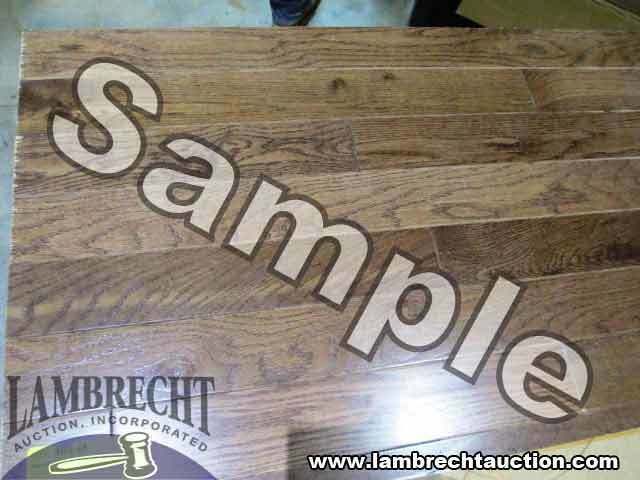 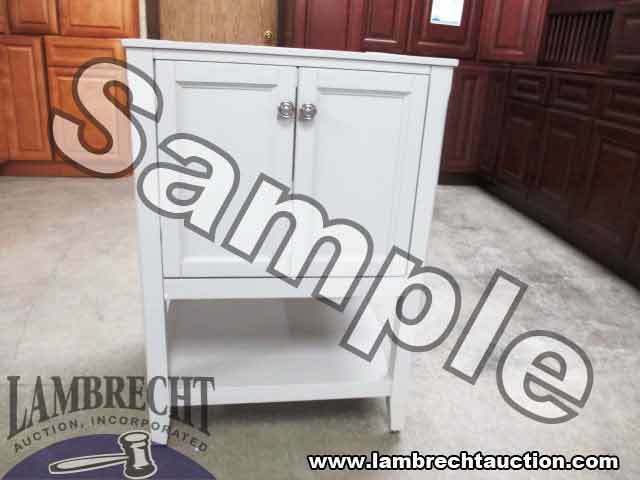 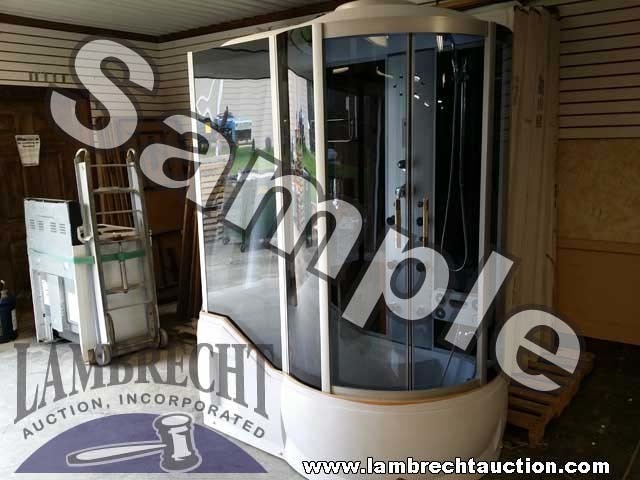 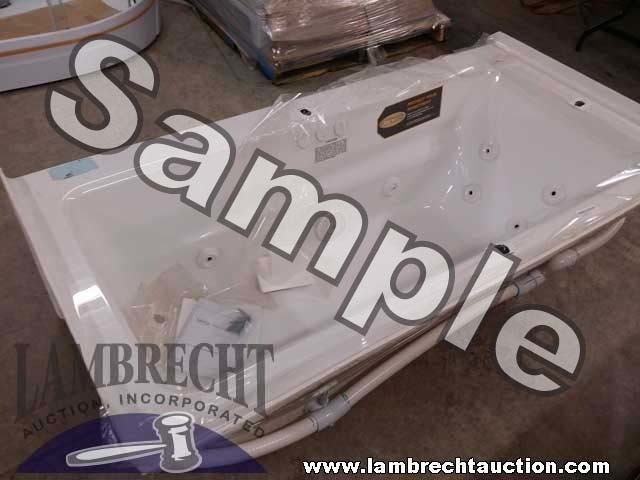 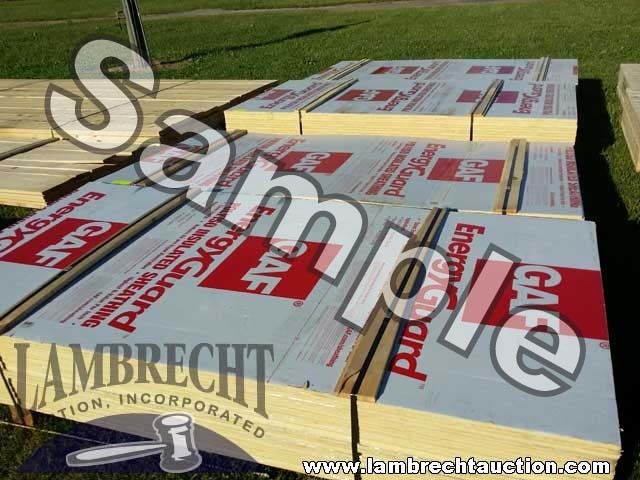 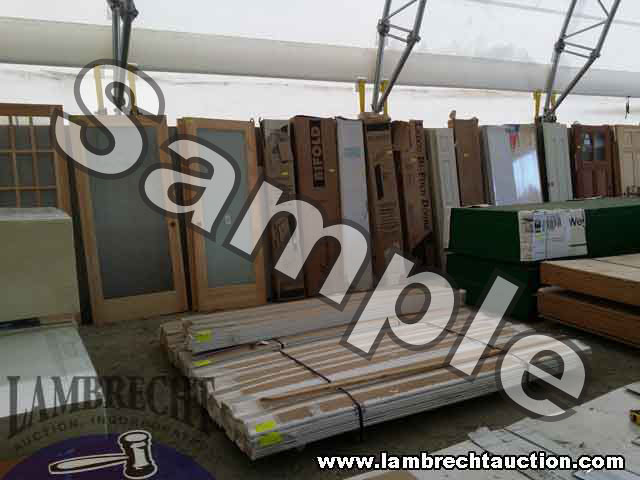 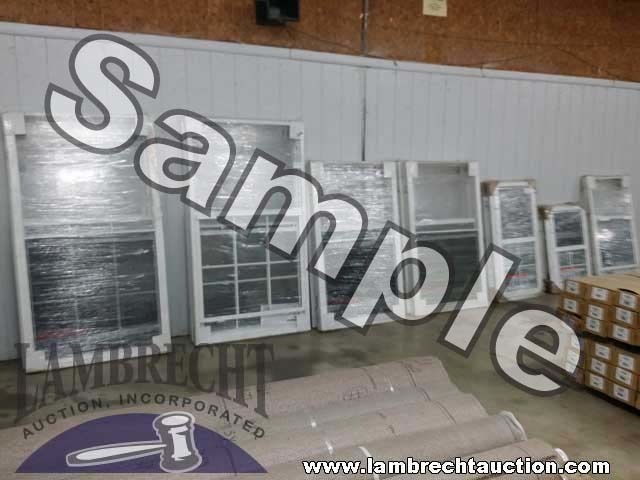 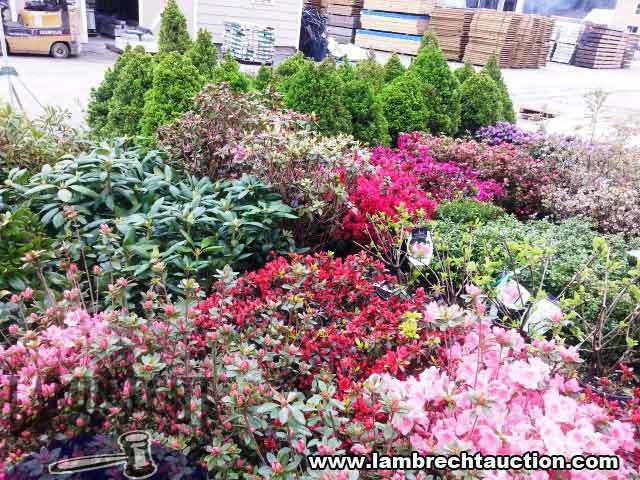 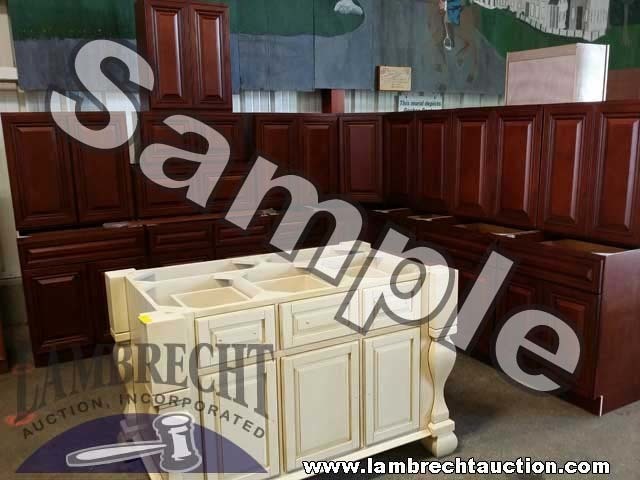 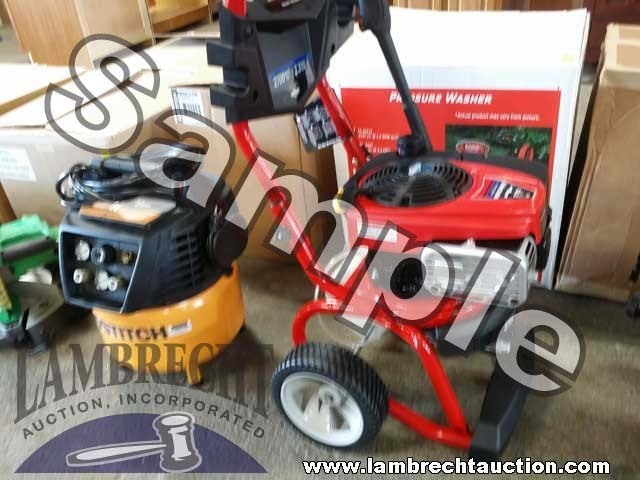 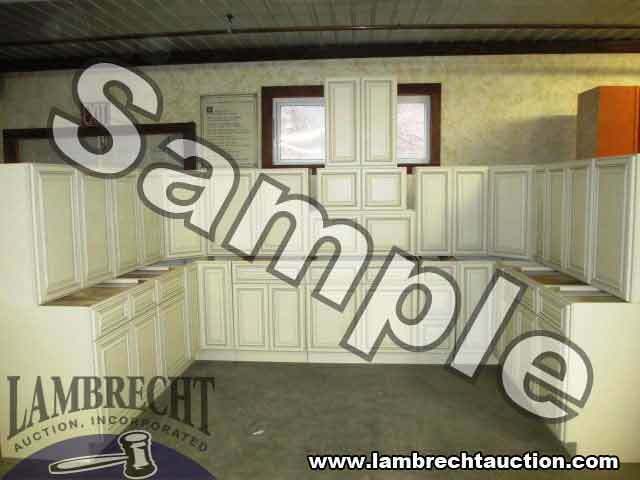 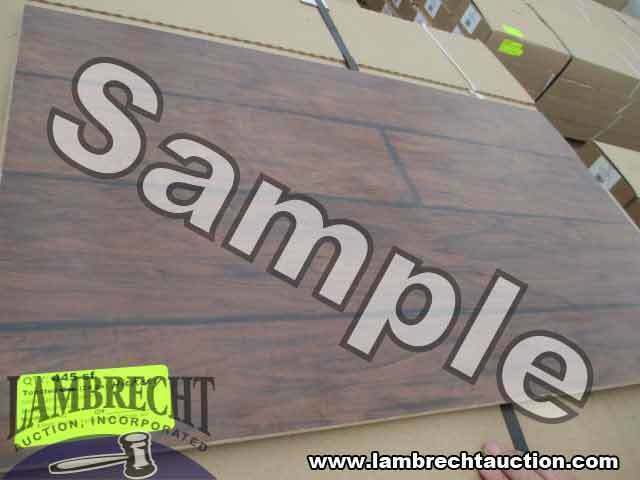 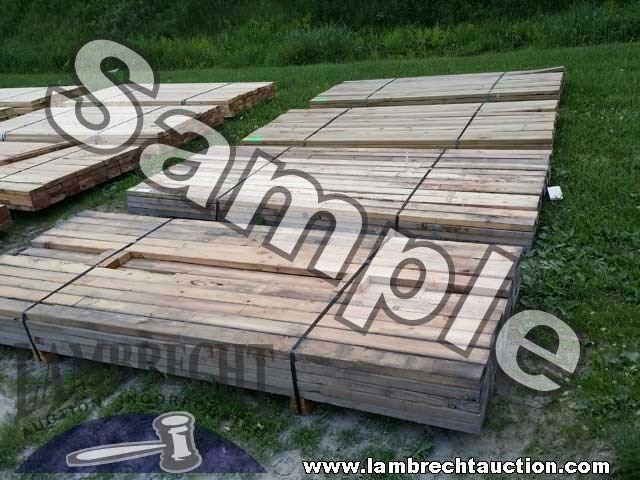 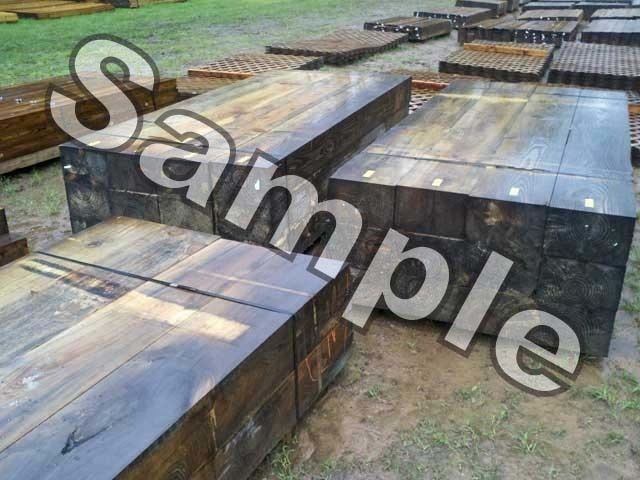 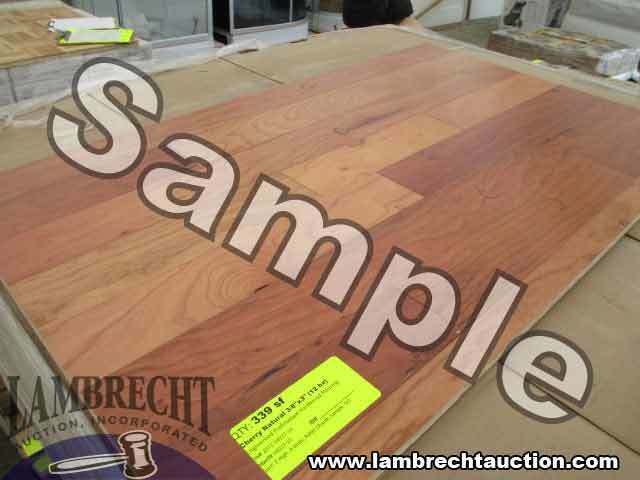 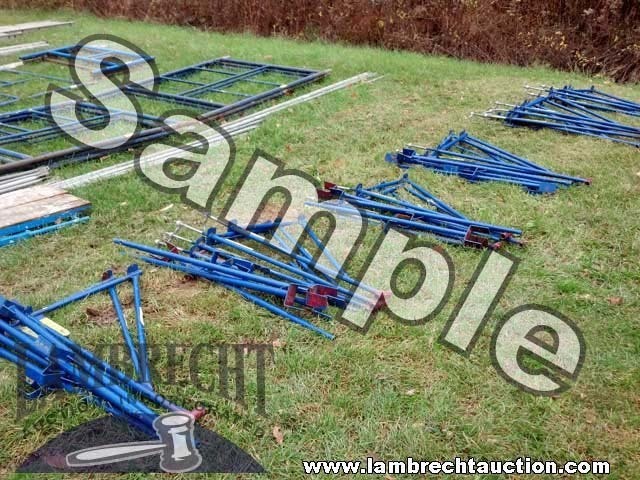 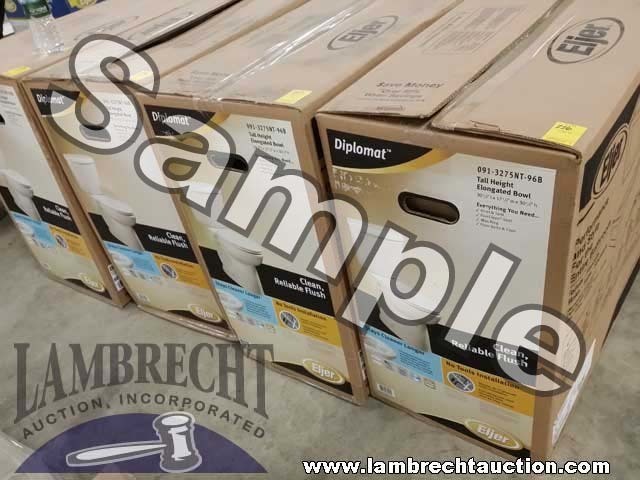 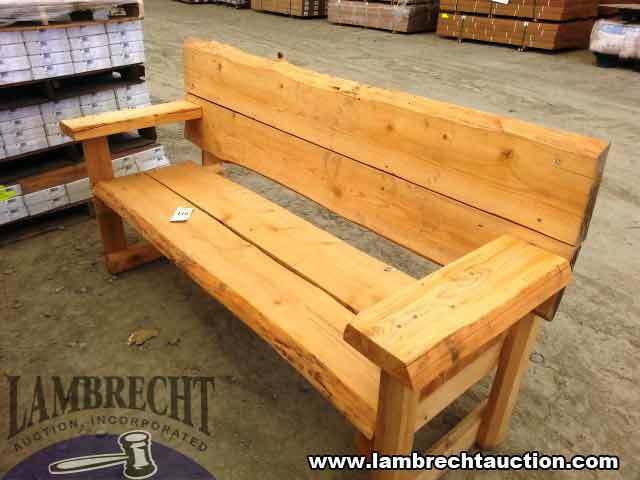 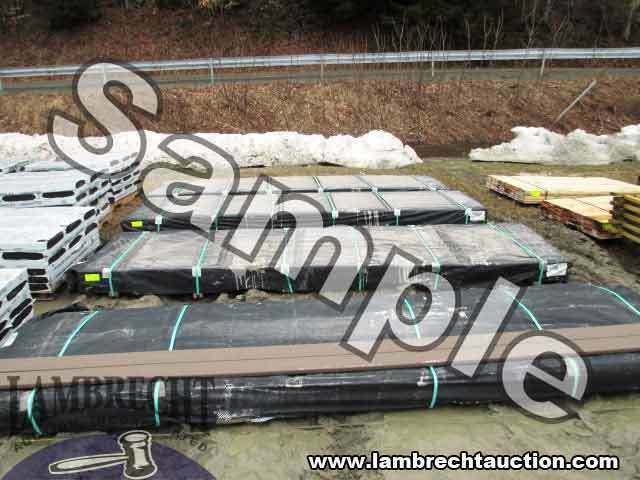 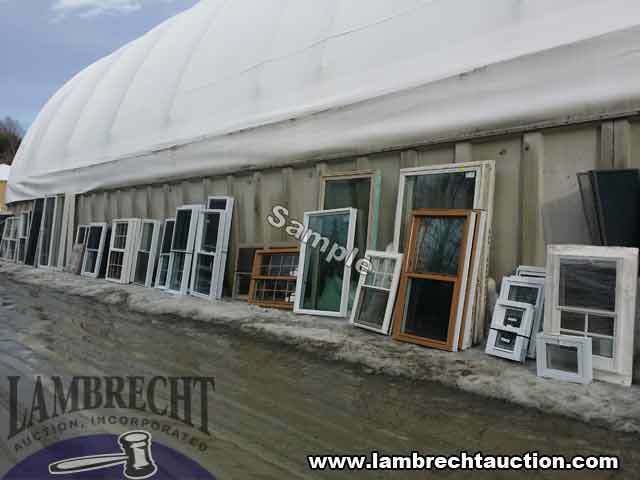 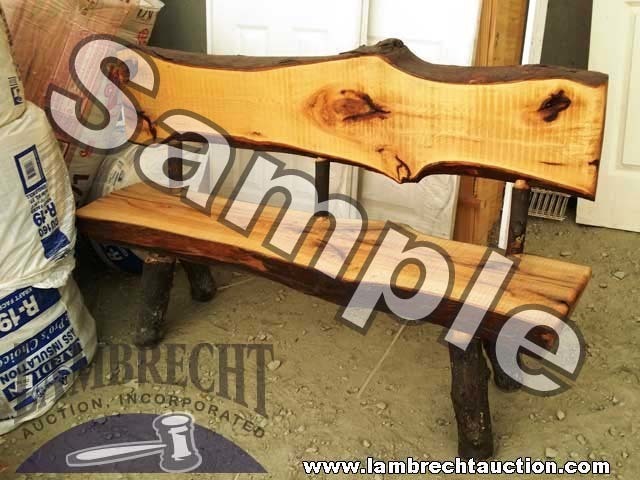 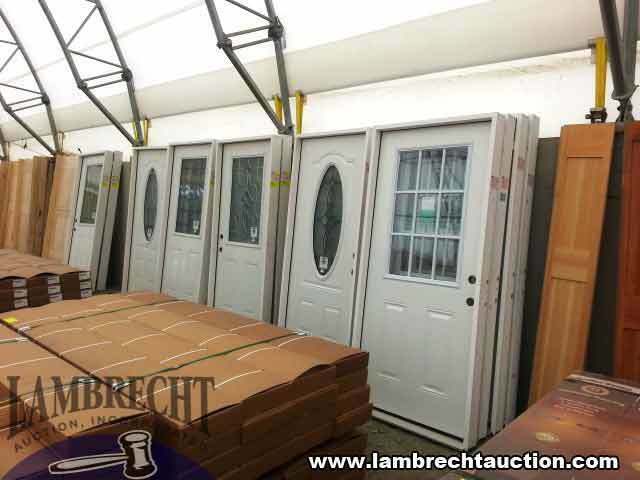 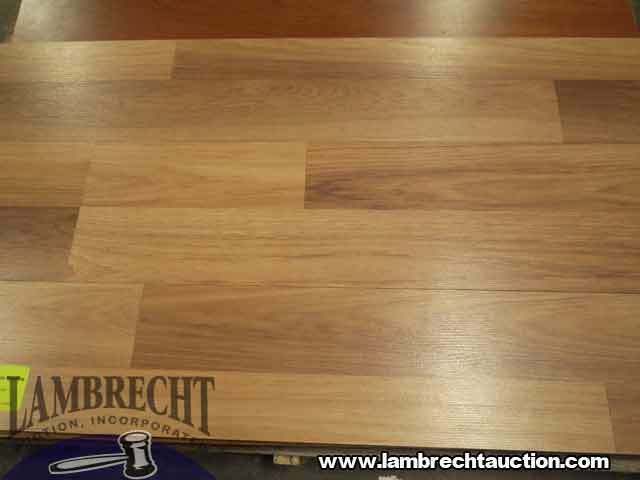 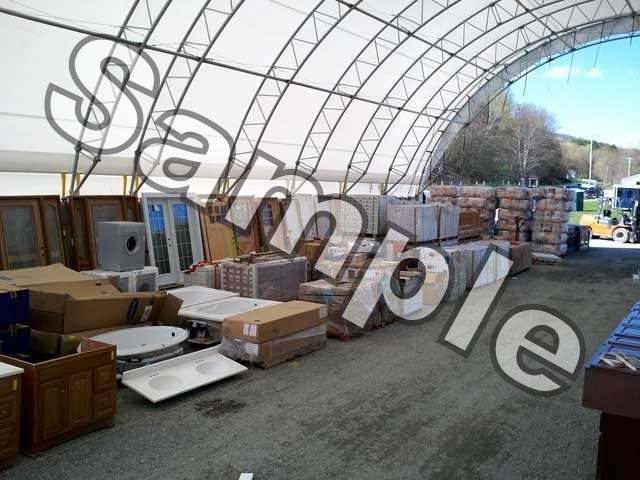 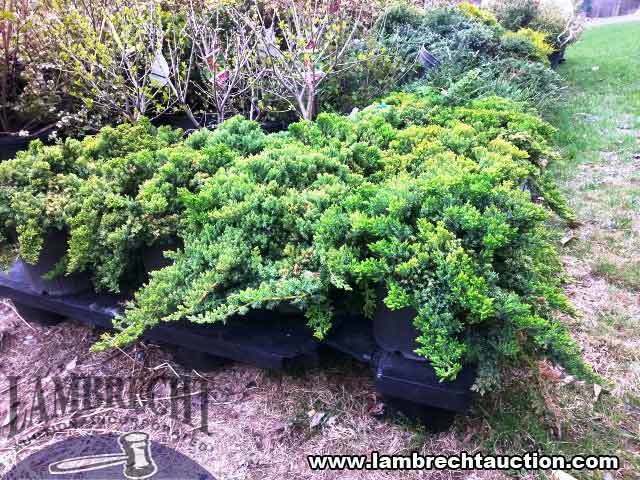 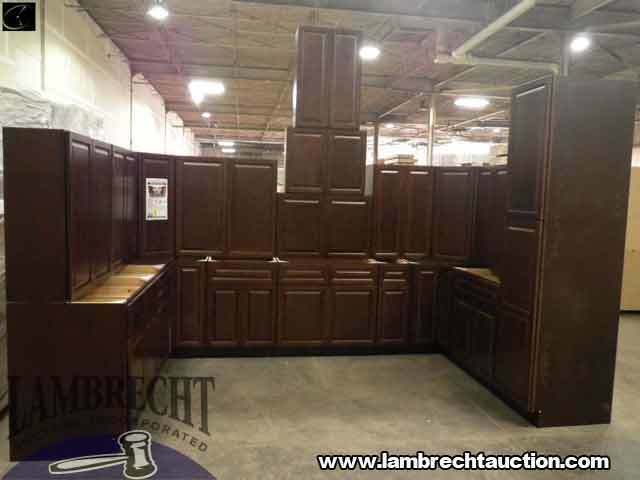 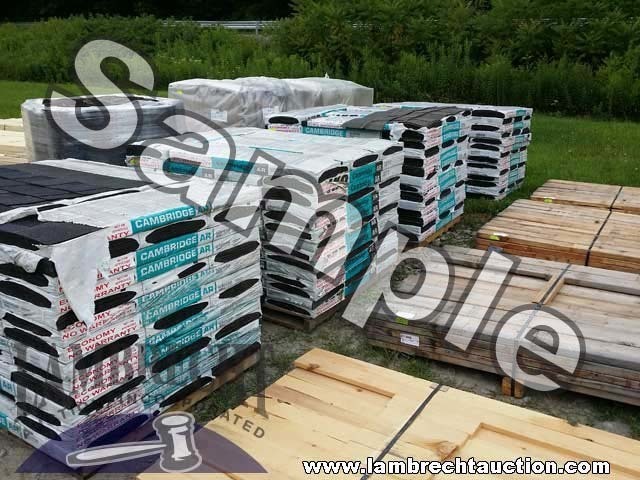 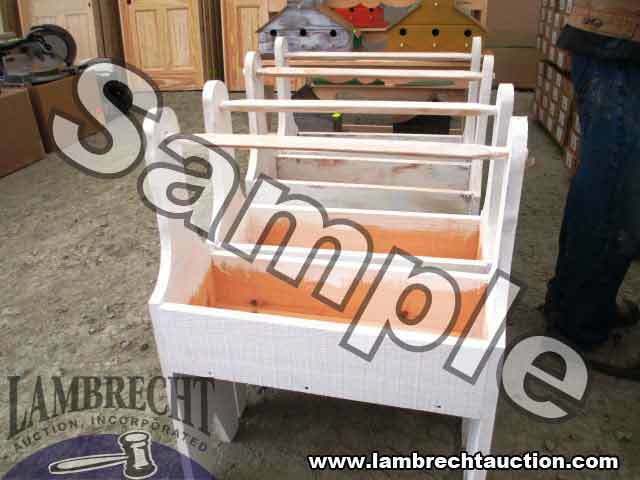 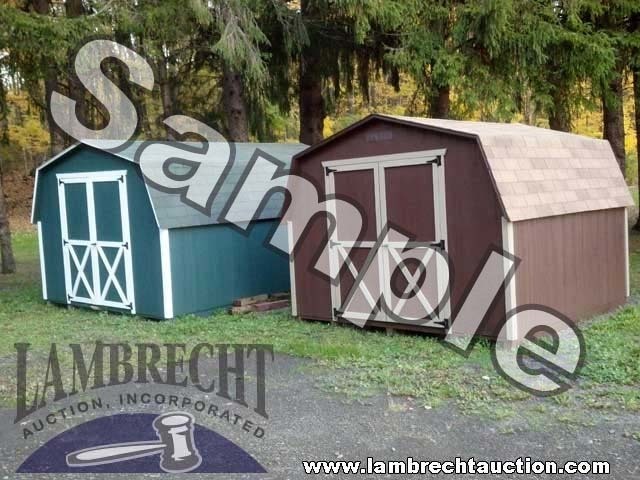 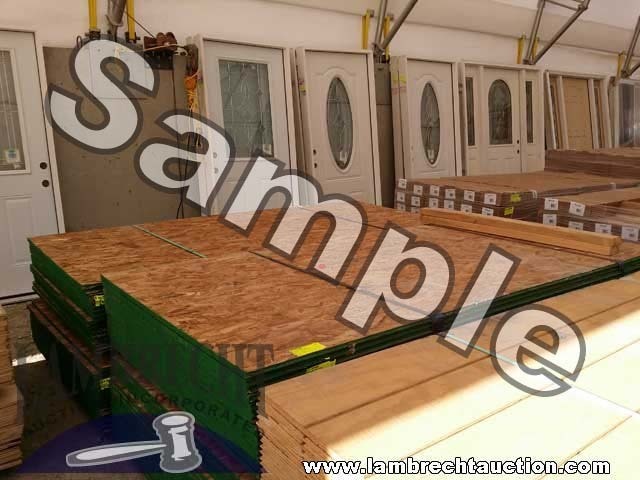 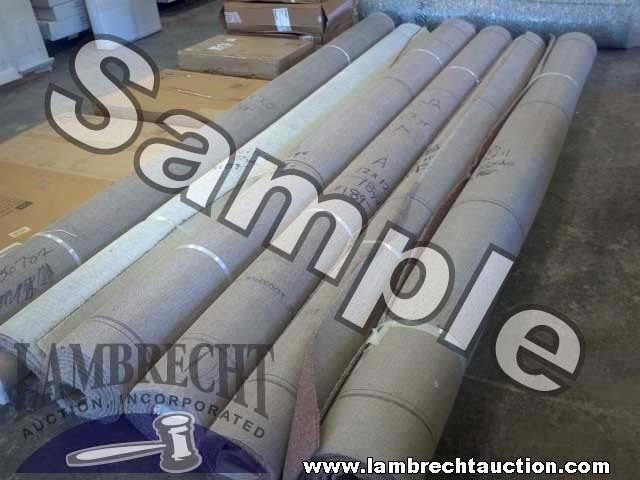 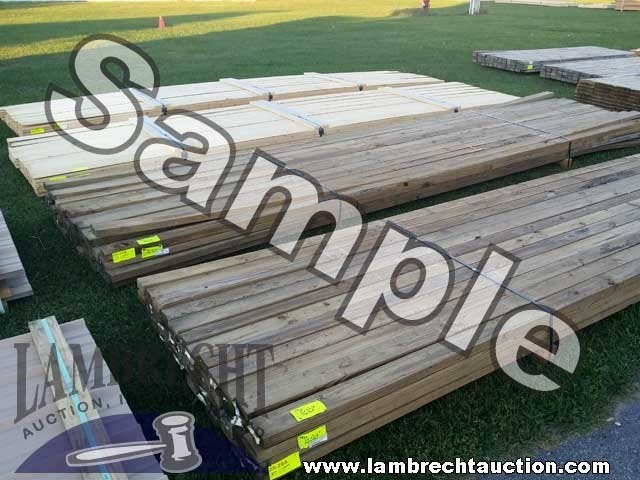 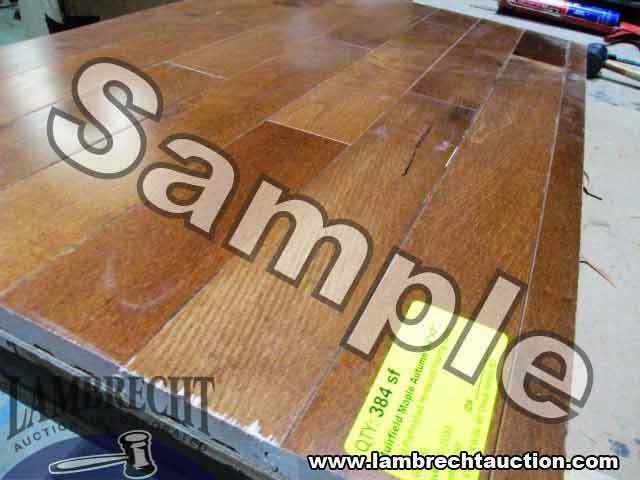 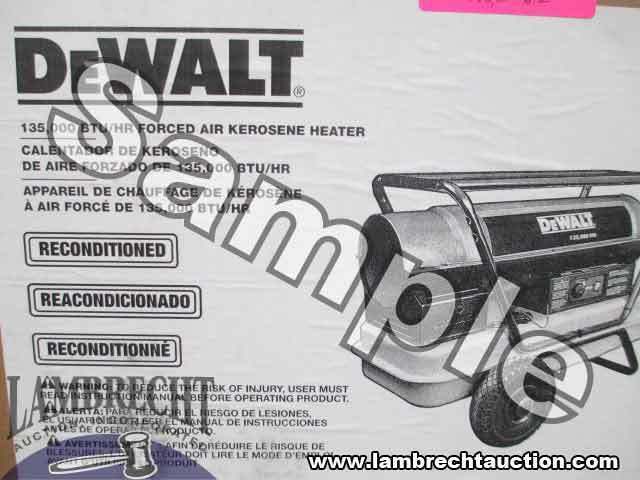 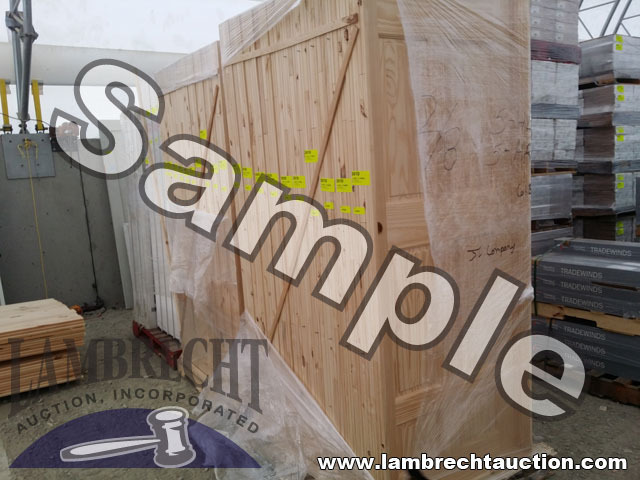 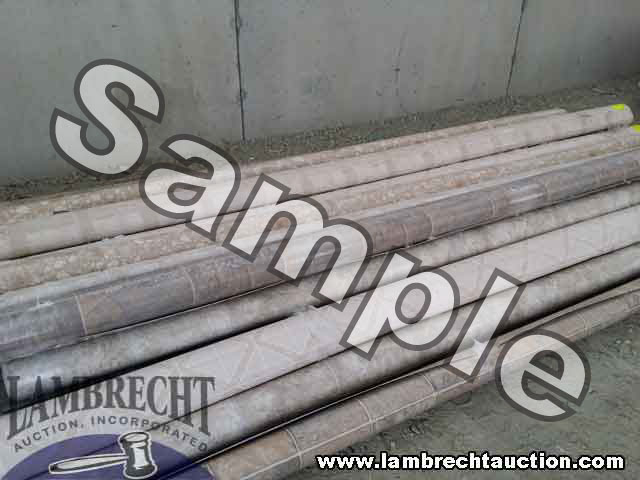 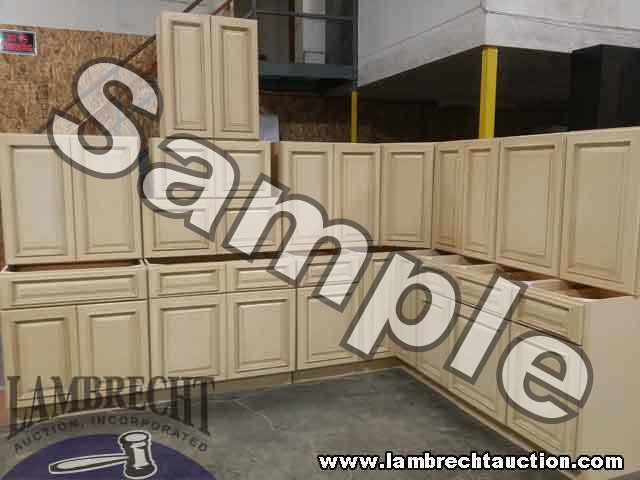 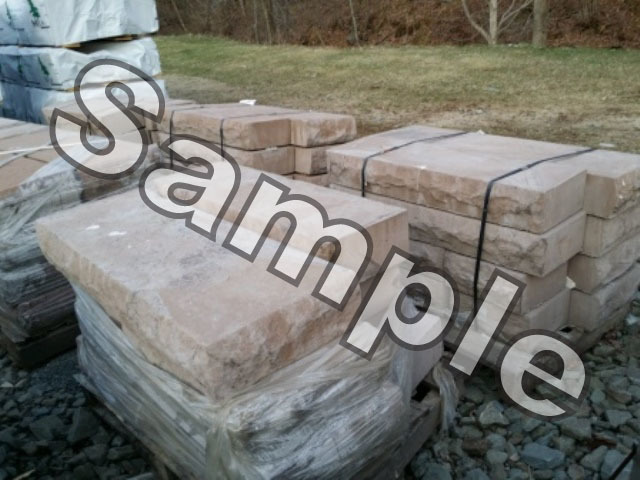 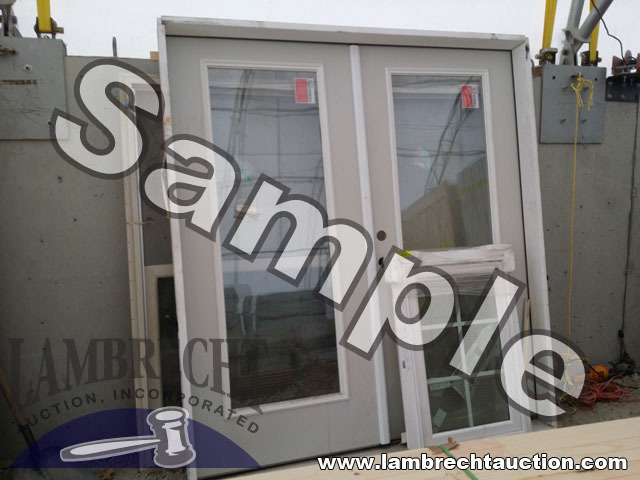 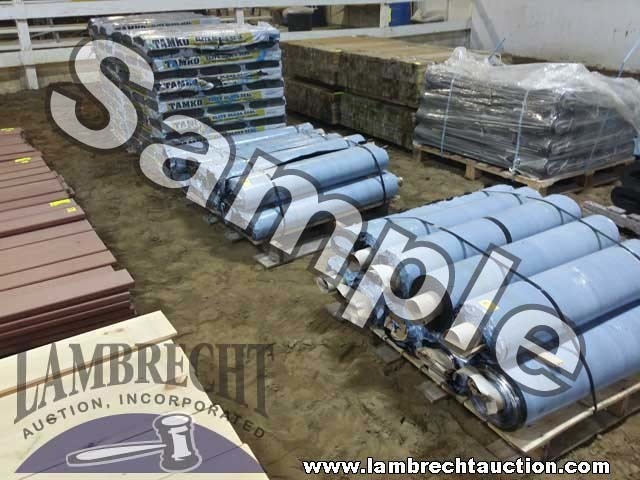 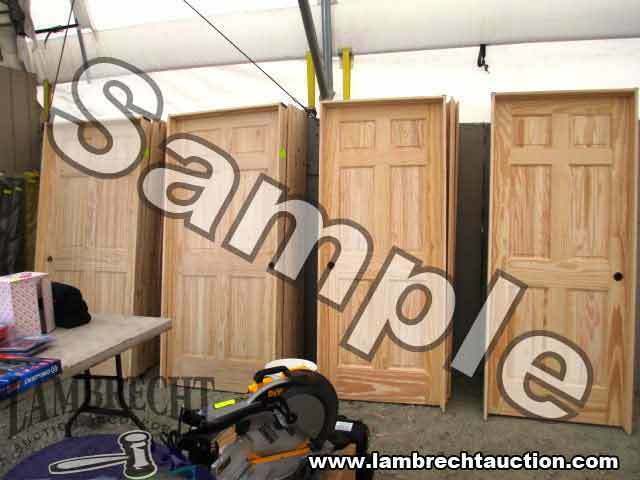 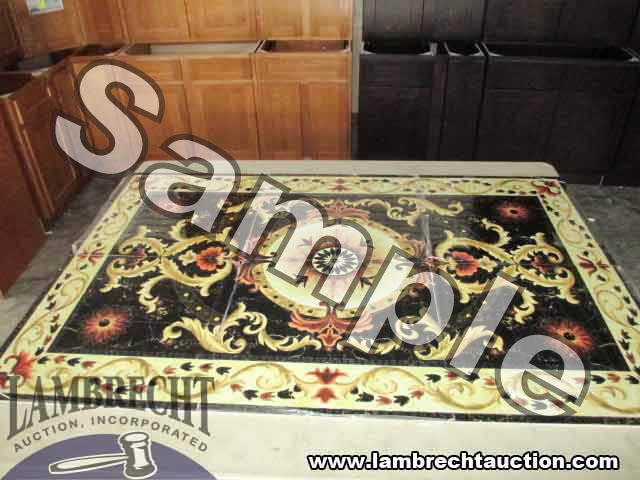 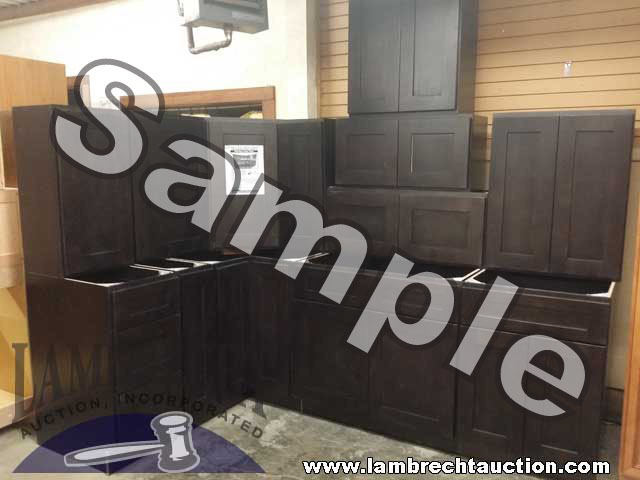 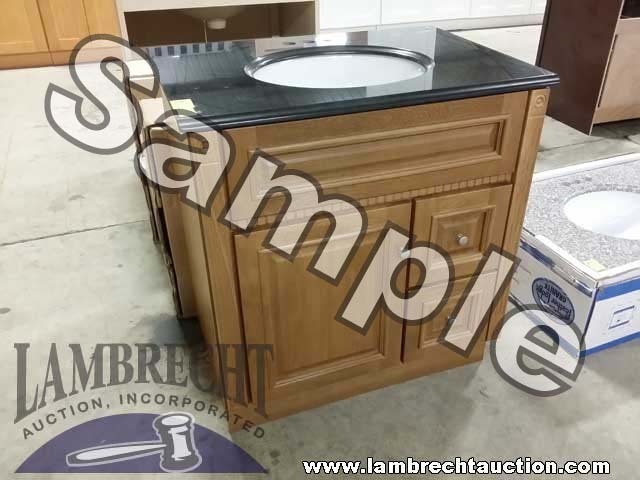 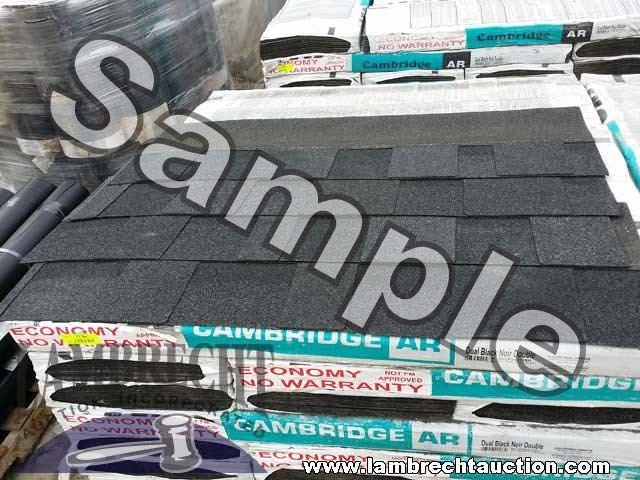 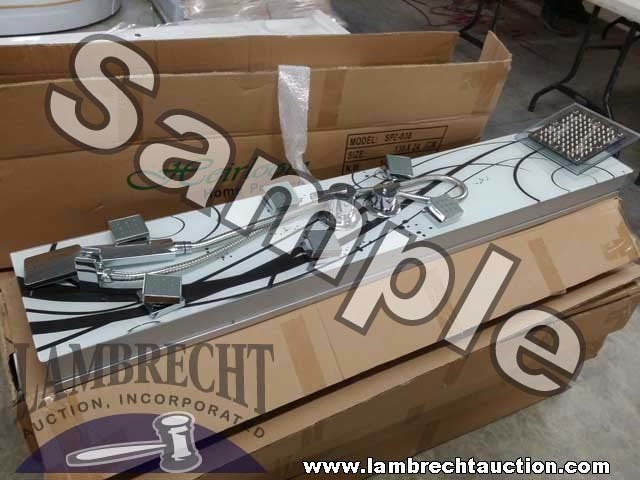 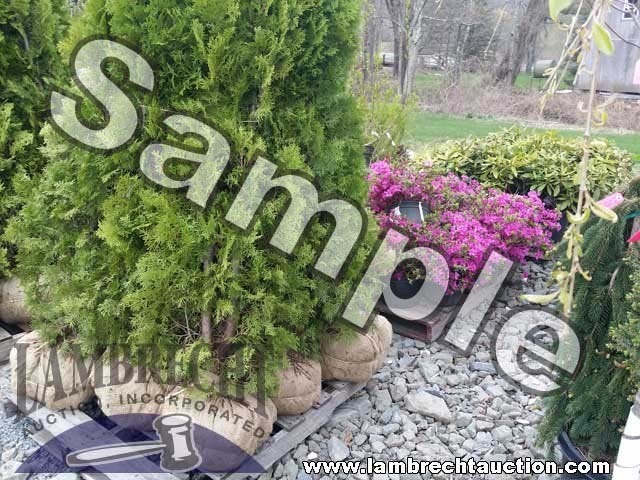 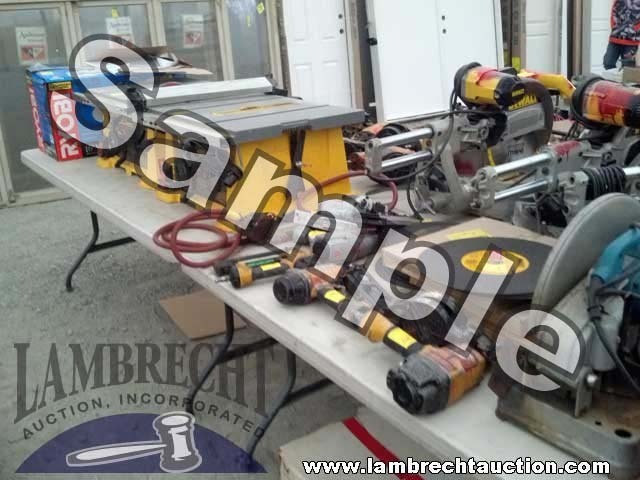 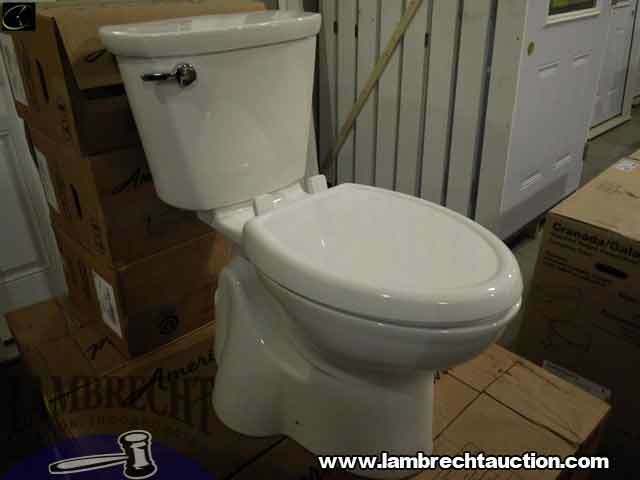 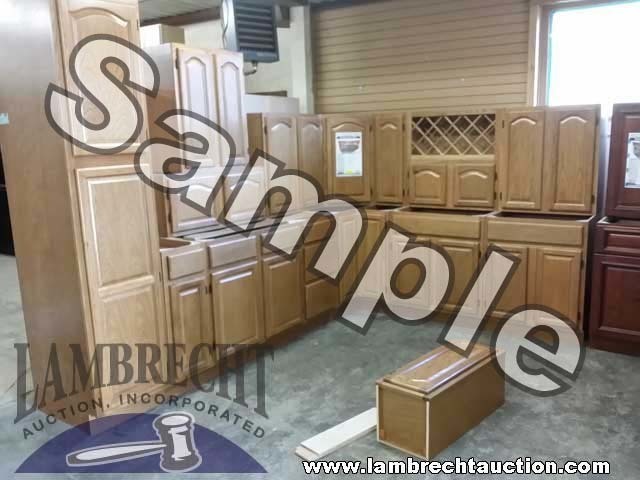 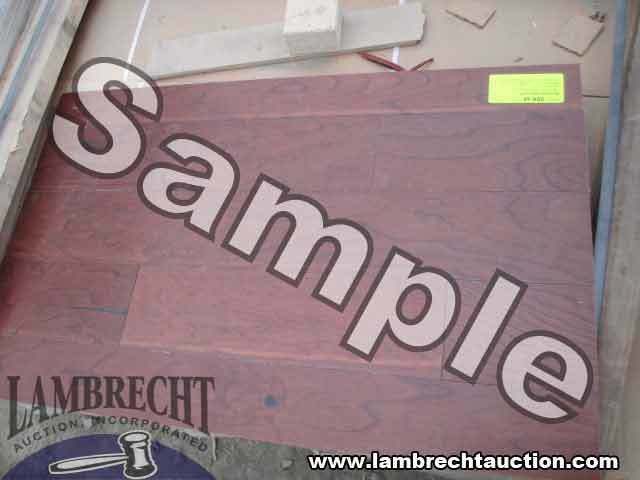 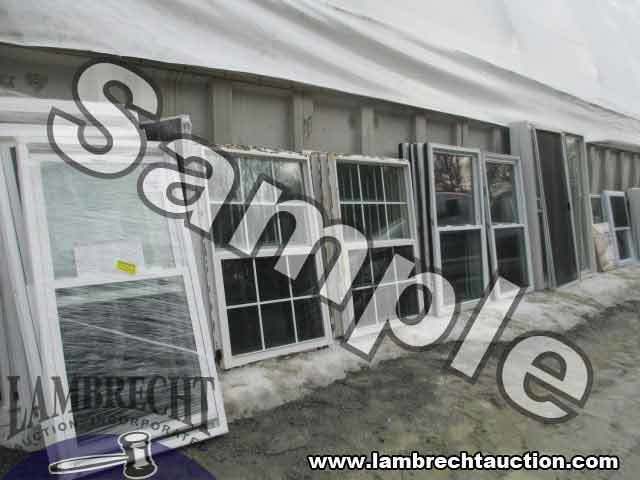 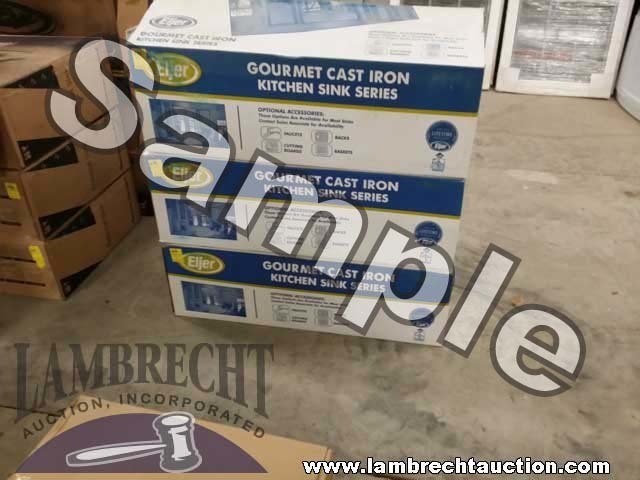 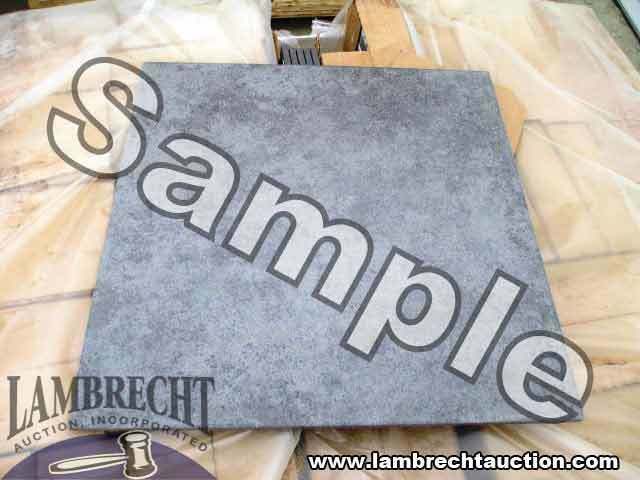 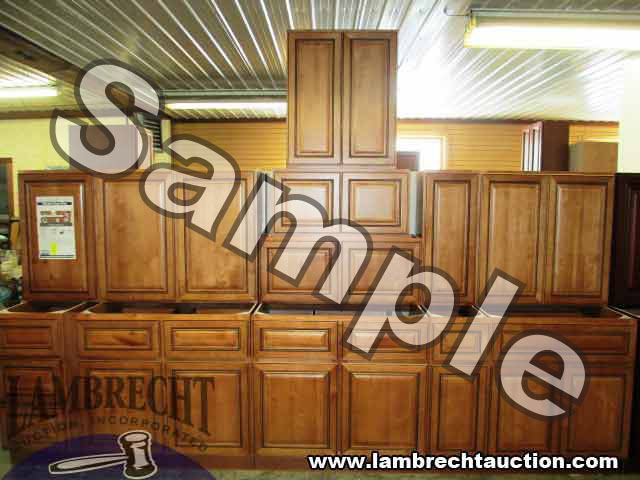 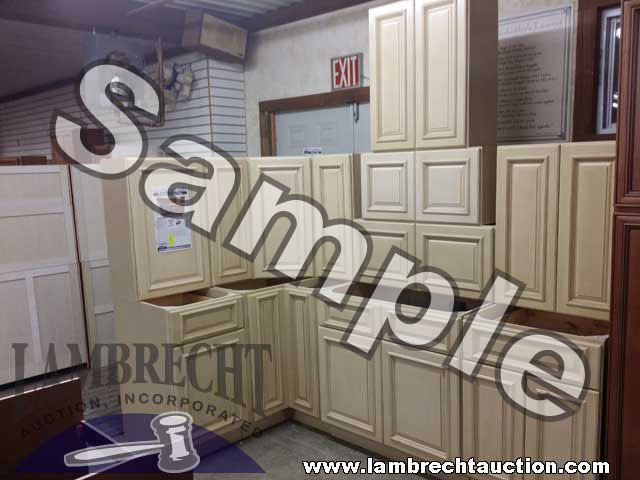 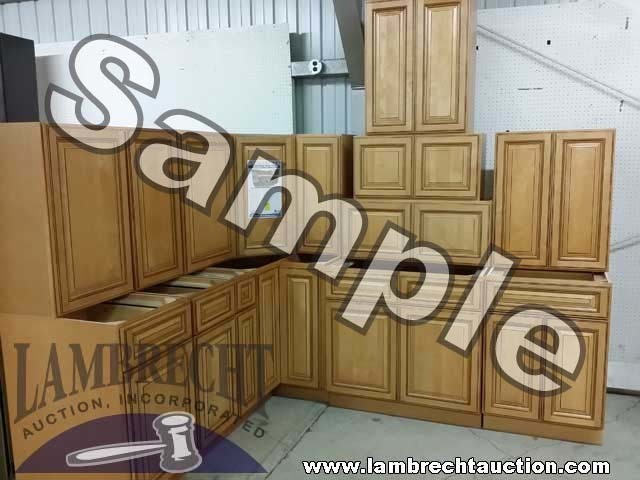 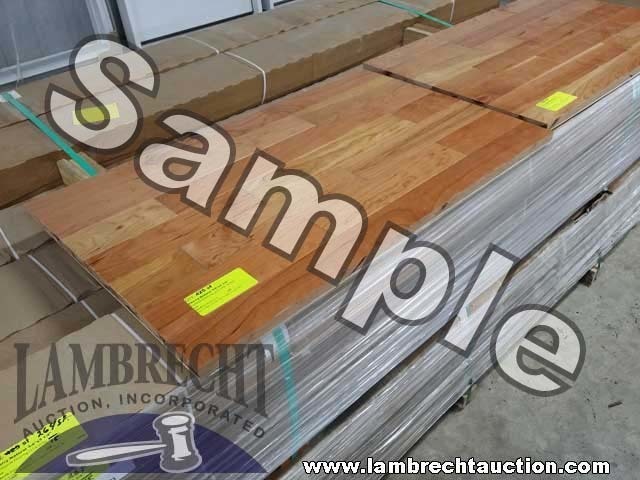 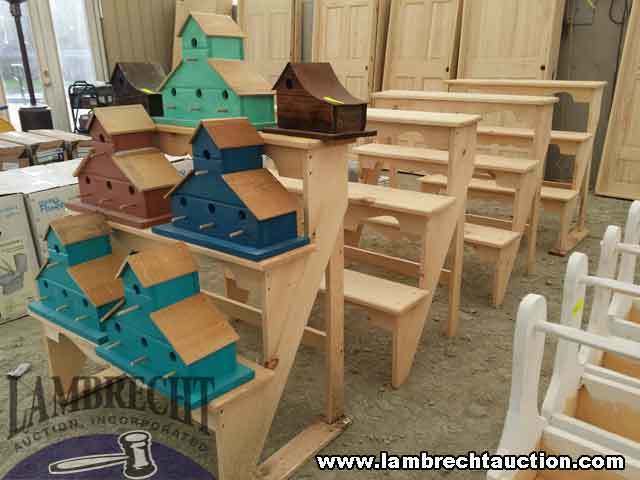 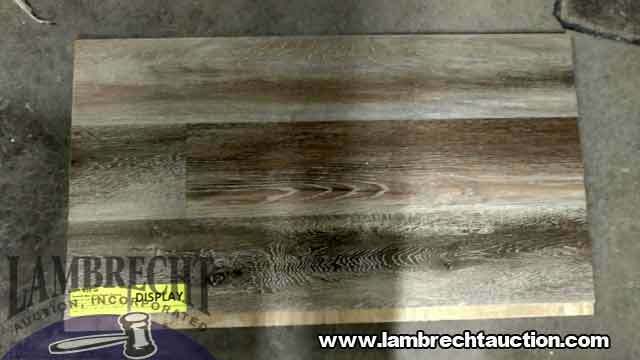 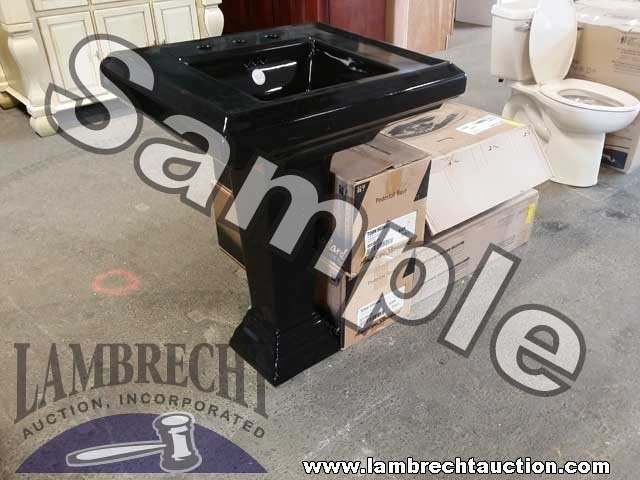 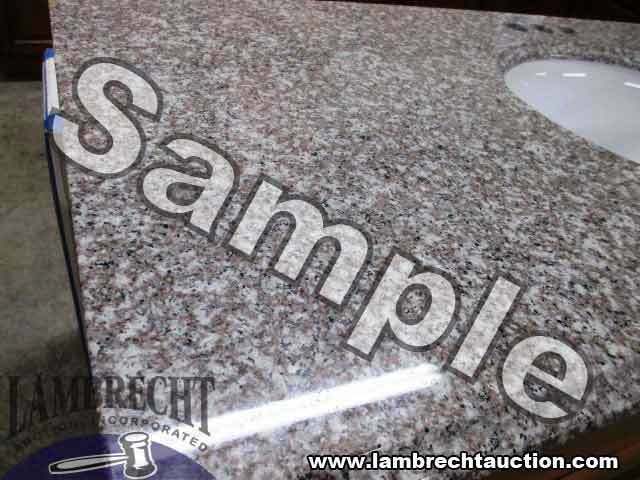 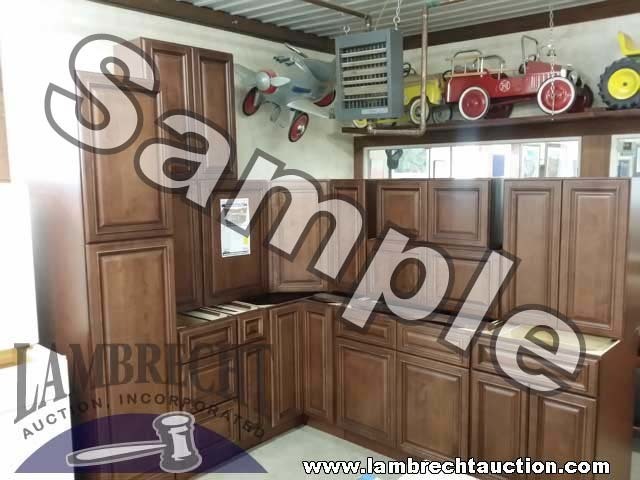 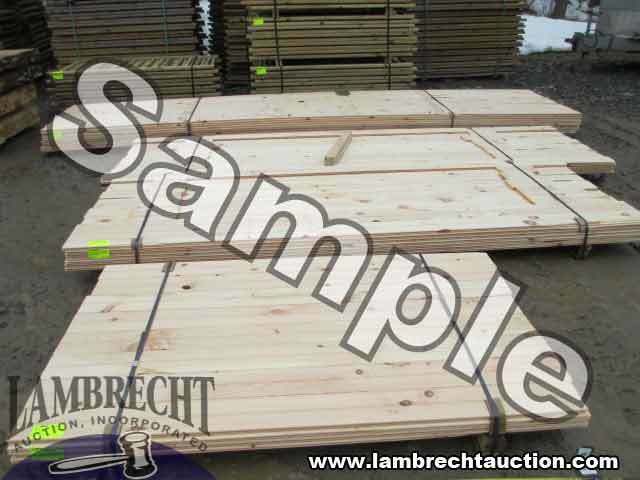 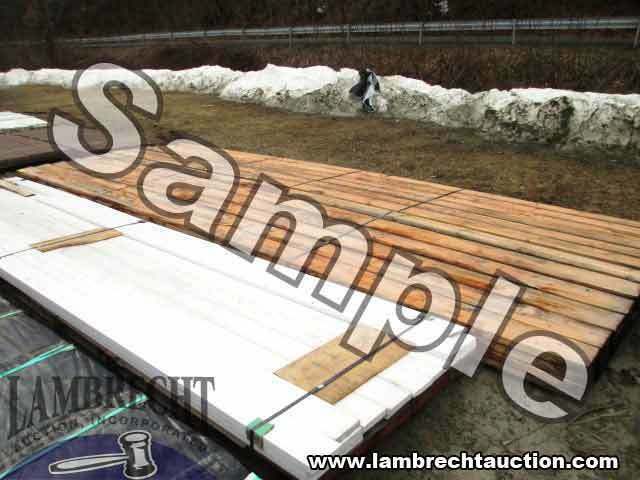 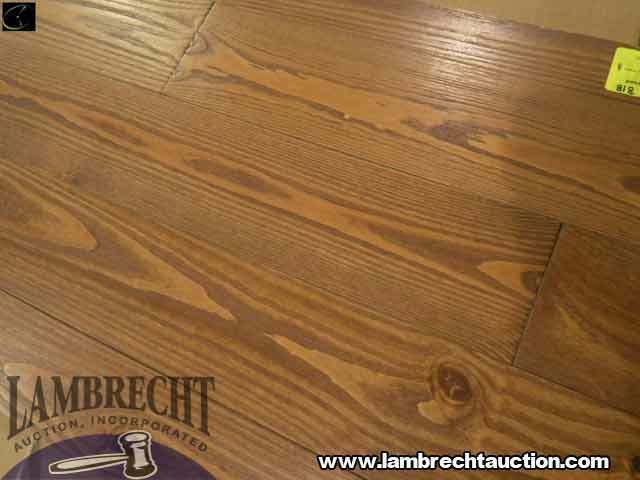 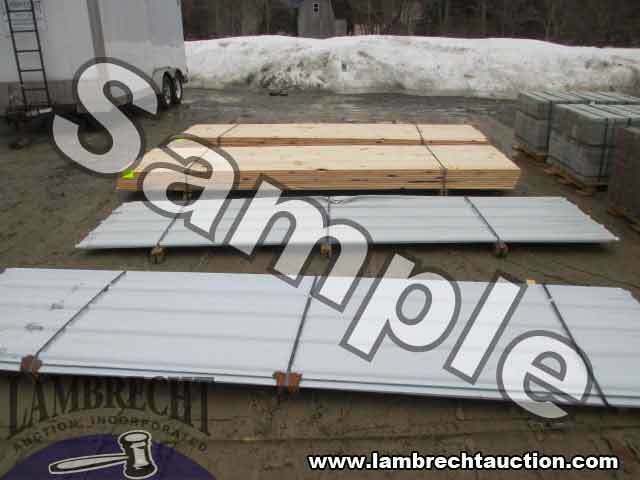 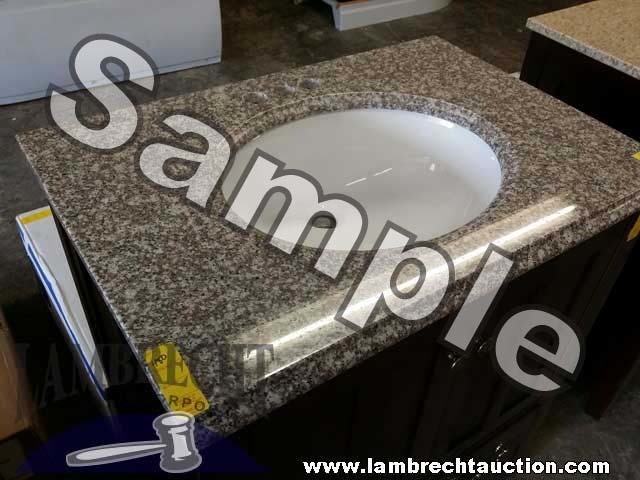 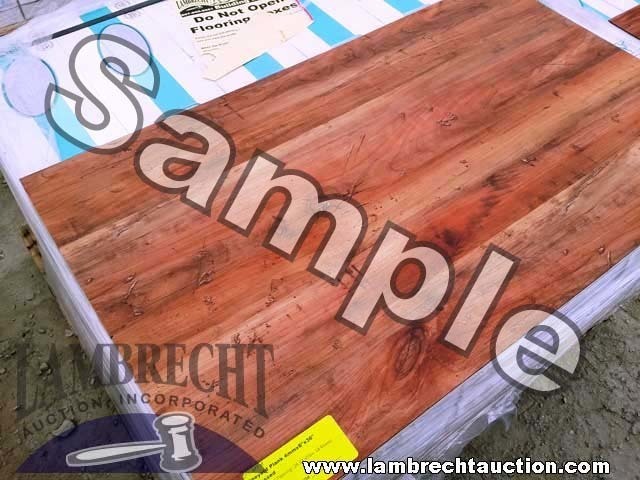 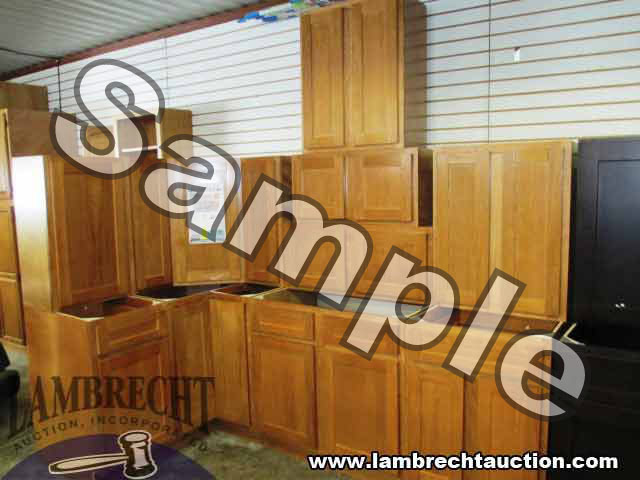 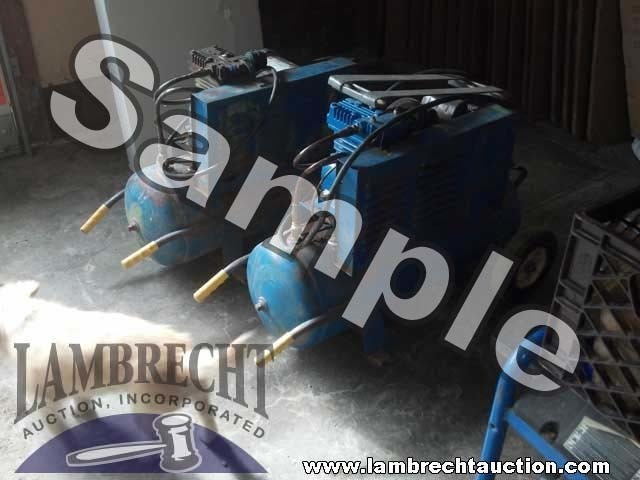 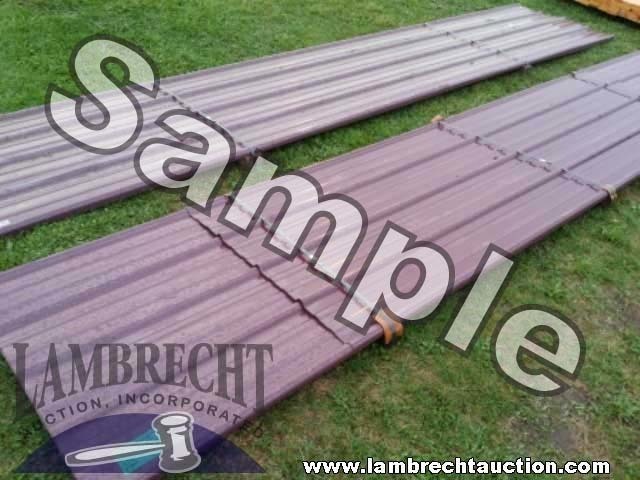 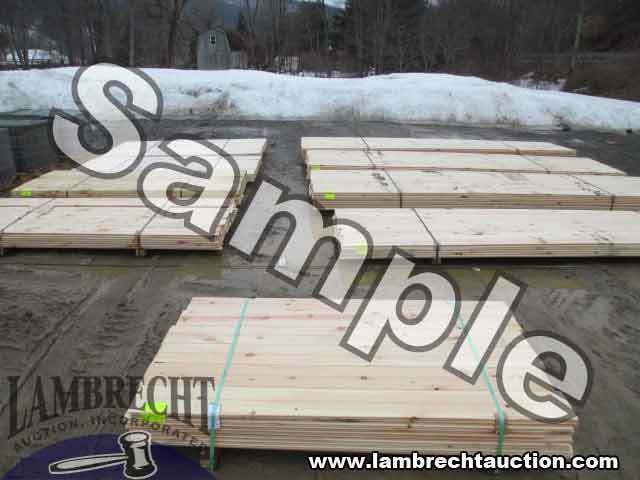 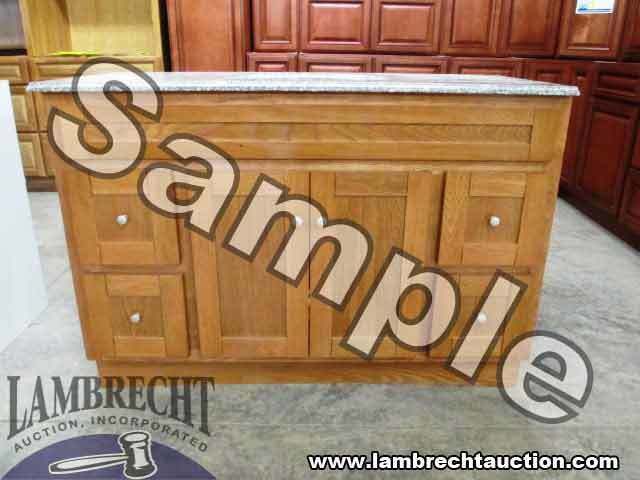 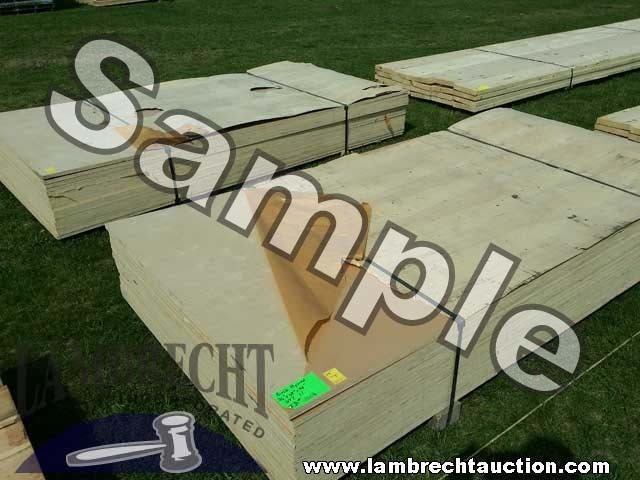 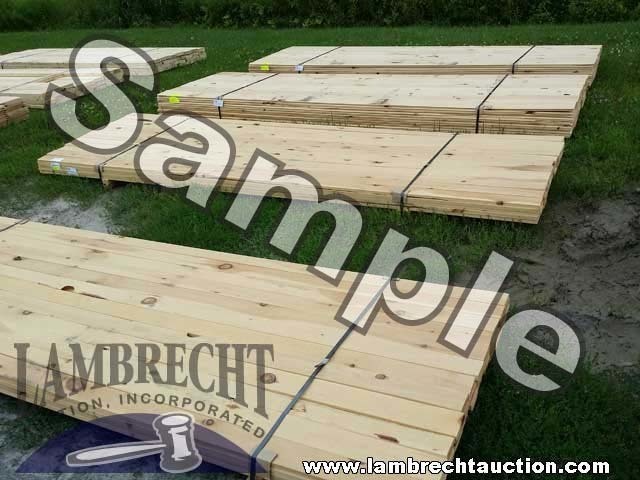 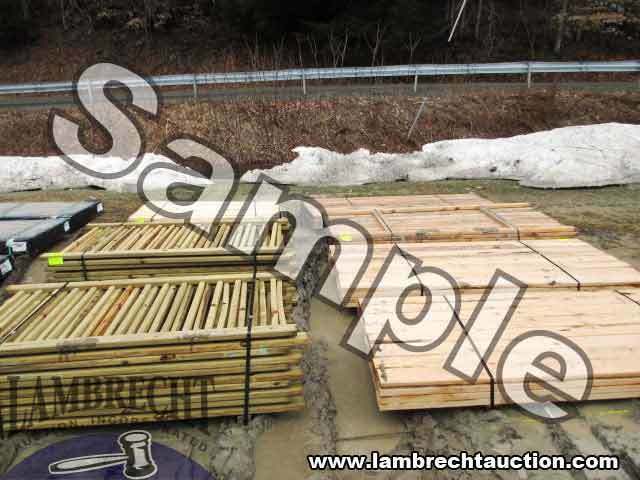 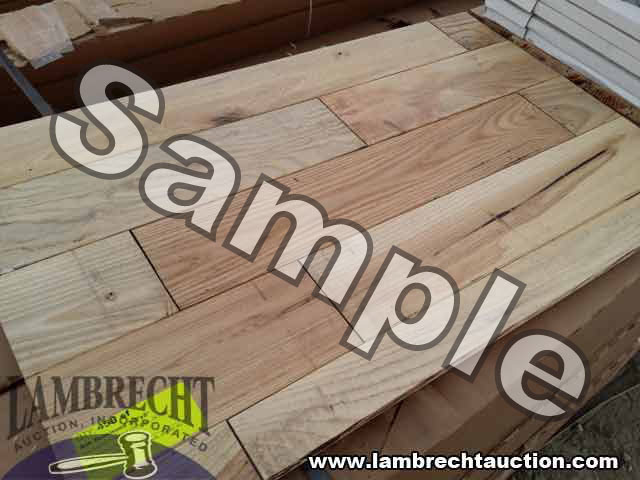 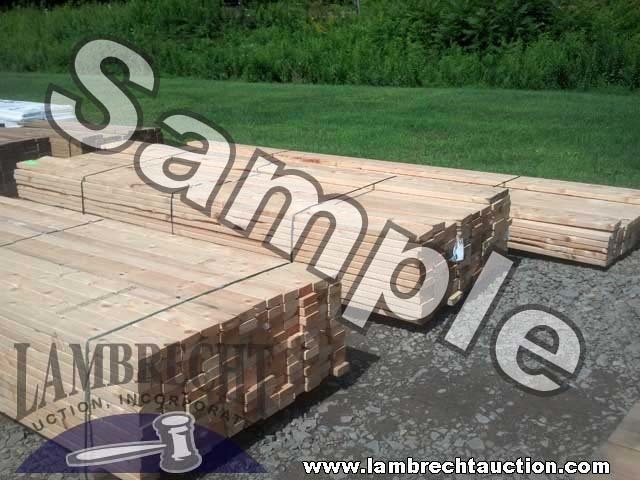 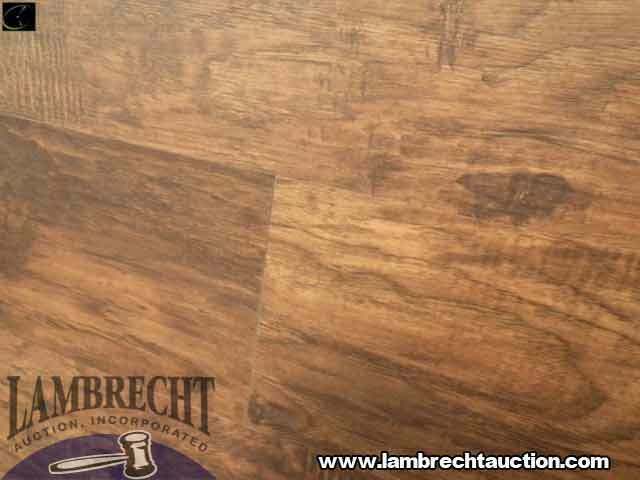 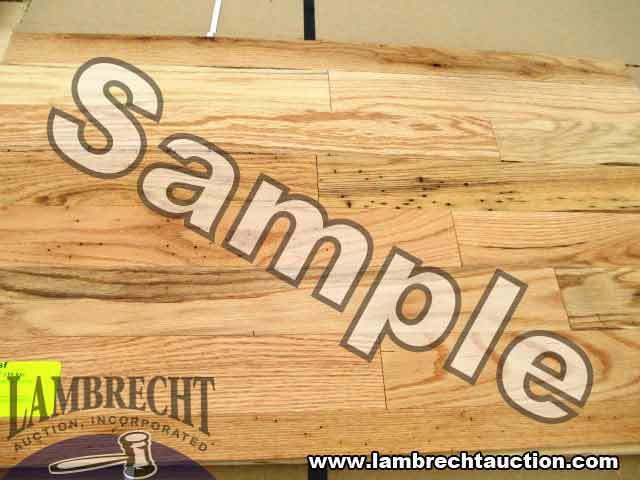 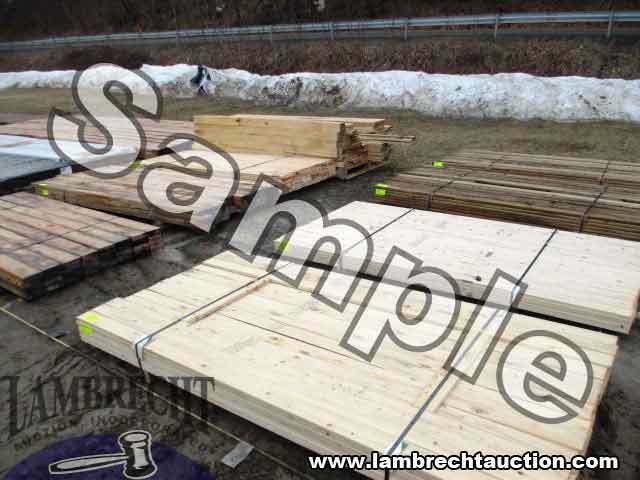 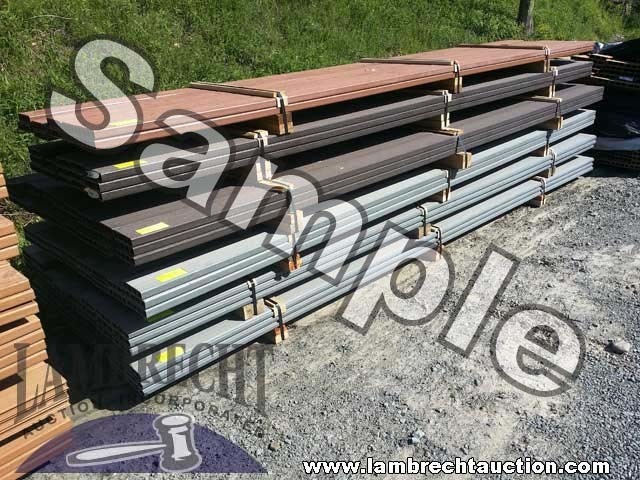 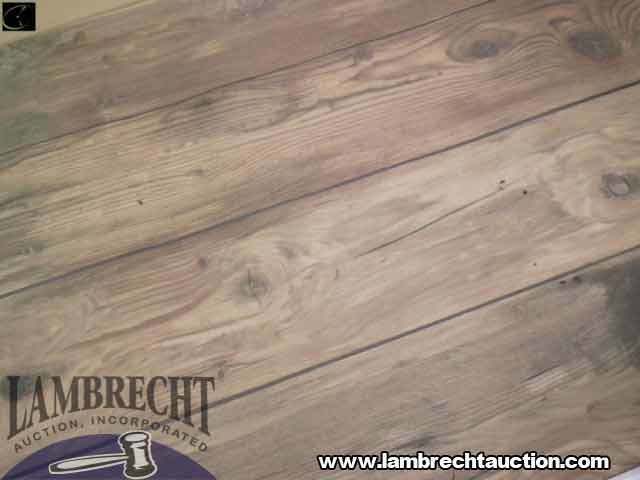 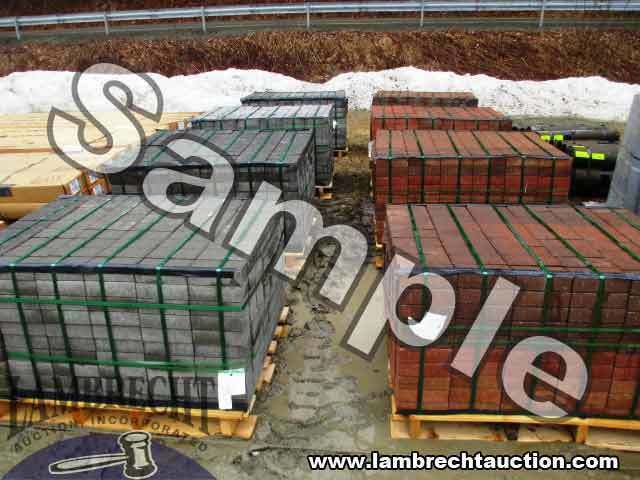 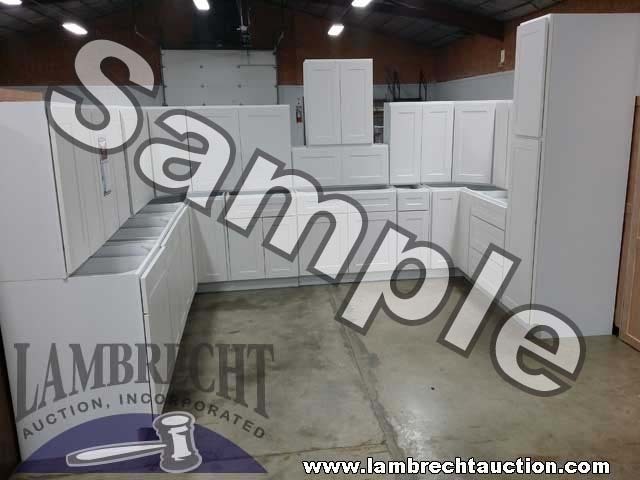 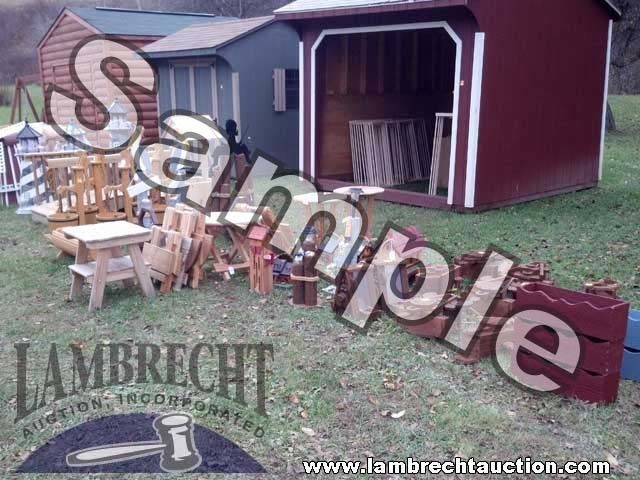 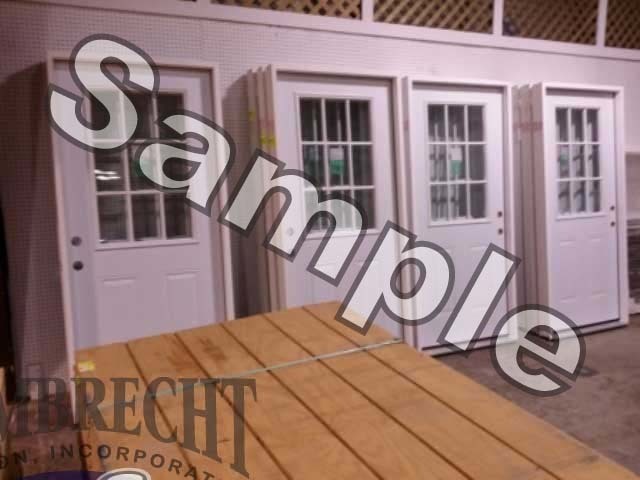 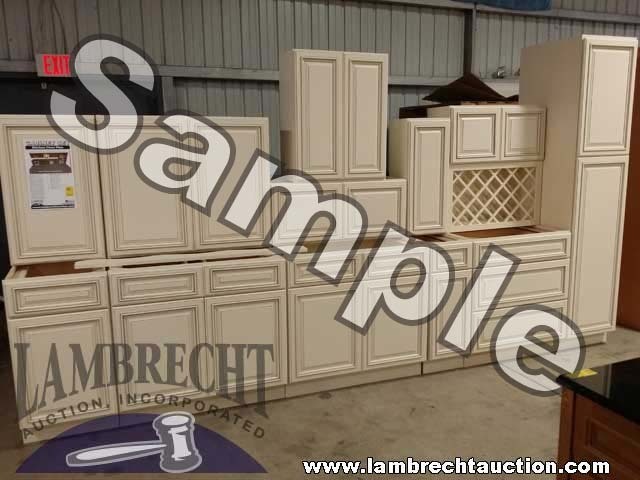 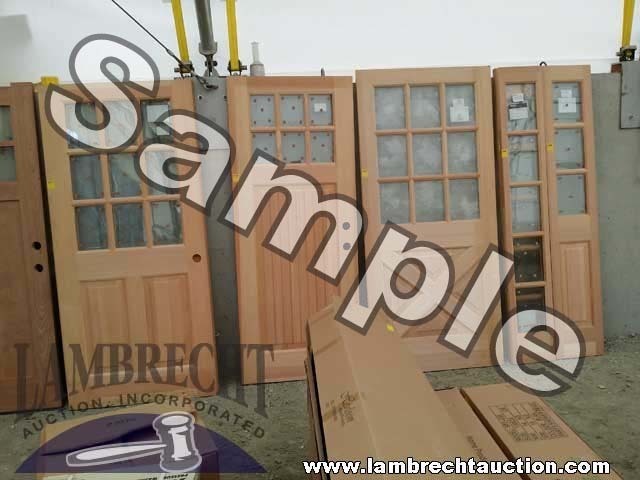 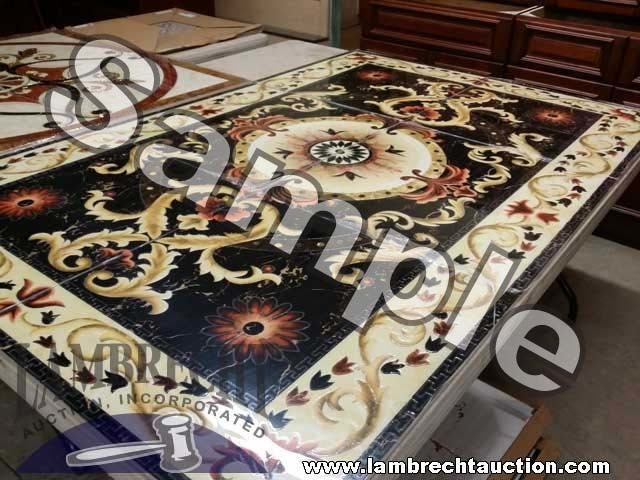 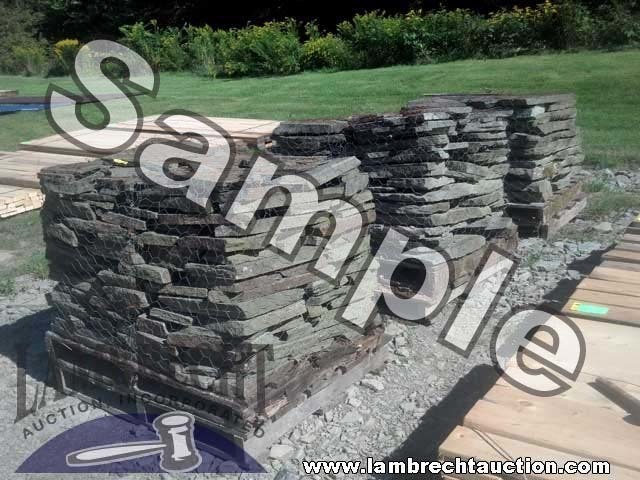 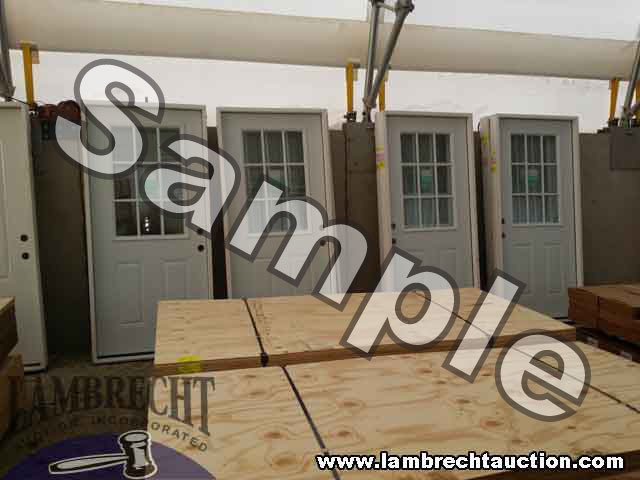 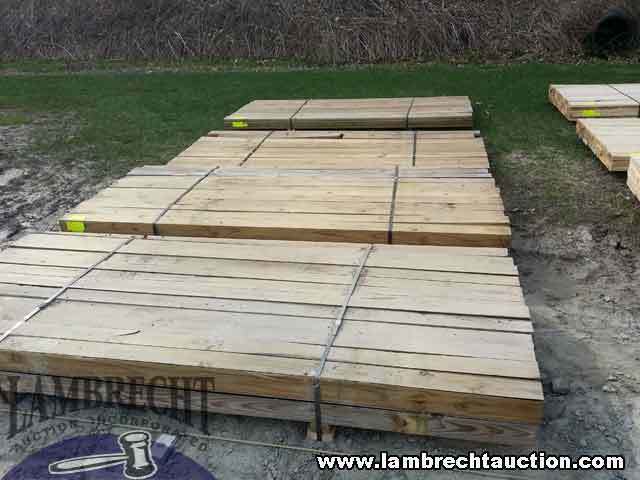 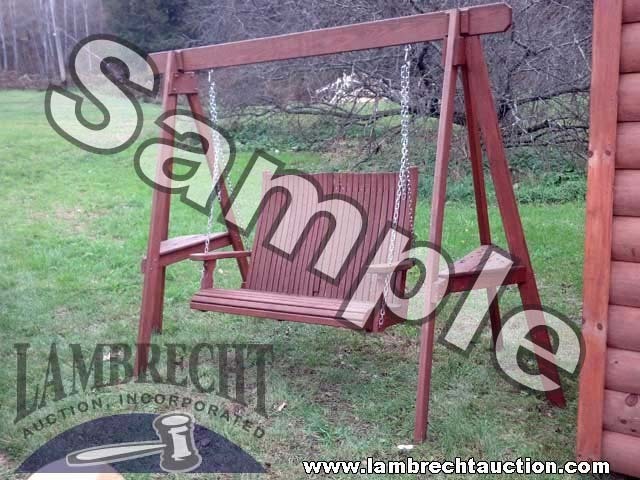 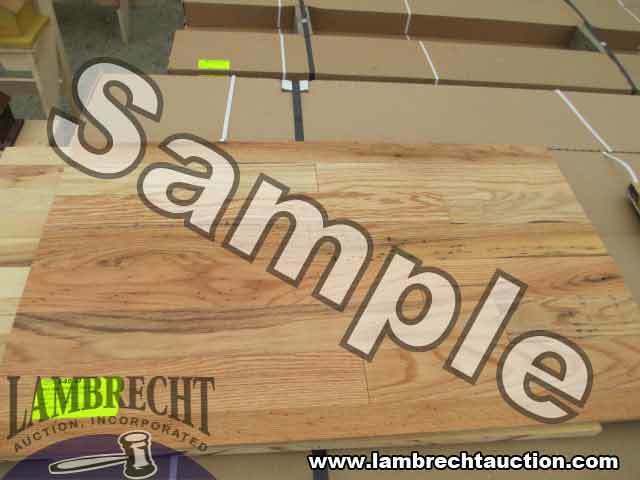 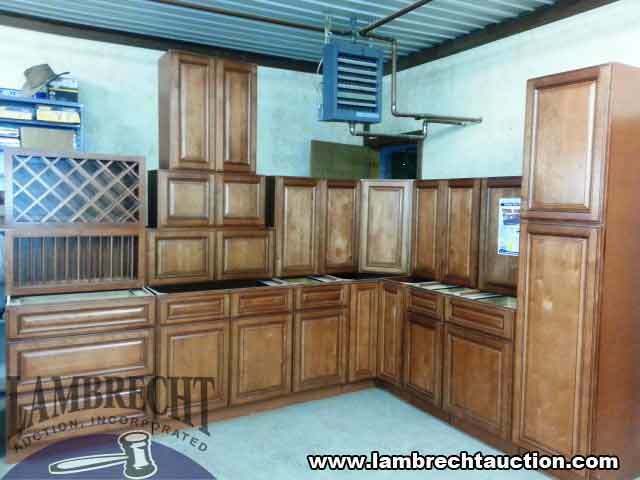 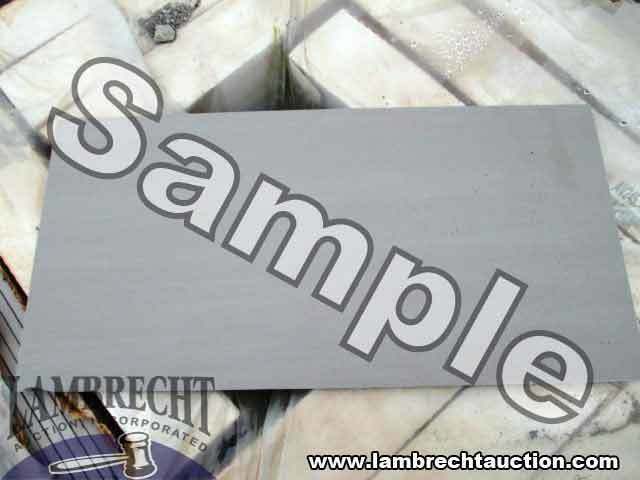 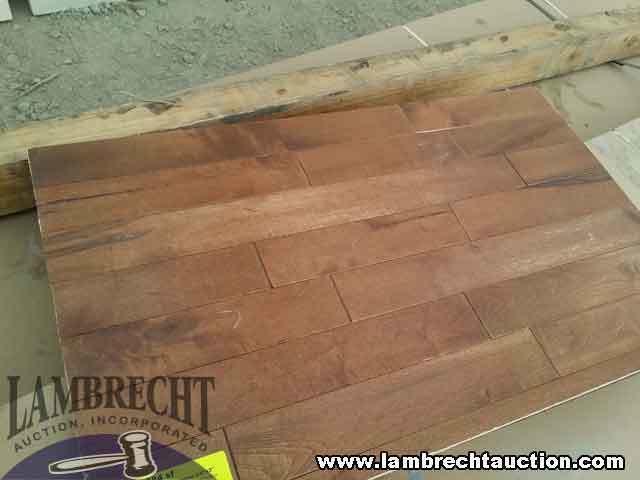 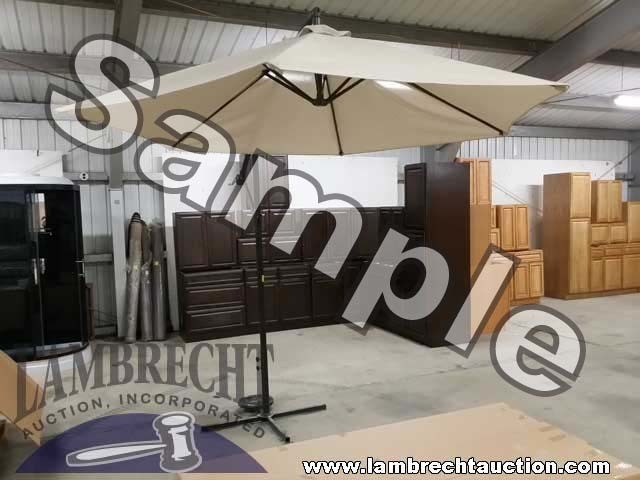 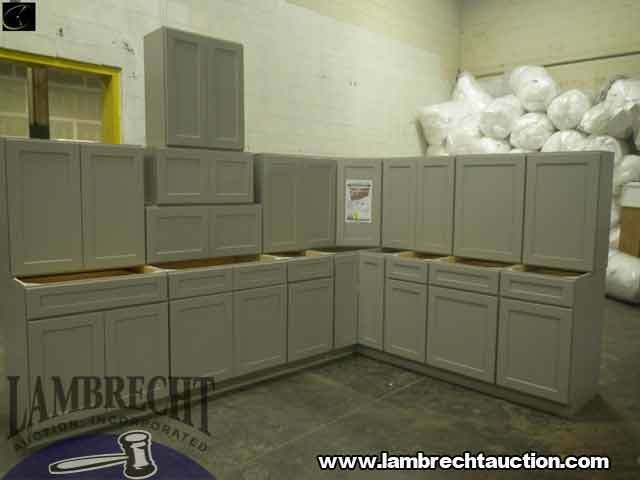 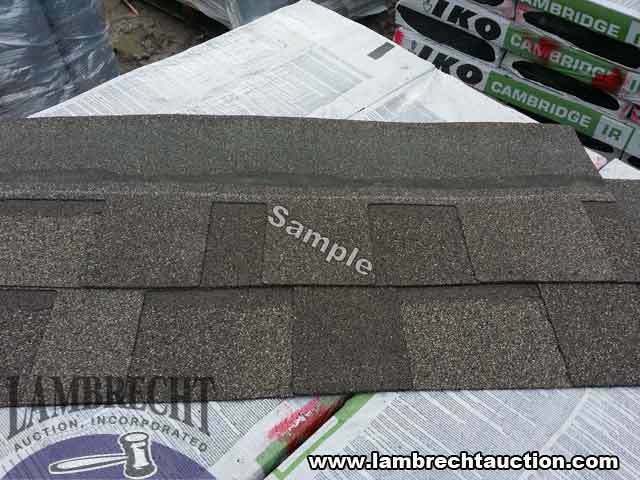 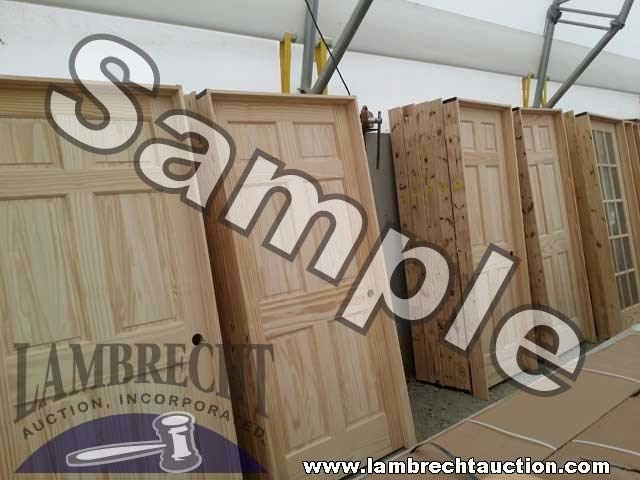 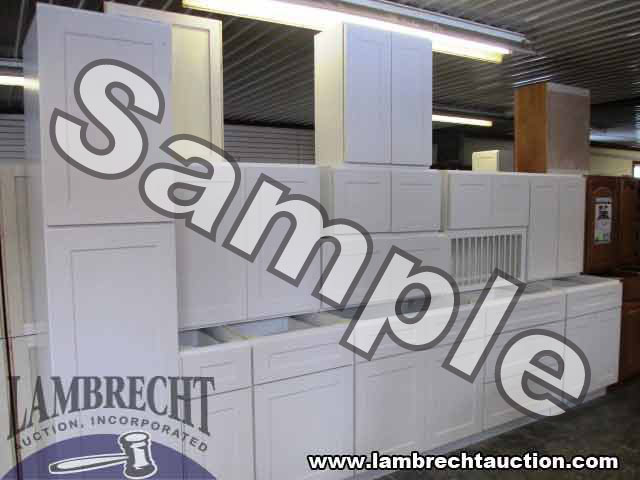 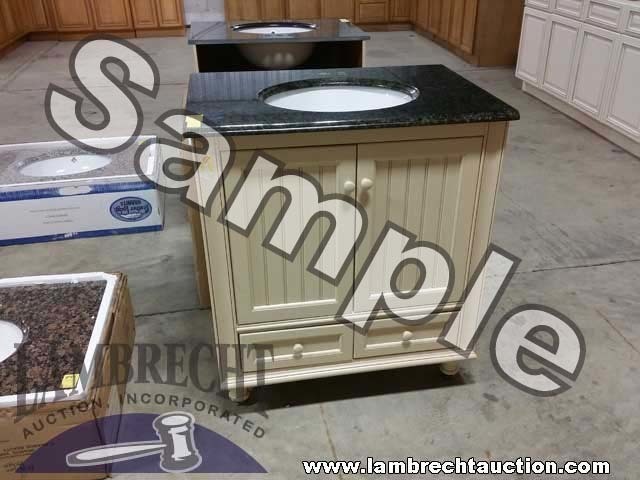 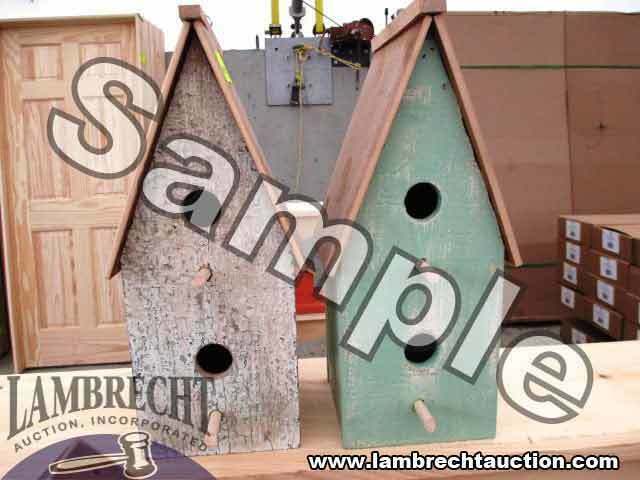 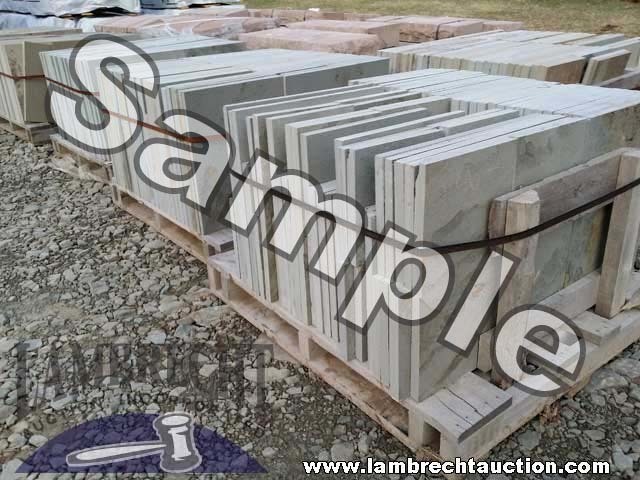 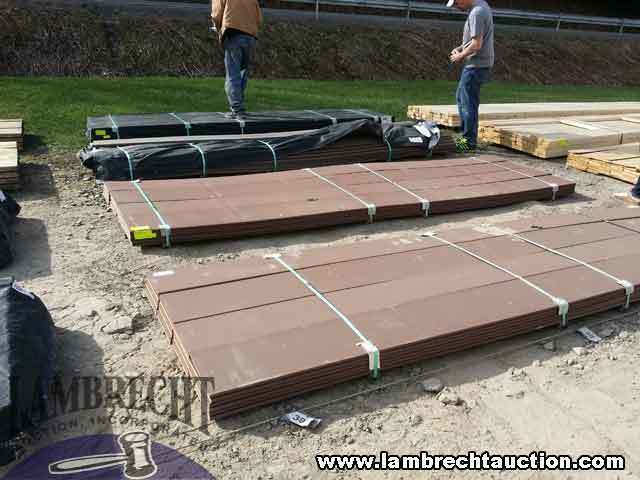 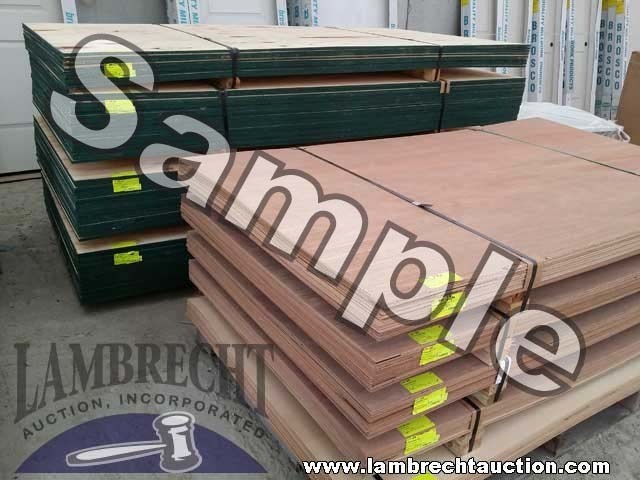 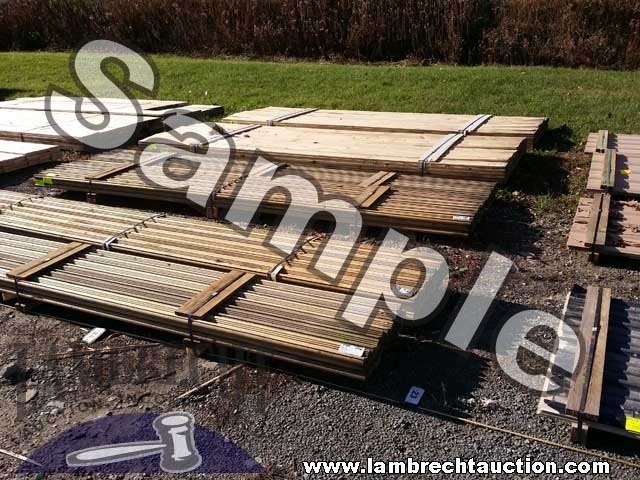 Live Building Material Auction - Lambrecht Auction, Inc. Live Building Material Auction - Lambrecht Auction, Inc. 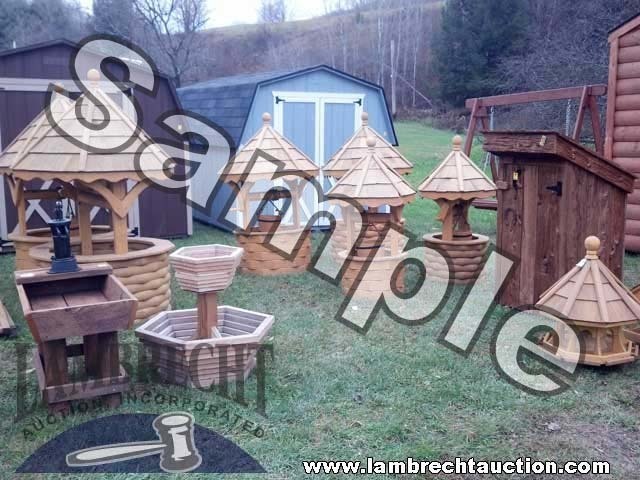 FINAL Catalog Posted Under The Documents Tab! 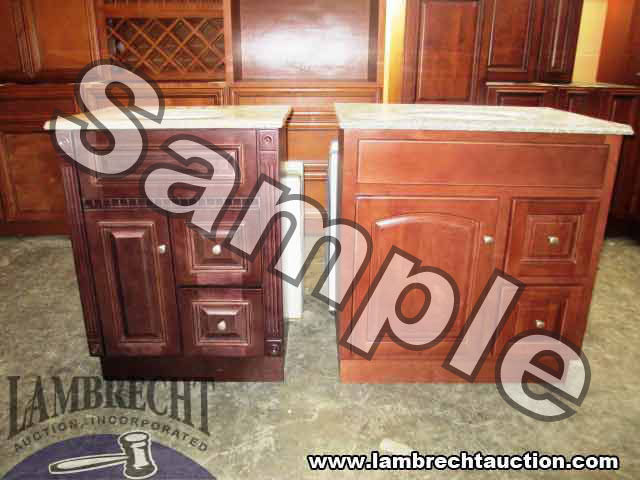 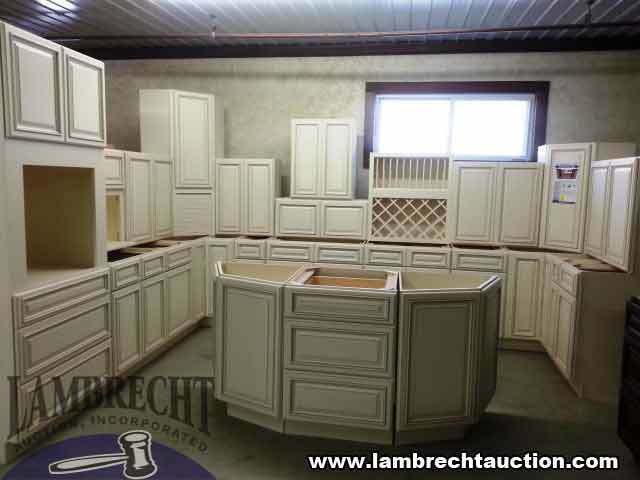 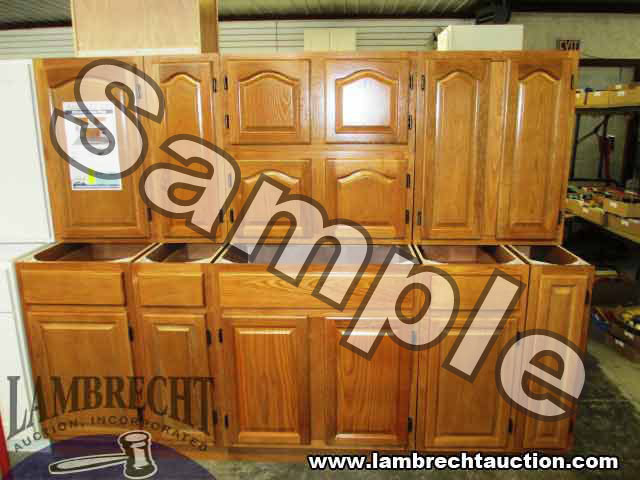 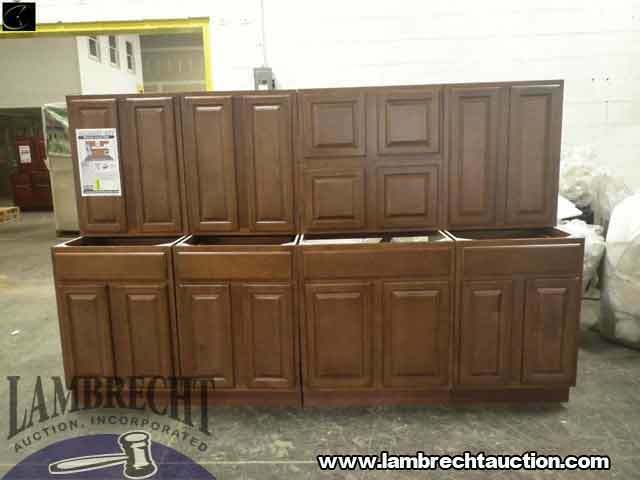 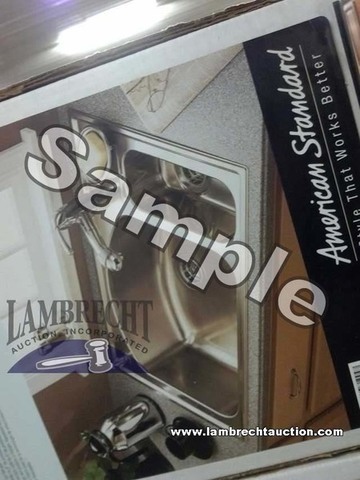 Kitchen Sets: 15 to 20 sets total, Multiple floor plan options of various sizes and features. 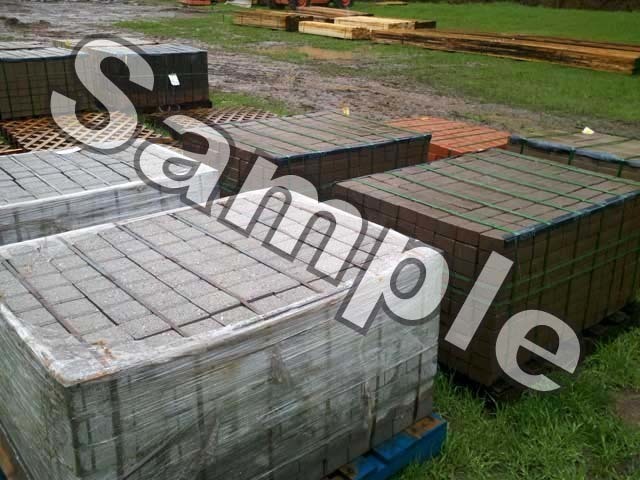 Some Layouts are very large!! 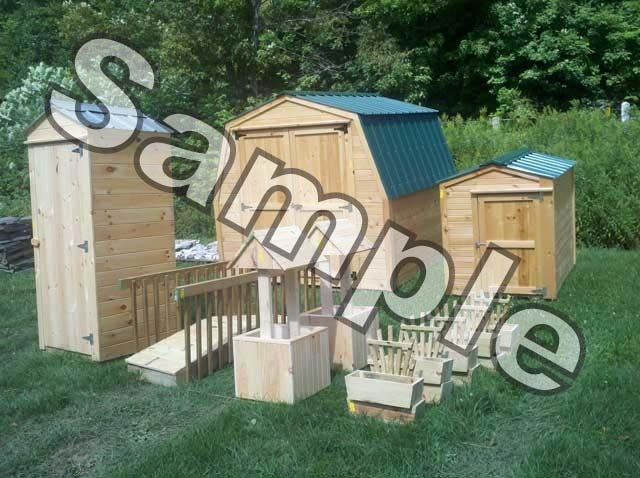 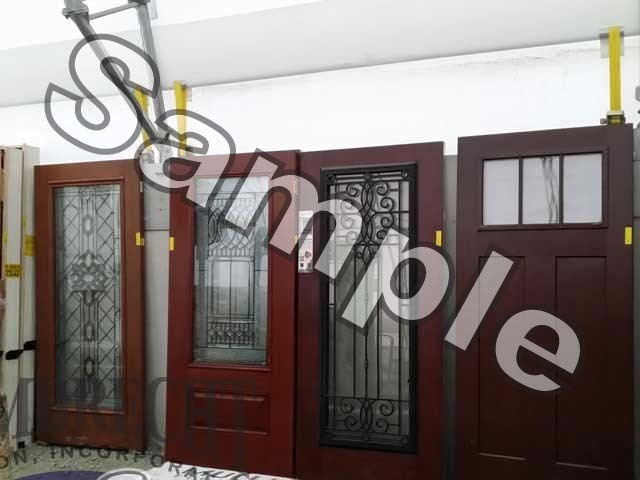 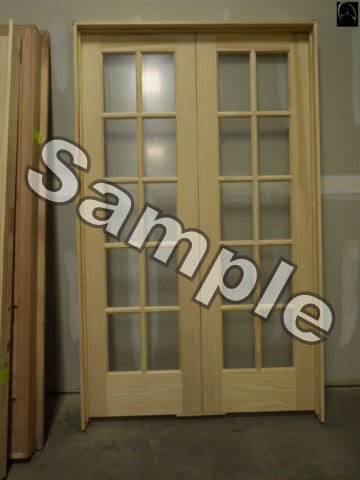 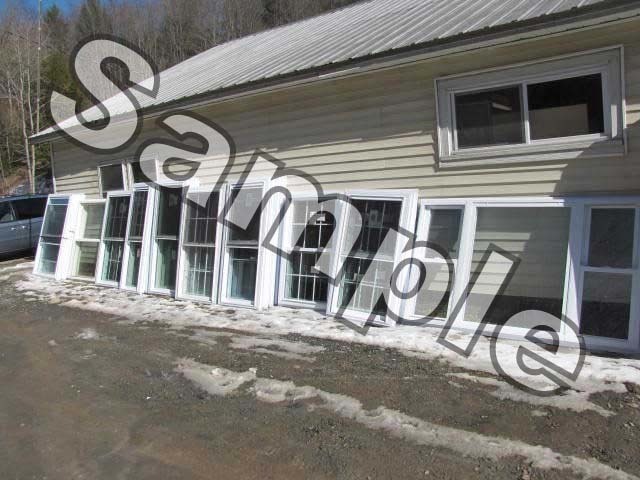 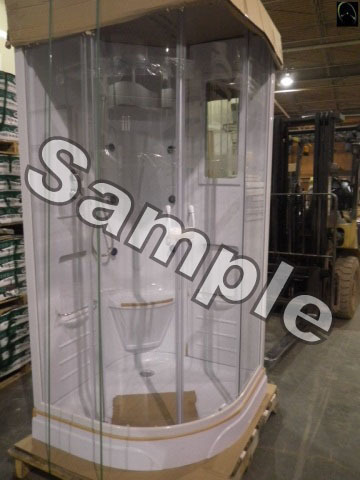 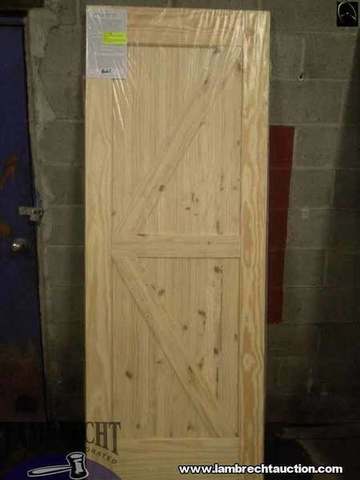 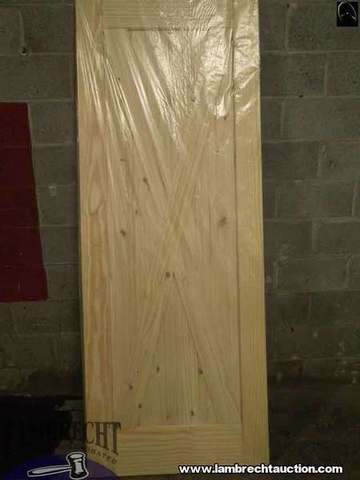 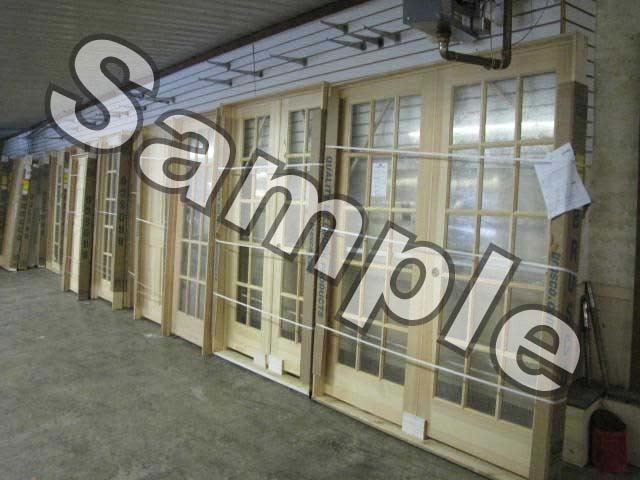 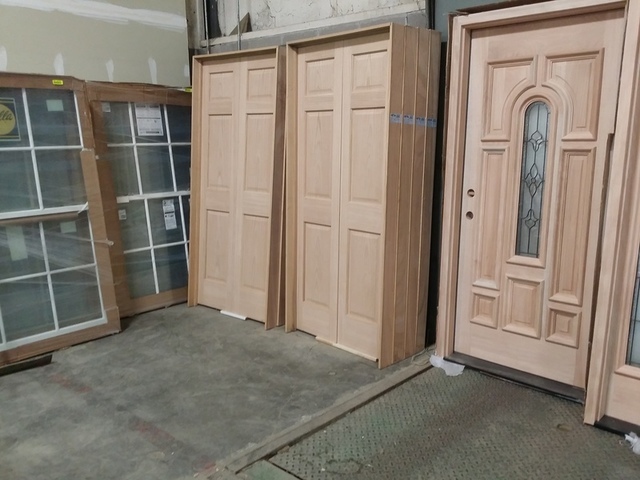 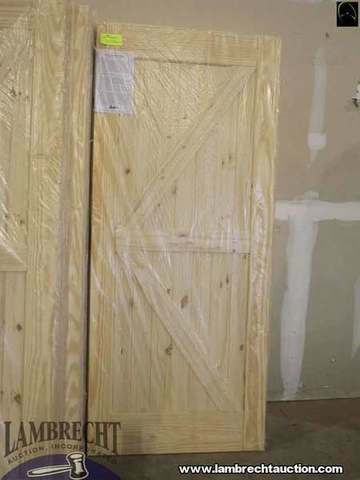 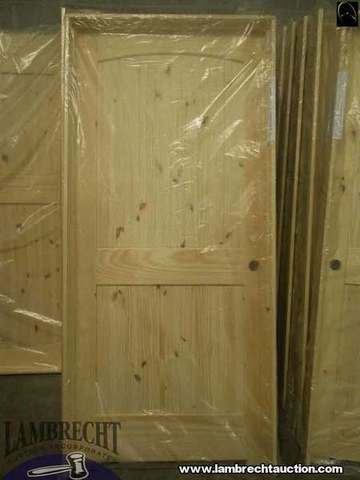 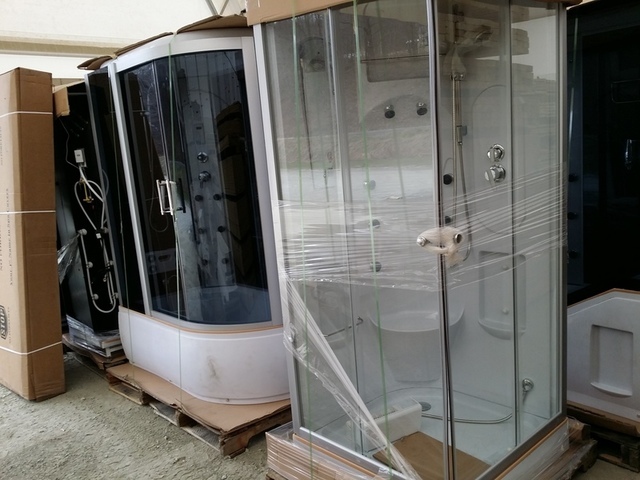 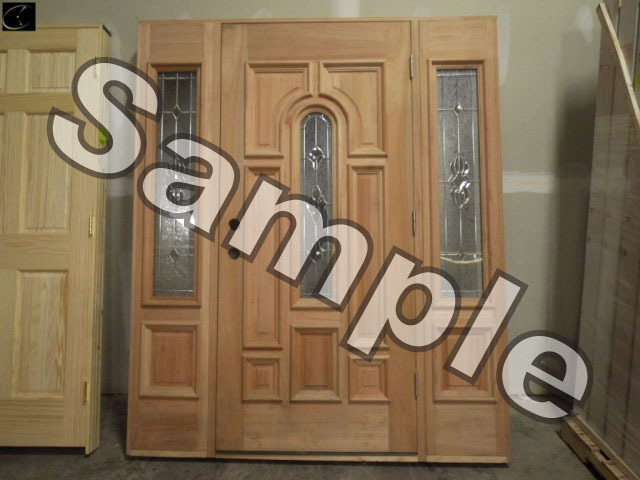 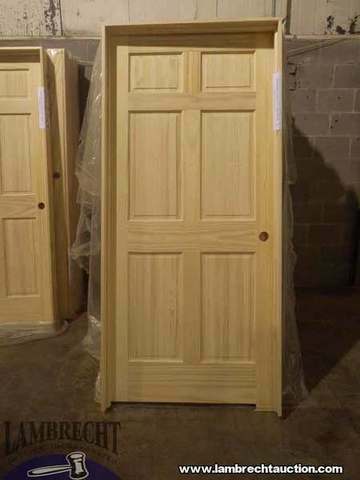 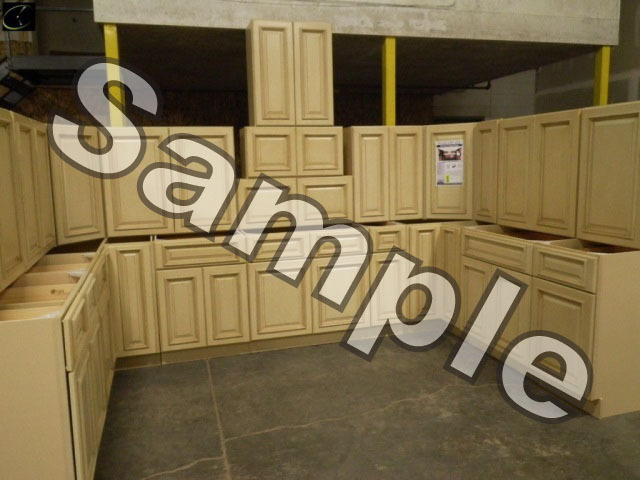 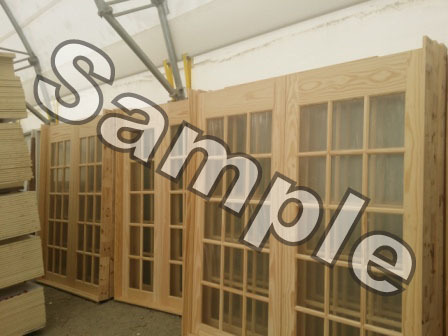 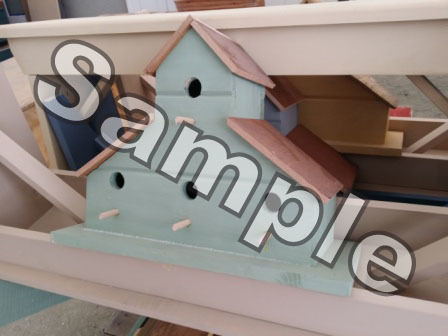 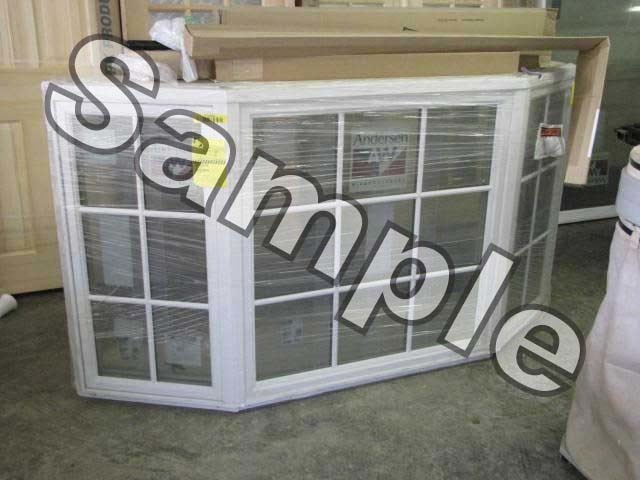 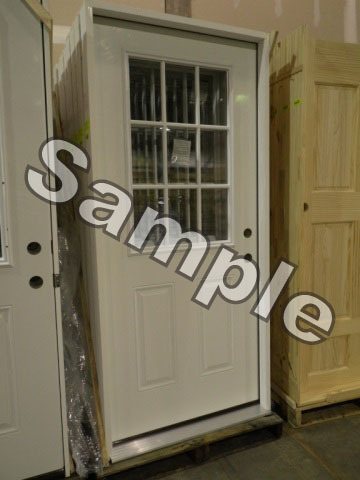 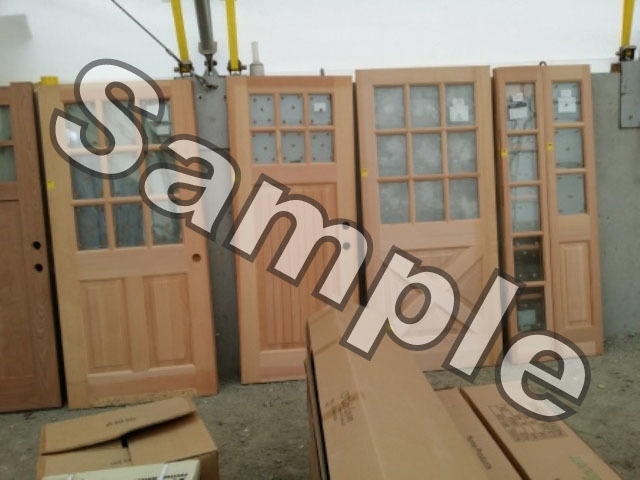 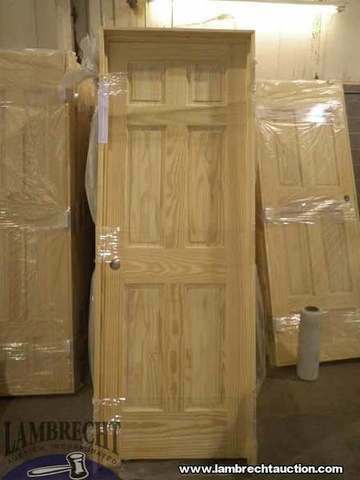 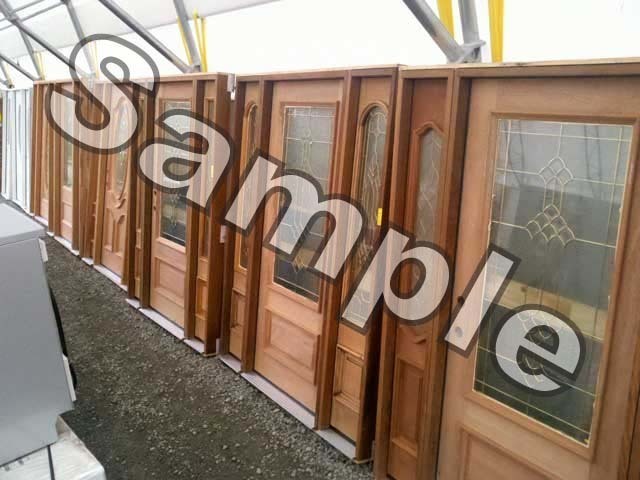 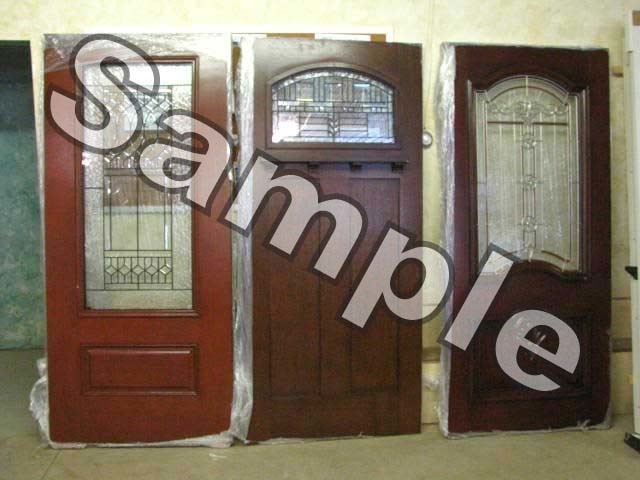 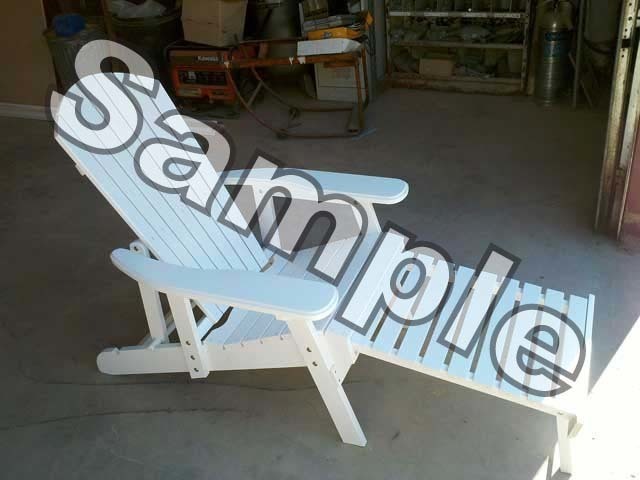 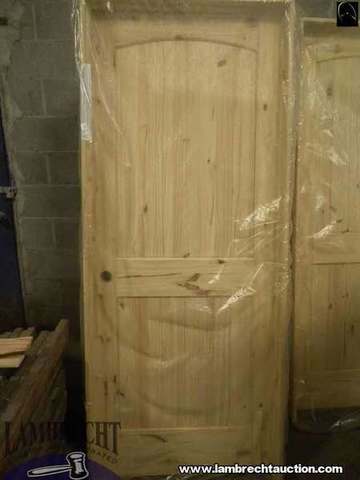 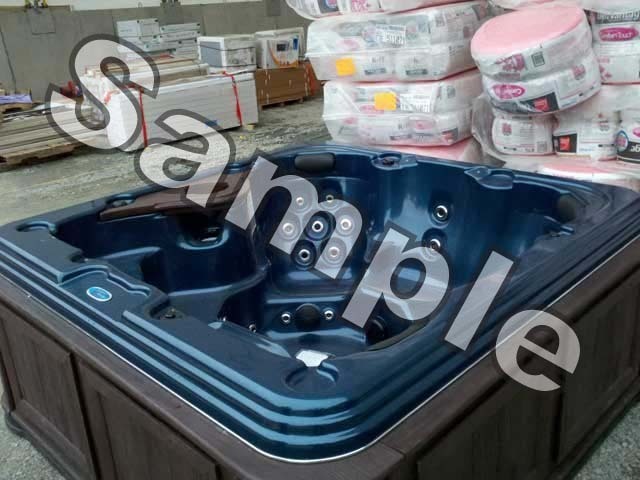 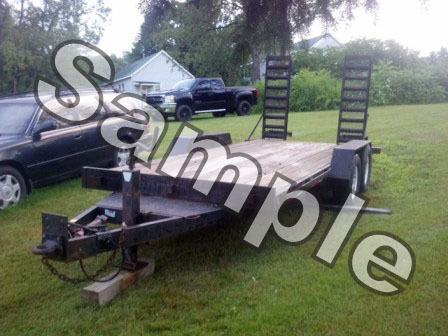 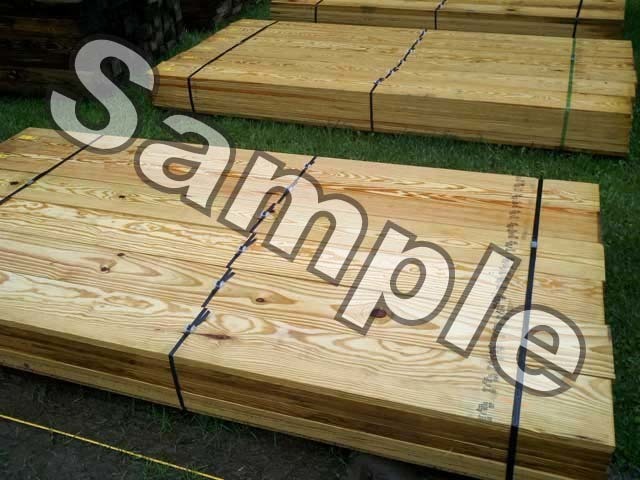 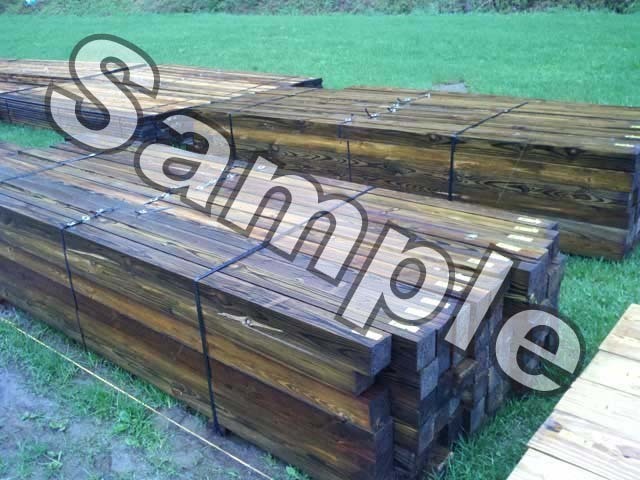 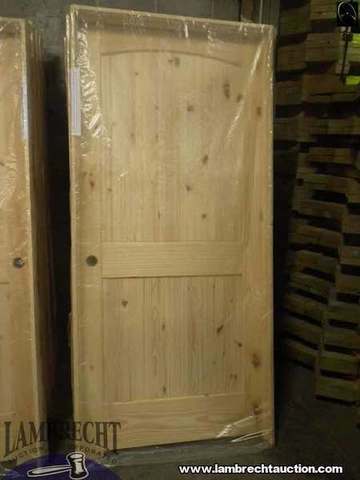 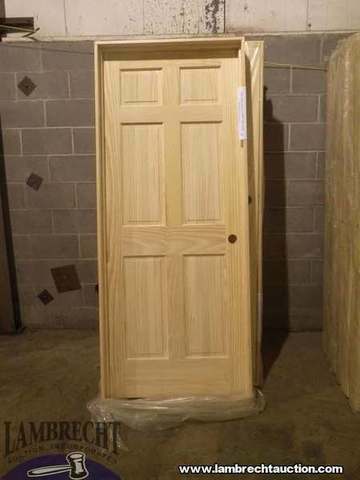 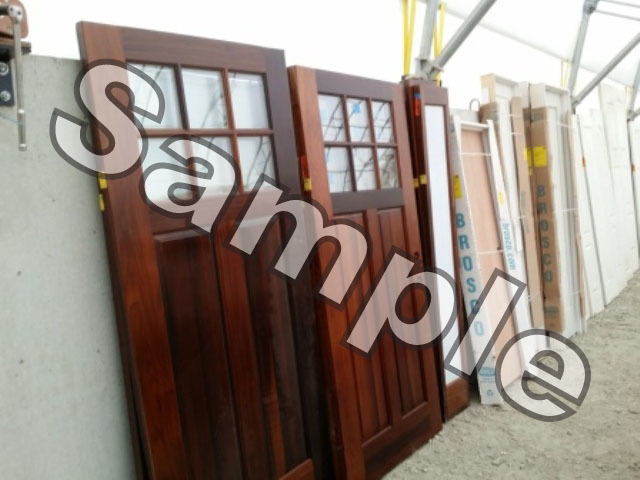 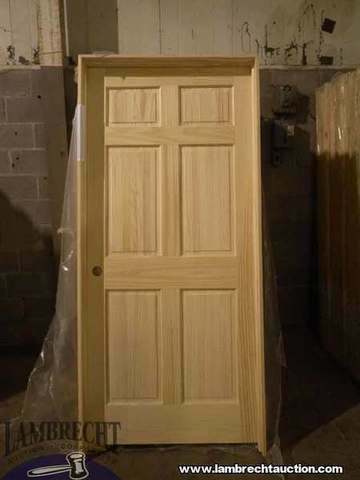 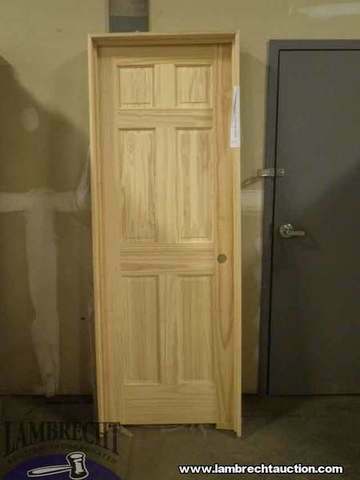 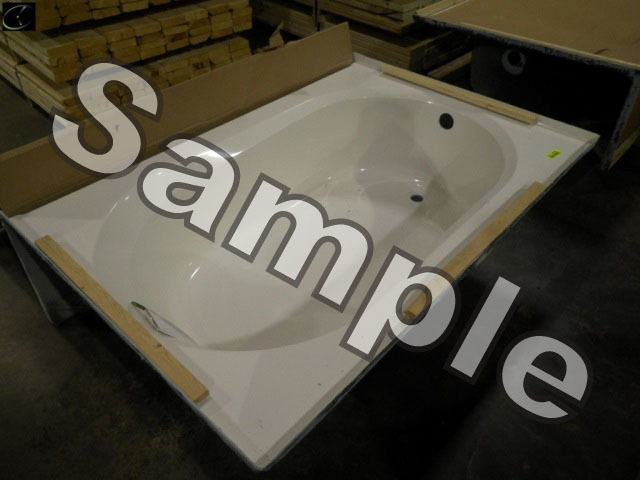 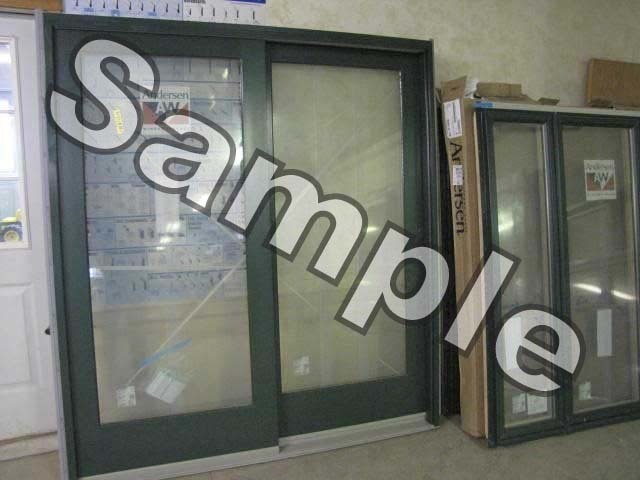 All Sets are BRAND NEW, quality built, plywood construction, with solid wood faces. 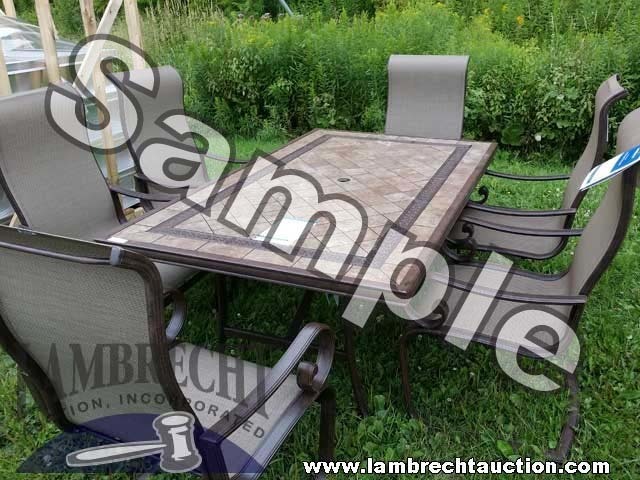 Ordering availability for extra pieces and accessories. 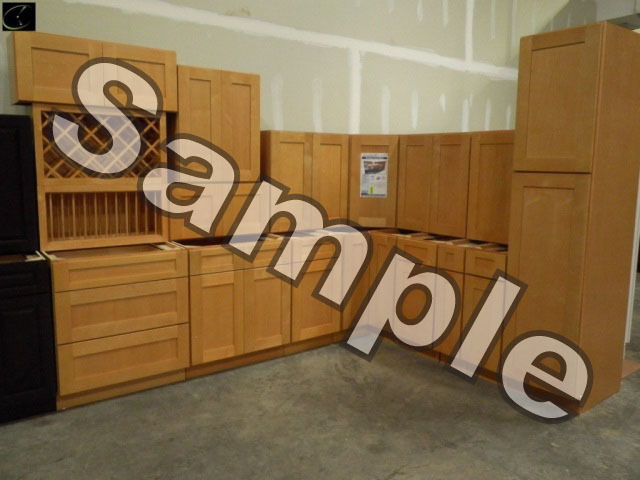 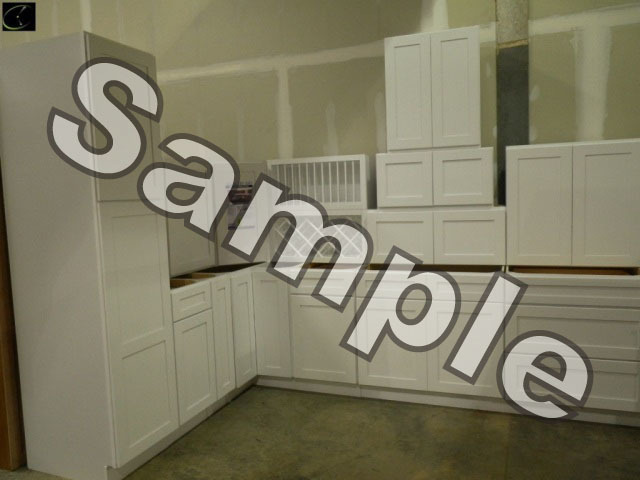 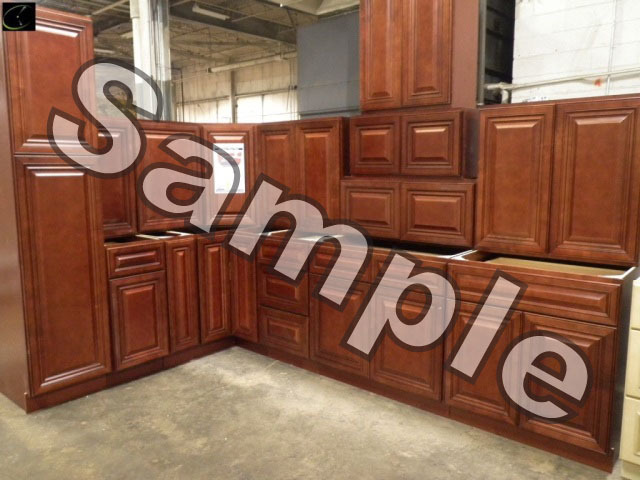 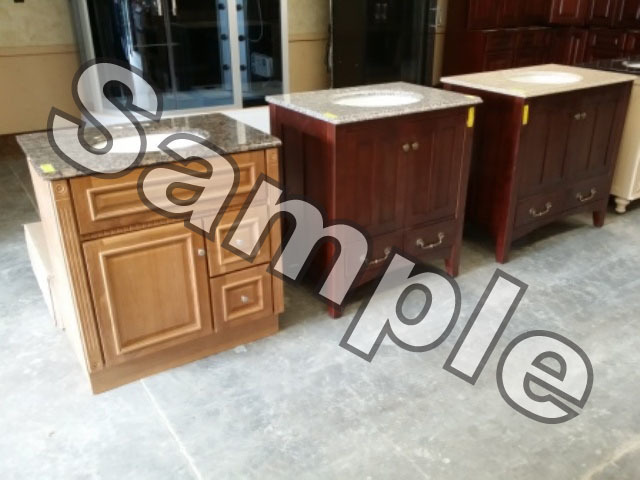 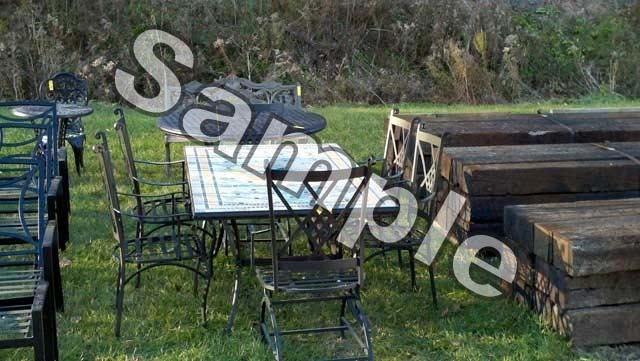 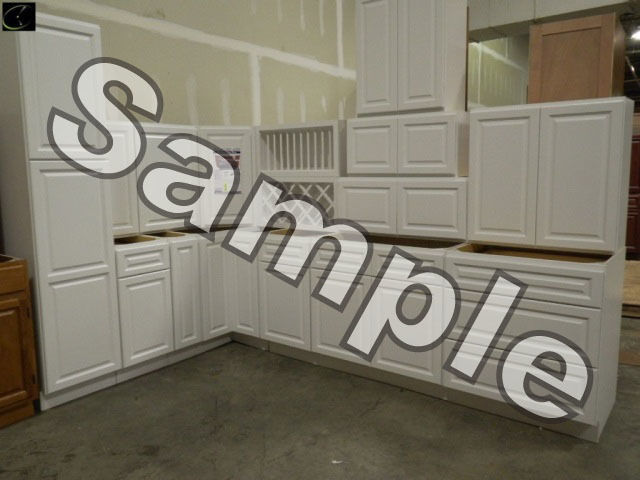 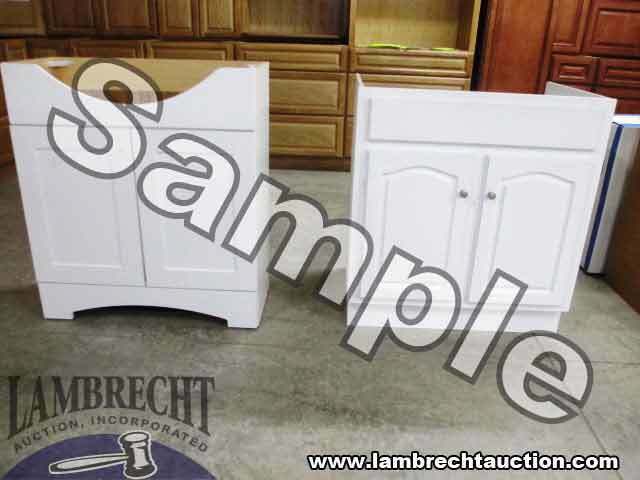 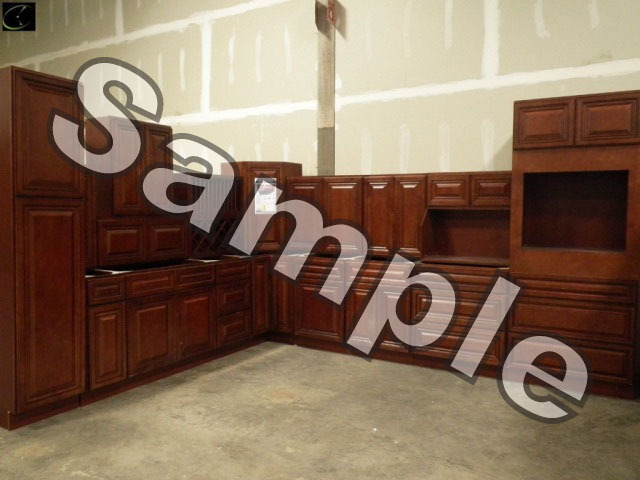 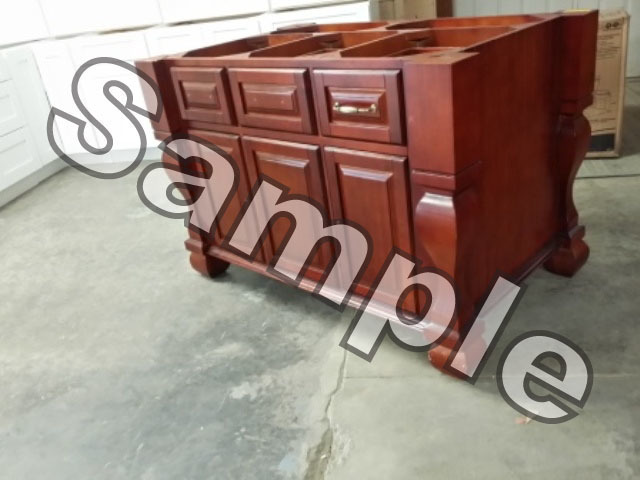 Sets offer options such as pantries, lazy Susans, wine racks, oven cabinets, drawer bases, and more. 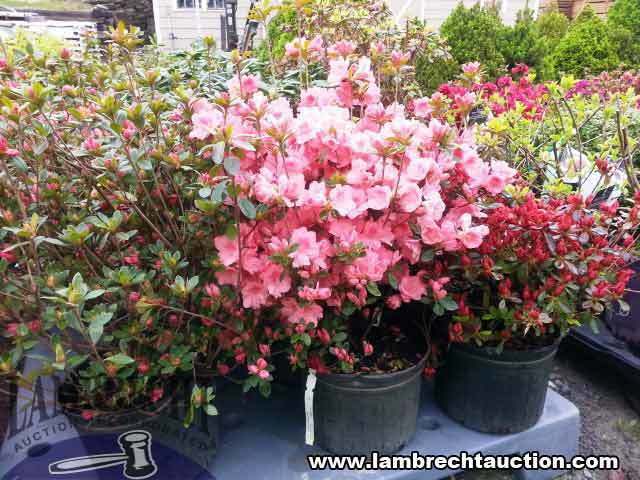 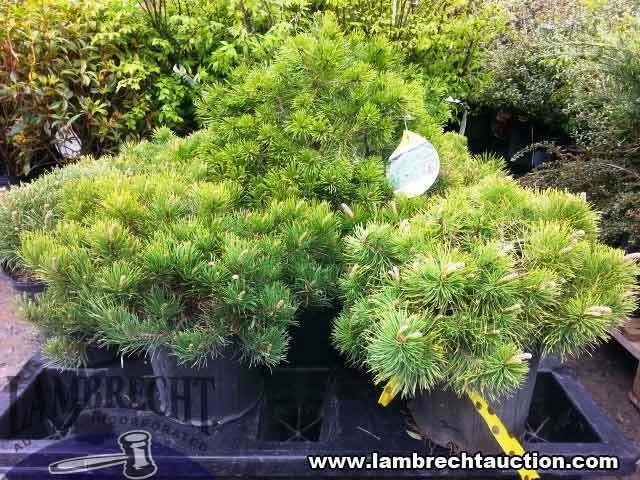 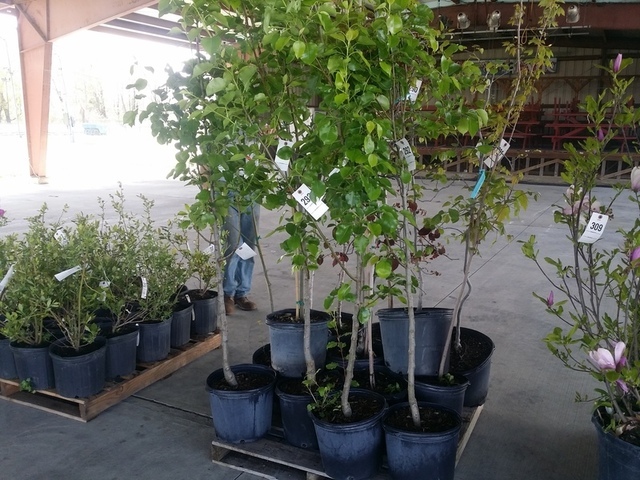 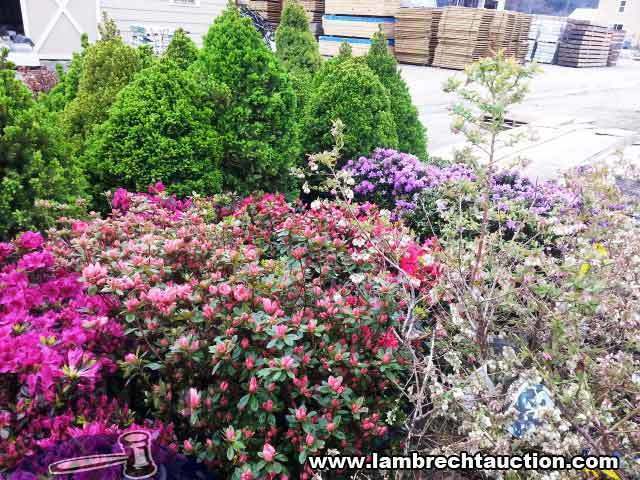 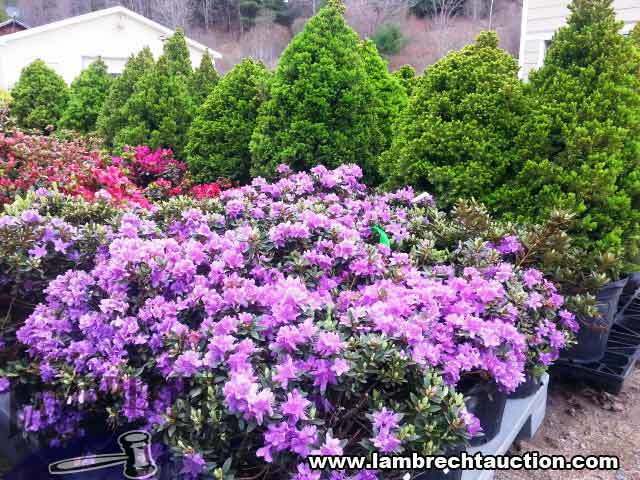 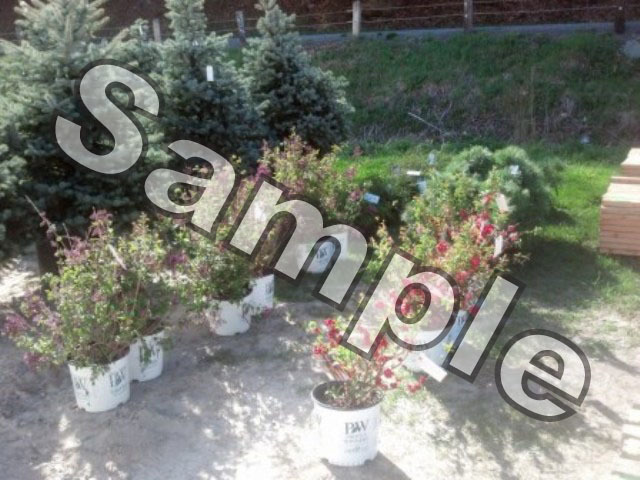 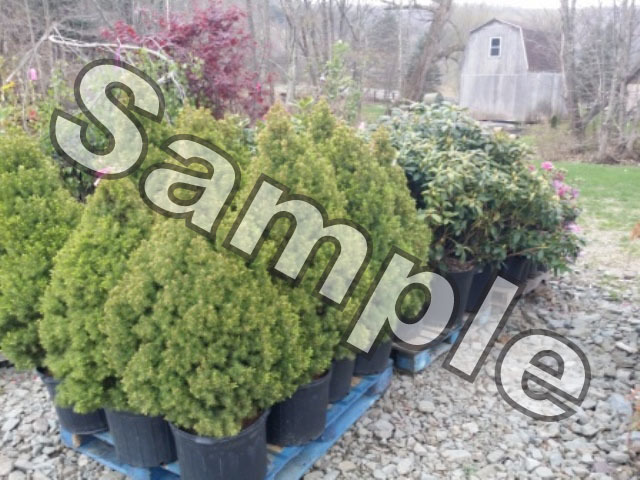 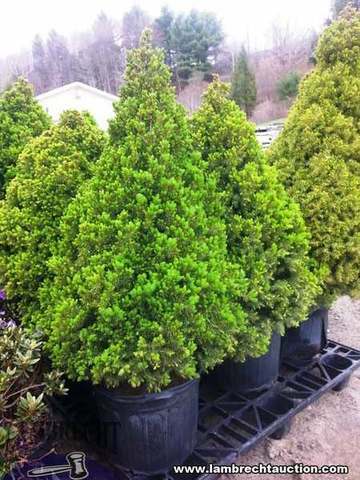 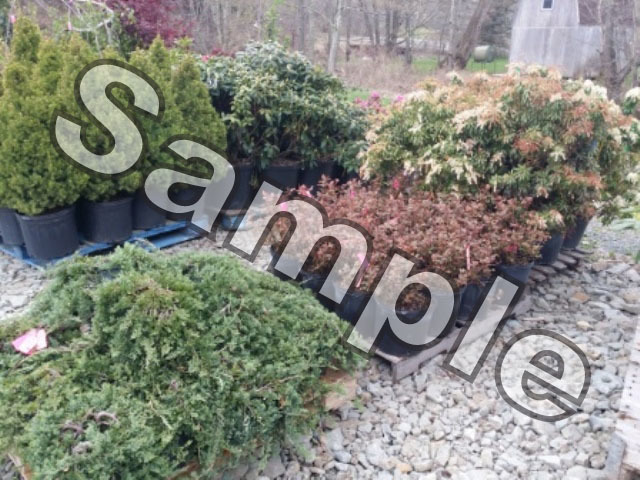 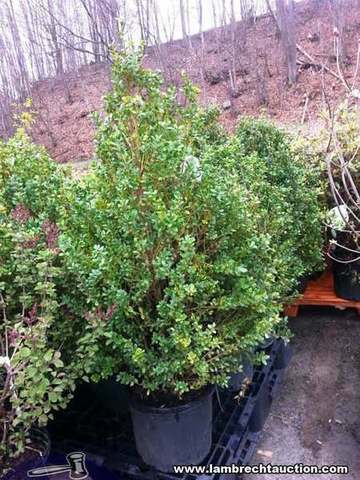 Nursery Stock: Azaleas ~ Rhododendron Assorted Junipers ~ Assorted Shade & Flowering Trees ~ Fruit – Apple & Peach Trees ~ Assorted Blueberries ~ Holly ~ Dwarf Alberta Spruce ~ Clematis Vines ~ Butterfly Bushes and more. 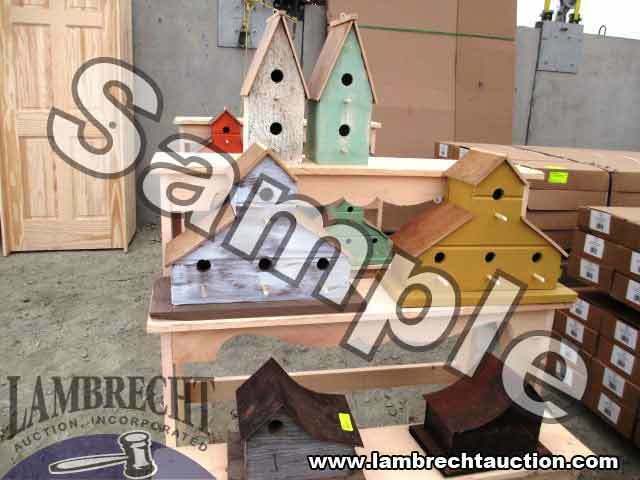 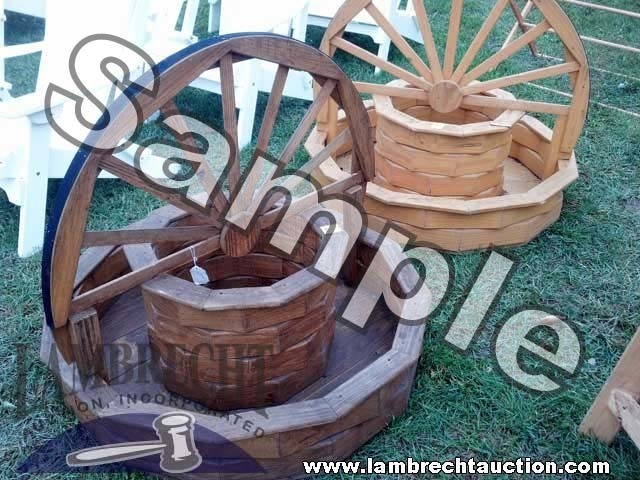 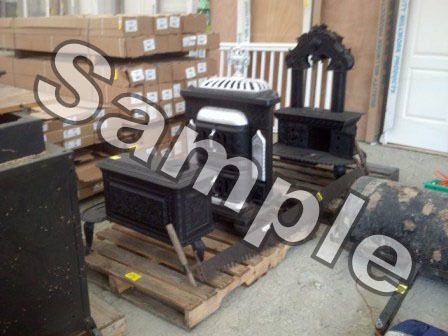 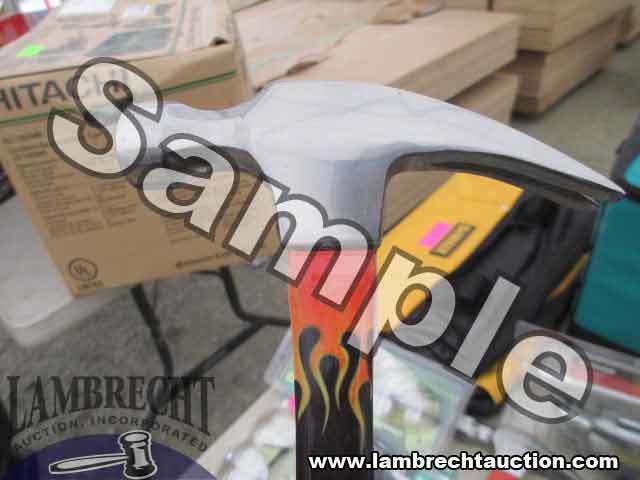 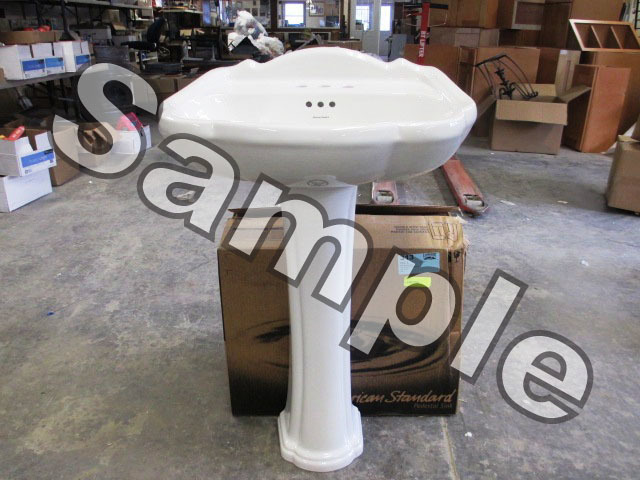 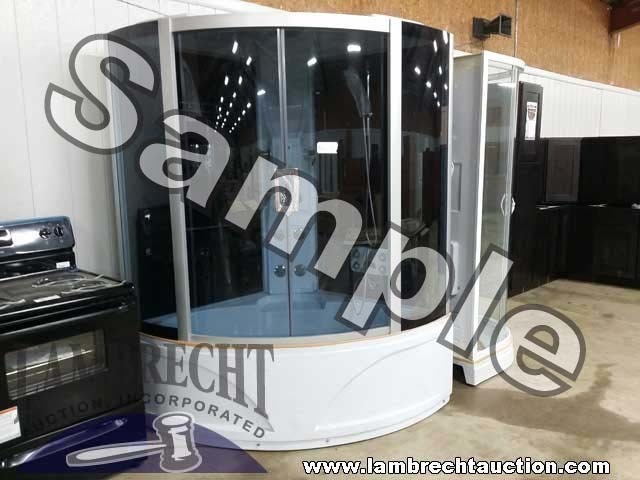 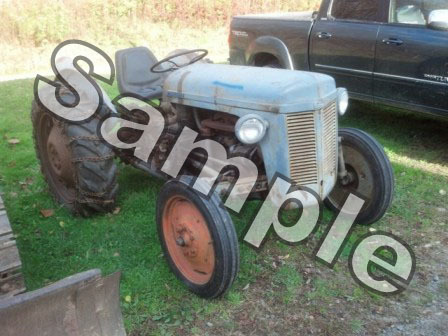 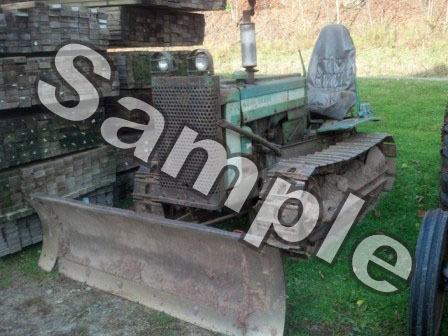 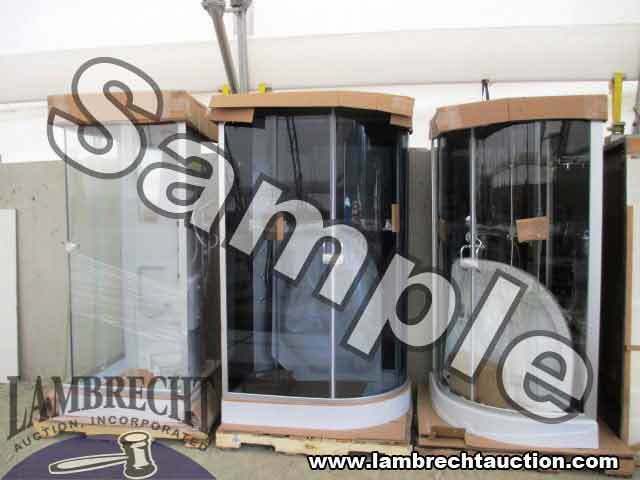 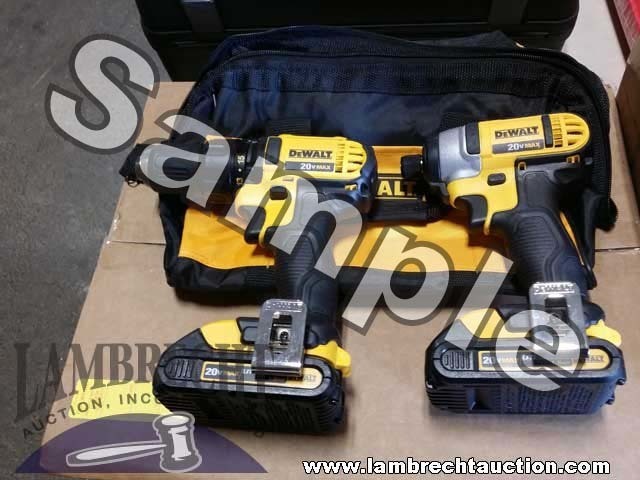 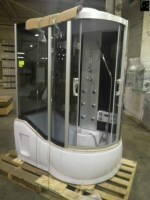 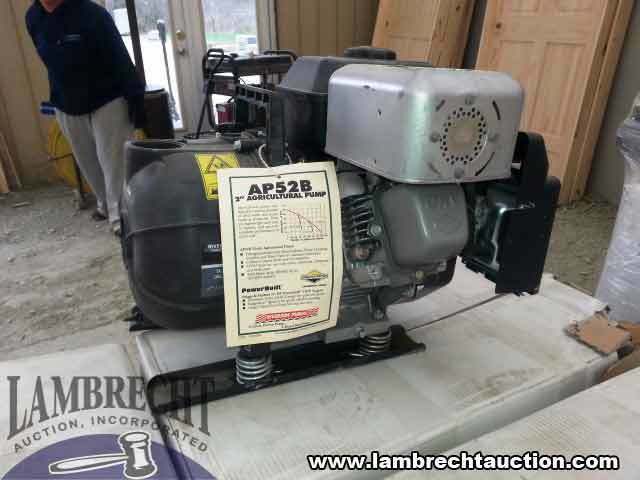 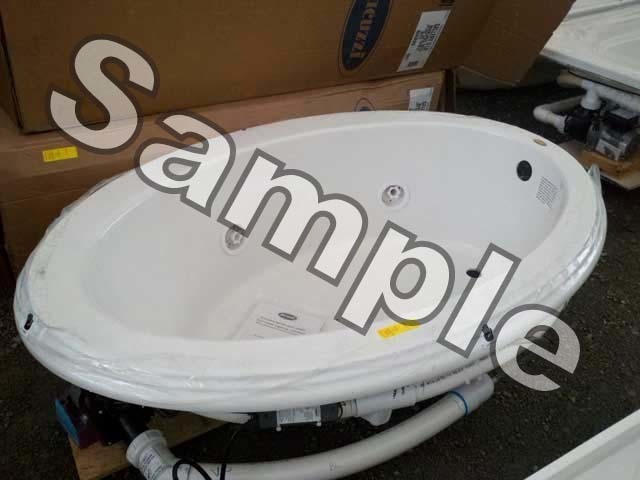 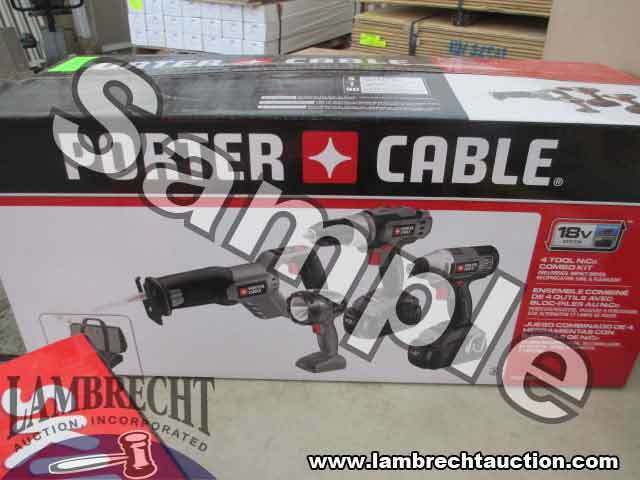 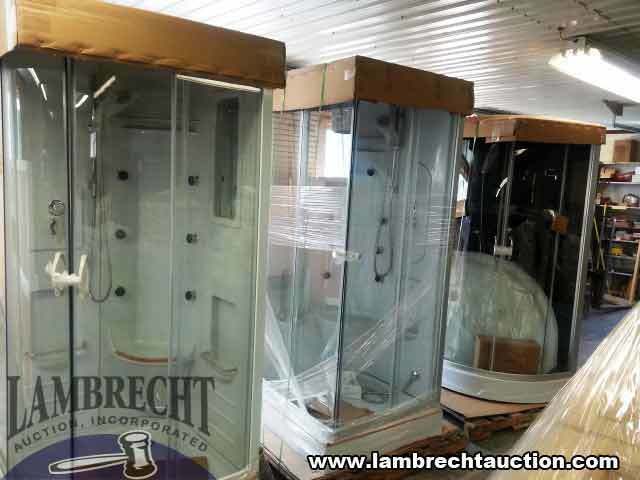 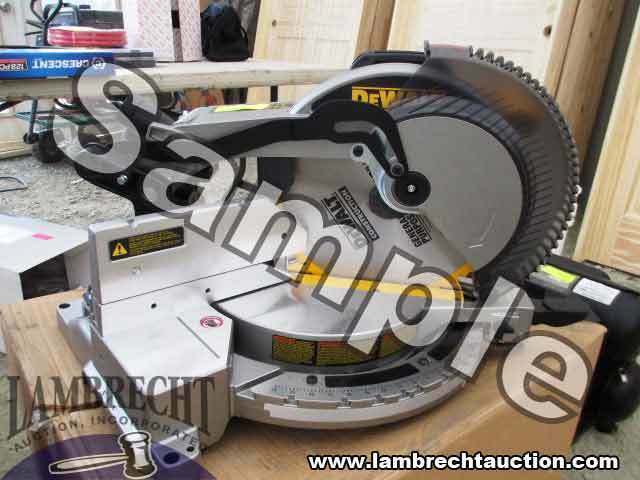 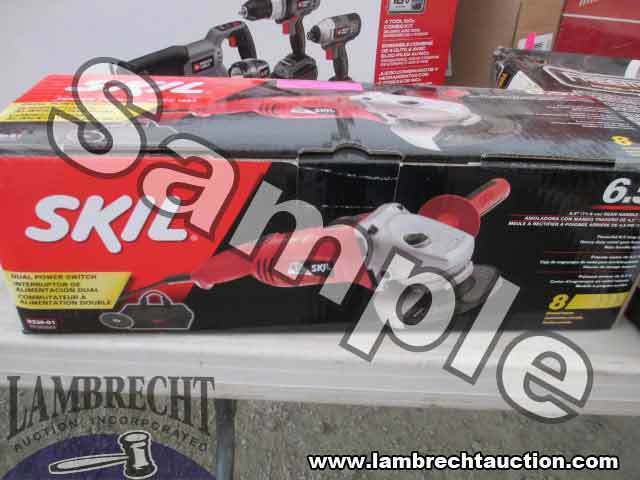 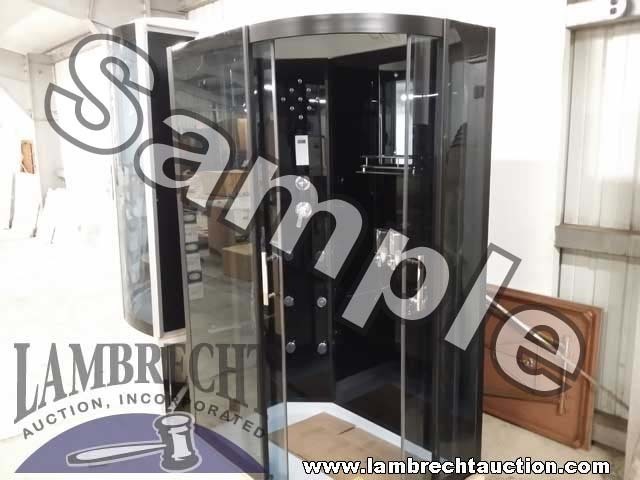 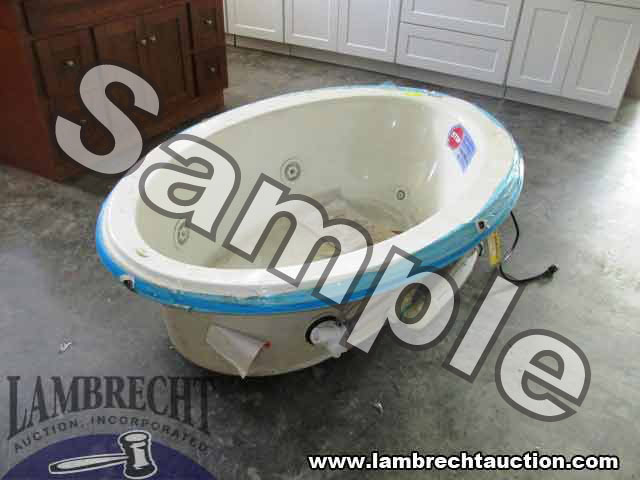 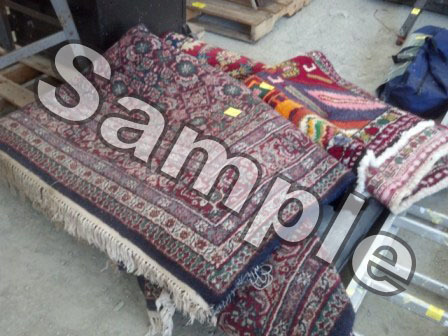 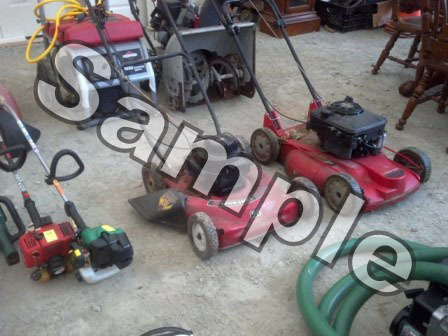 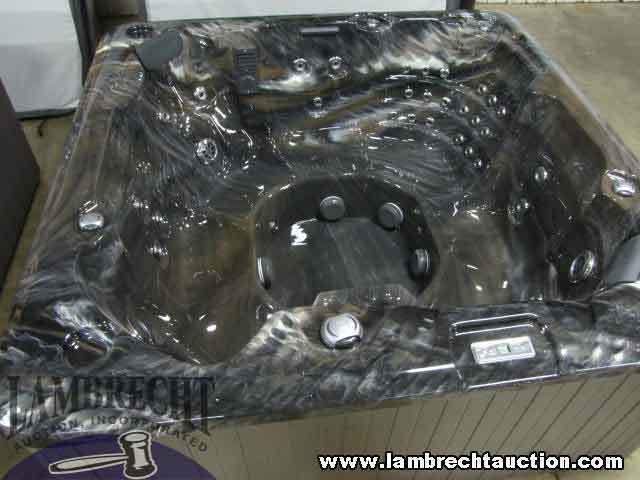 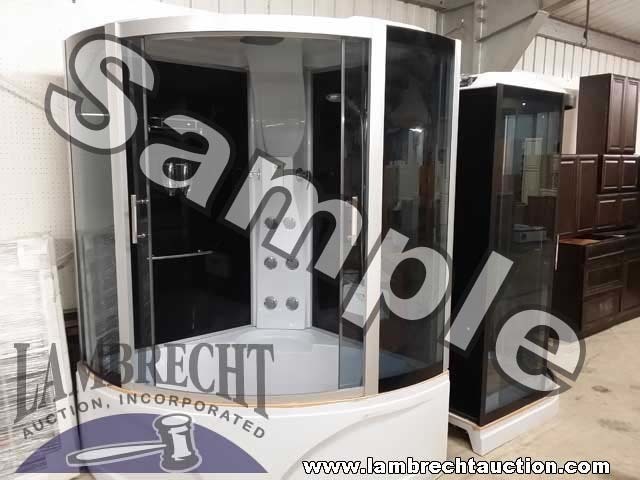 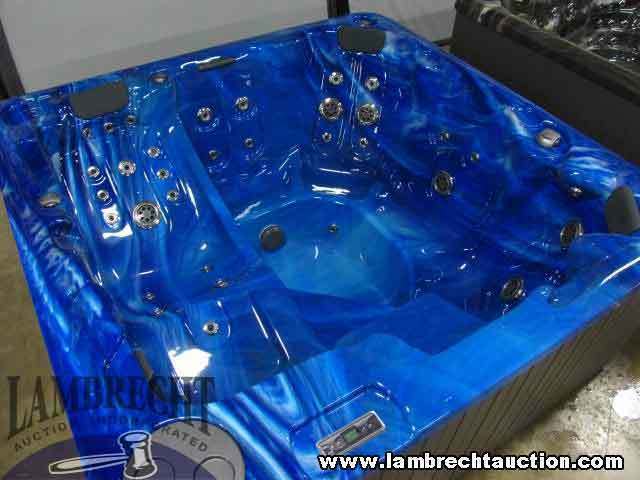 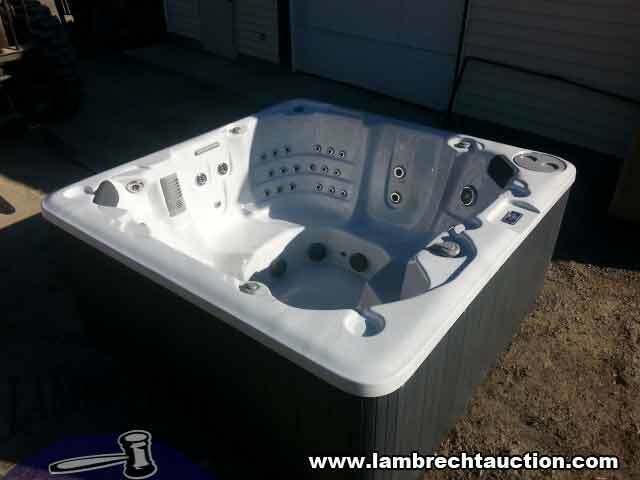 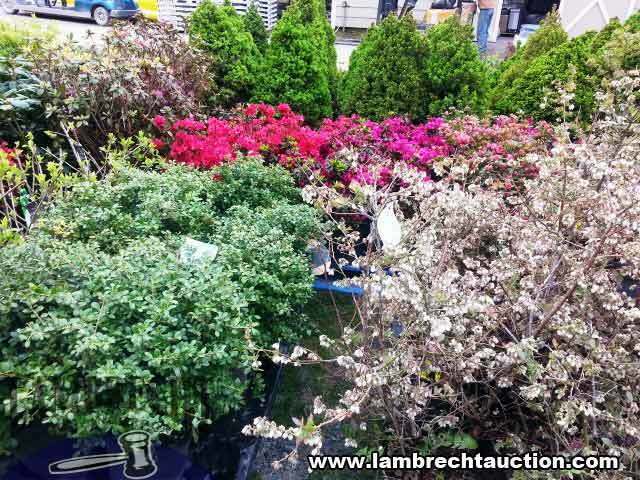 Preview : Friday, May 4th, from 10 am to 6 pm & Auction Day 8 am to Auction Time! 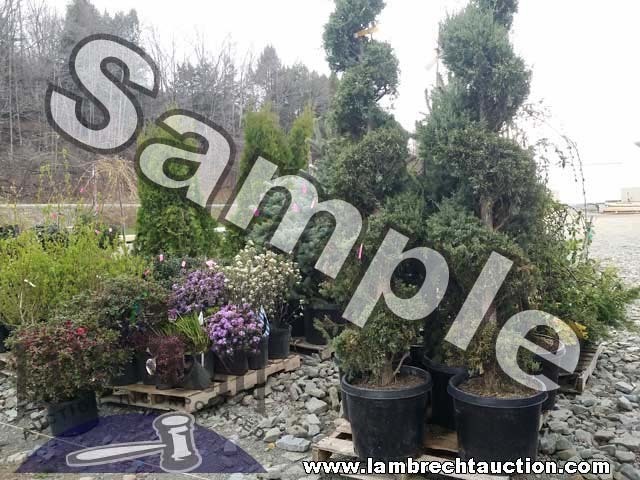 Pickup: Saturday, May 5th from 12 pm to 6 pm, And Monday, May 7th to Wednesday, May 9th, from 8 am to 3 pm each day (Forklifts Available). 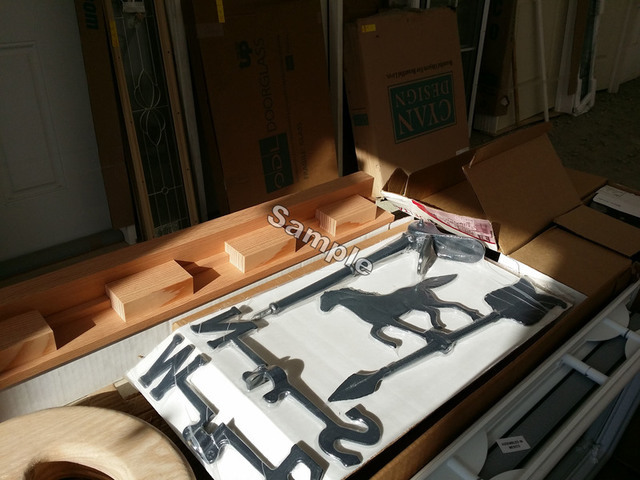 Come Prepared. 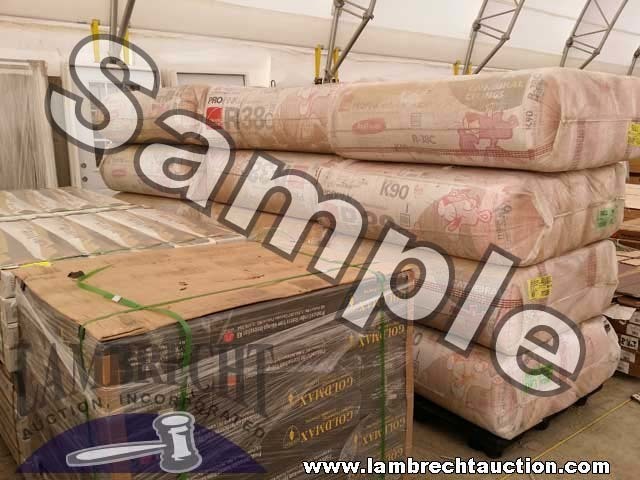 Please bring proper Vehicles for loading the items you purchased. 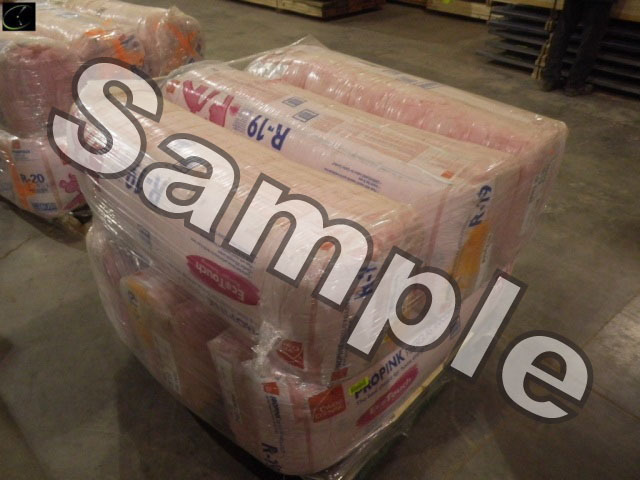 Additionally, please bring strapping, wrap material, blankets, and anything else relevant to ship the items you purchase. 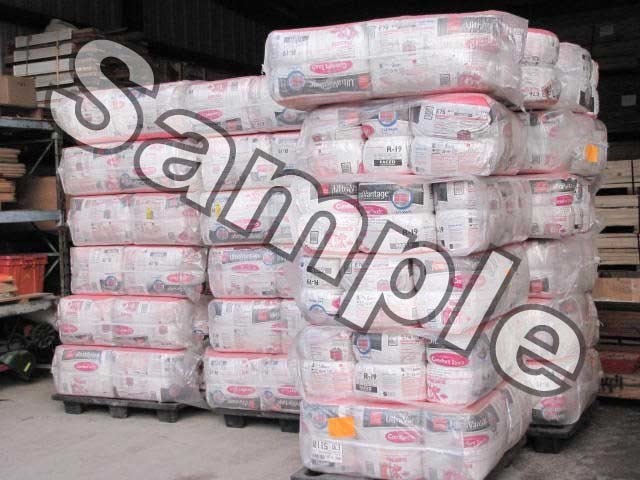 Check your tire pressure to avoid any tire blowouts while traveling after you are loaded. 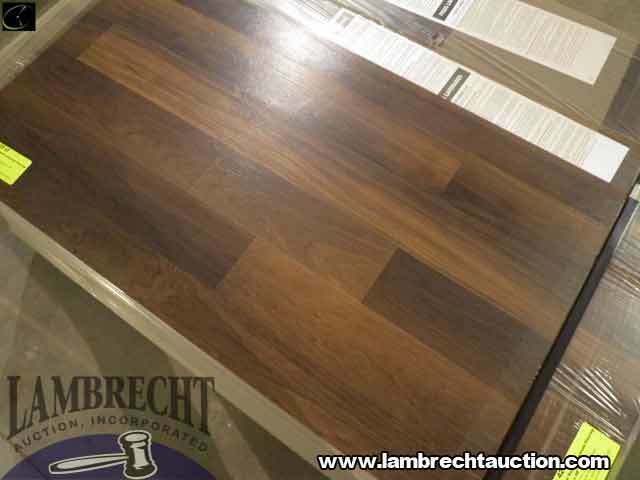 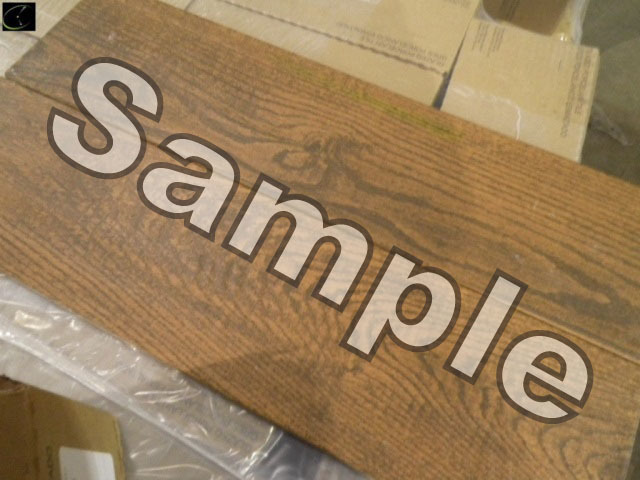 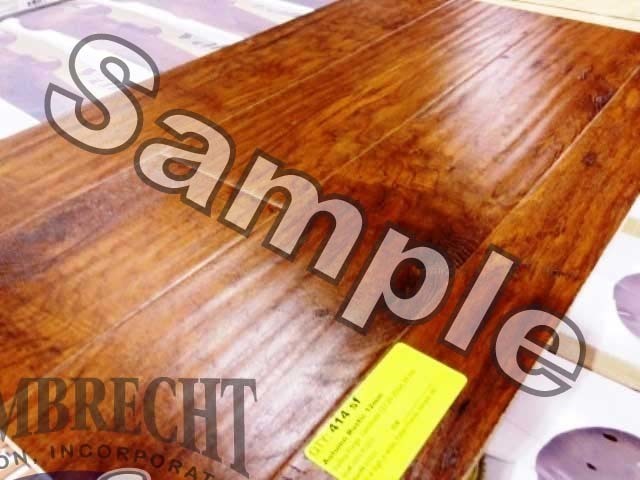 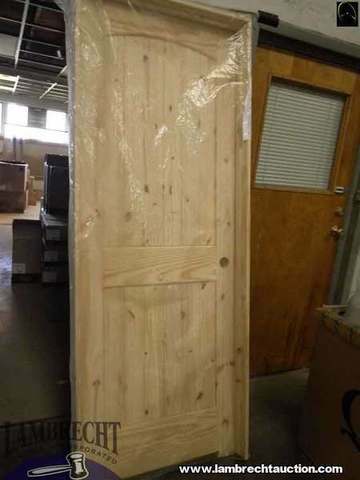 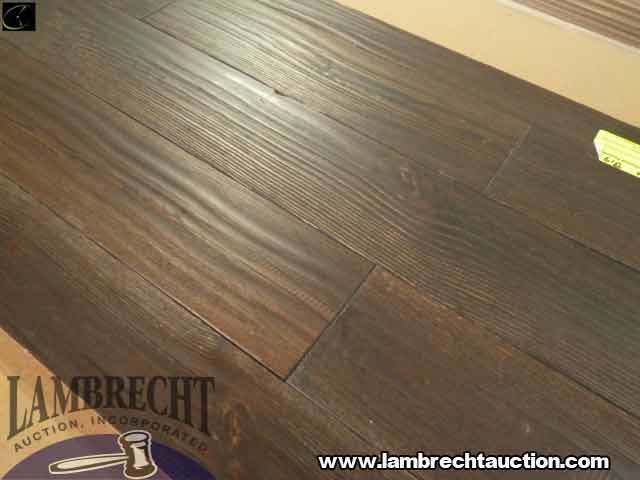 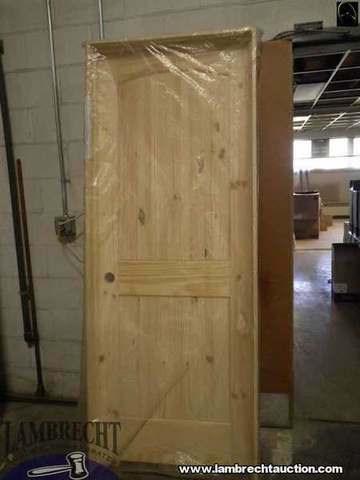 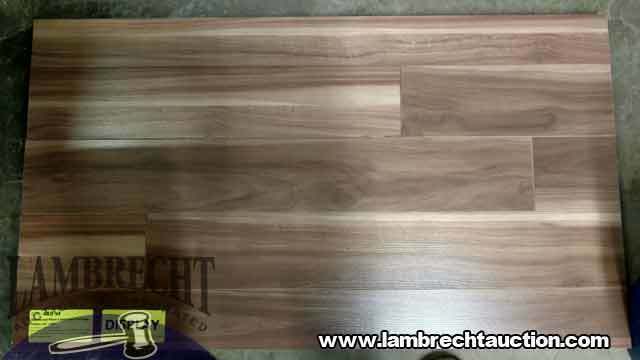 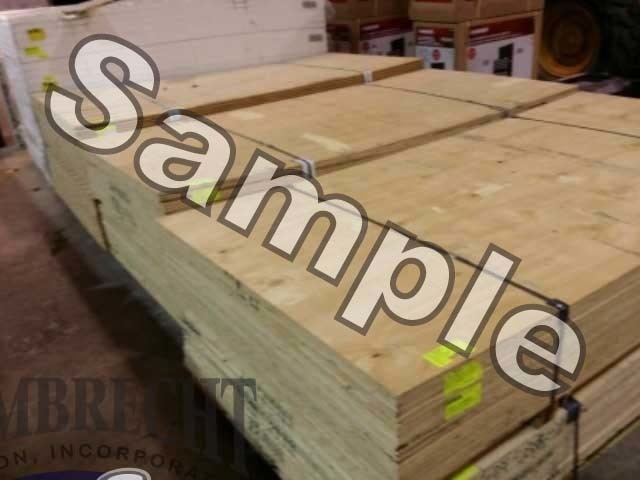 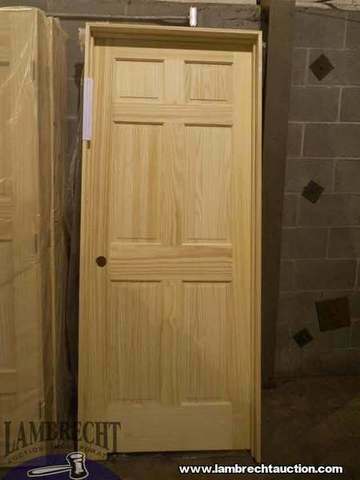 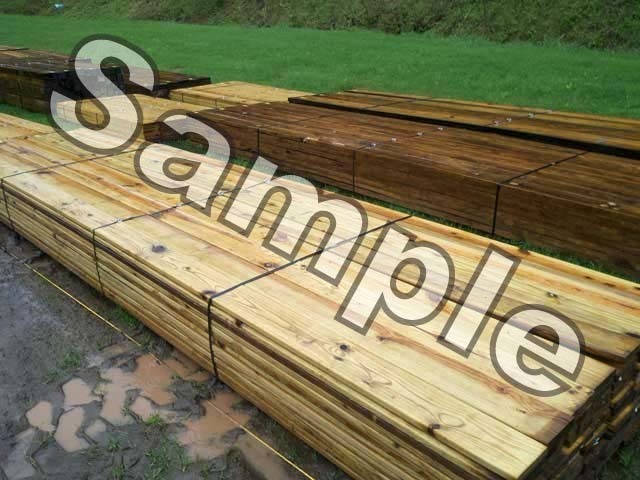 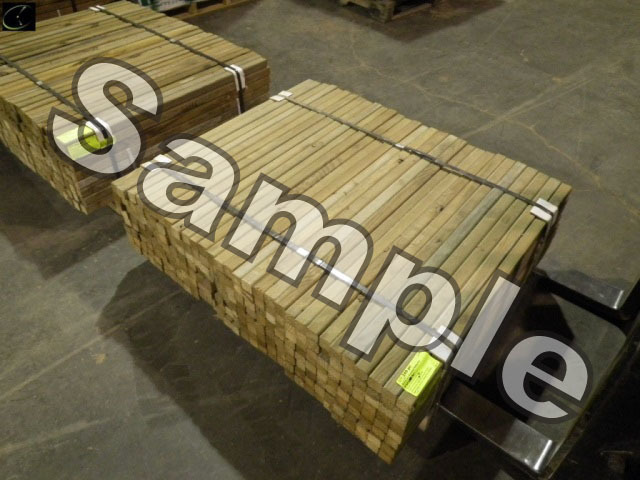 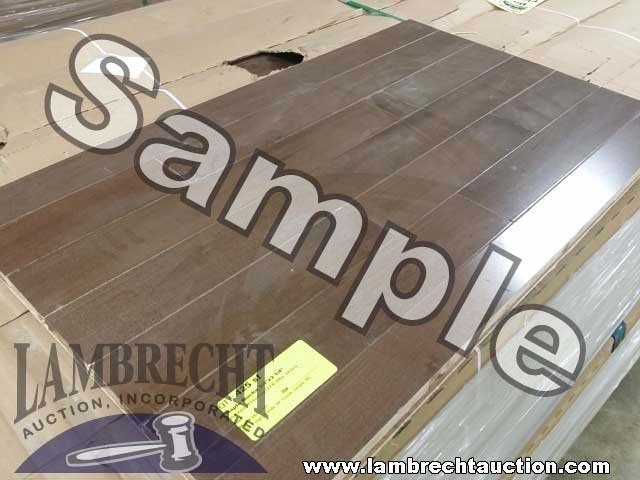 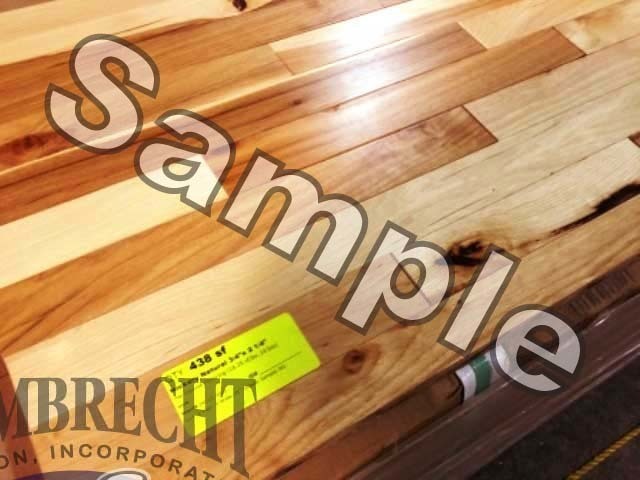 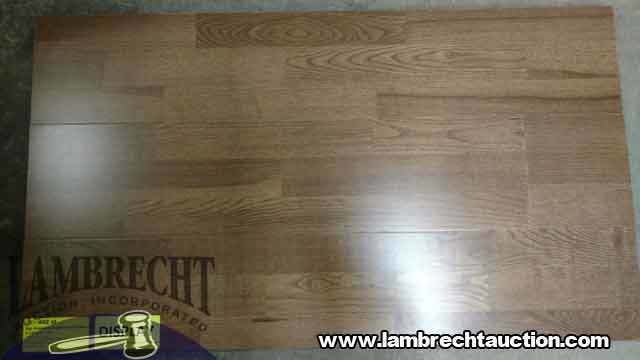 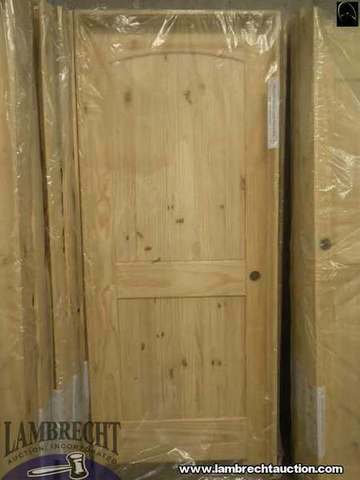 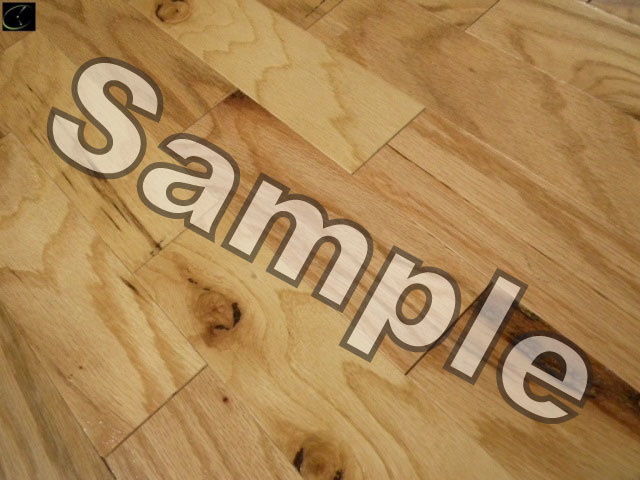 Ash Gunstock Flooring 13.5mmx5 1/2″x71 1/2″ 402 Engineered hardwood flooring, 3 strip, 18 boxes, A grade, *Additional flooring of this style MAY be available. 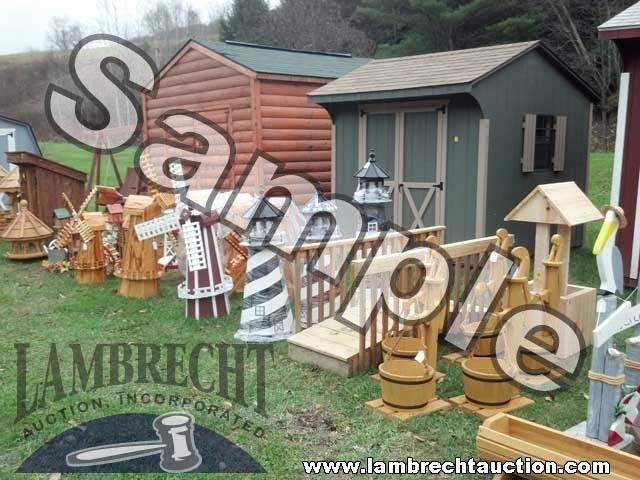 Please be sure to call our office at, 607-865-6951, if you are looking for an additional amount. 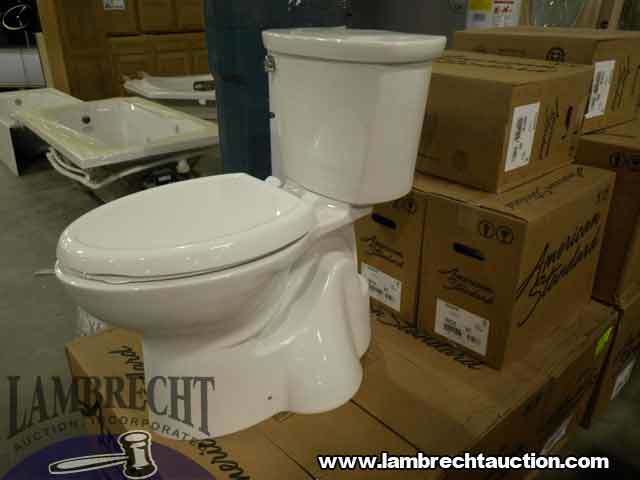 Please don’t assume that we have extra. 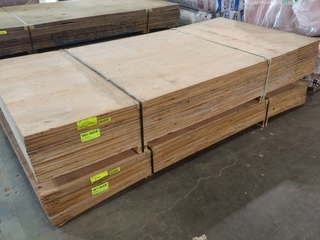 Red Oak Natural Eng. 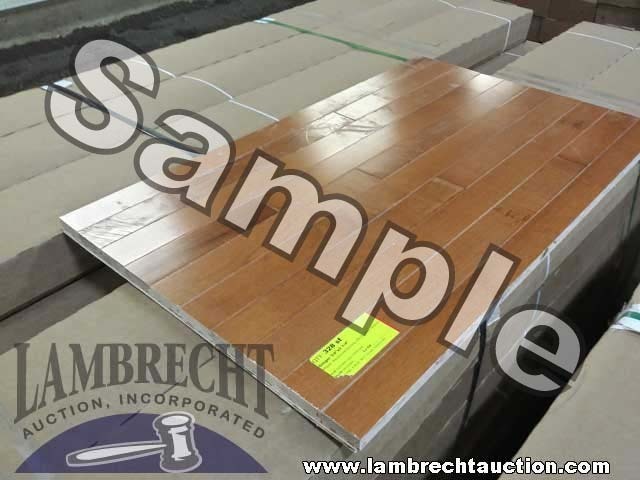 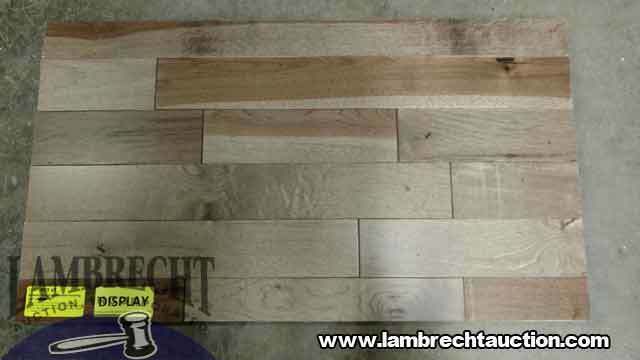 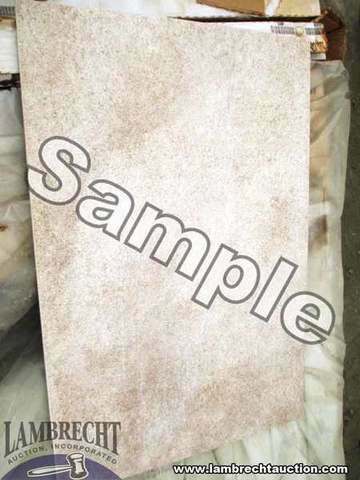 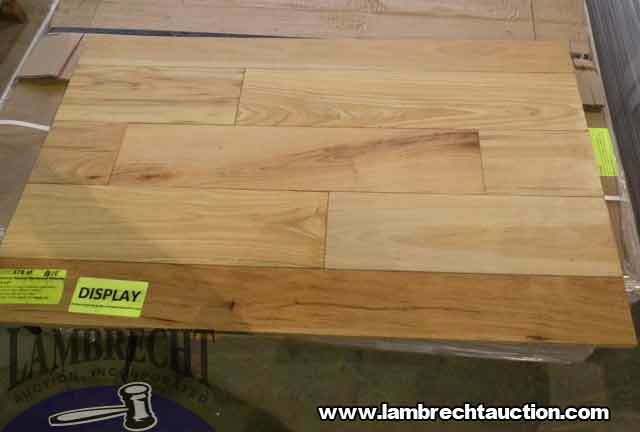 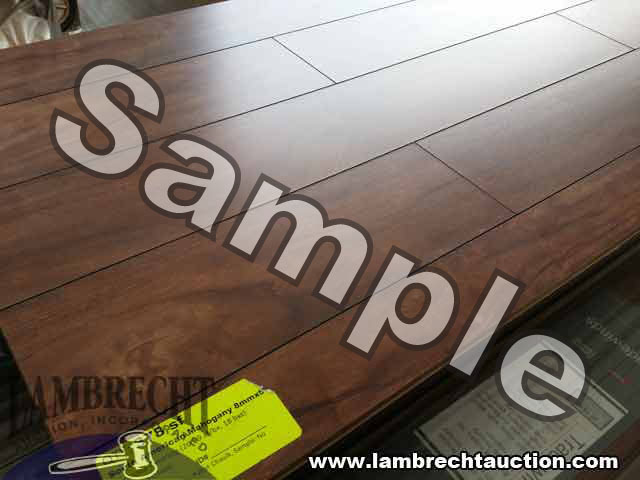 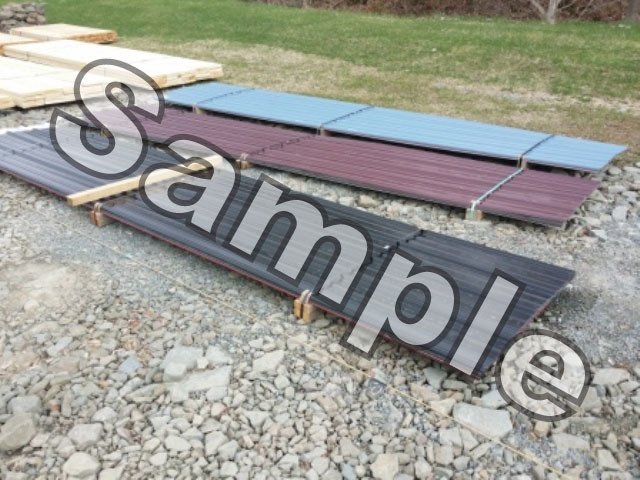 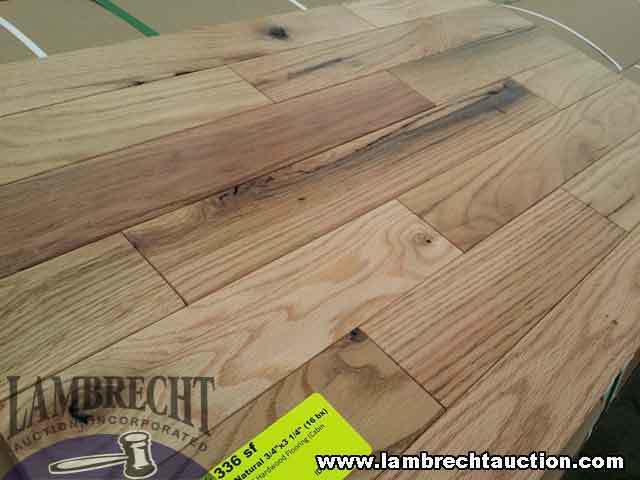 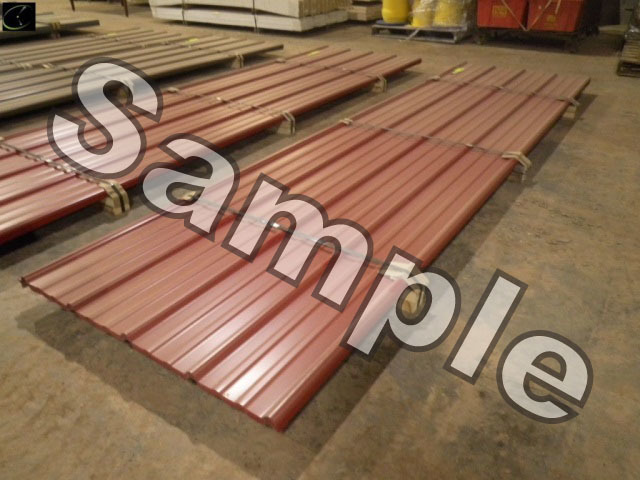 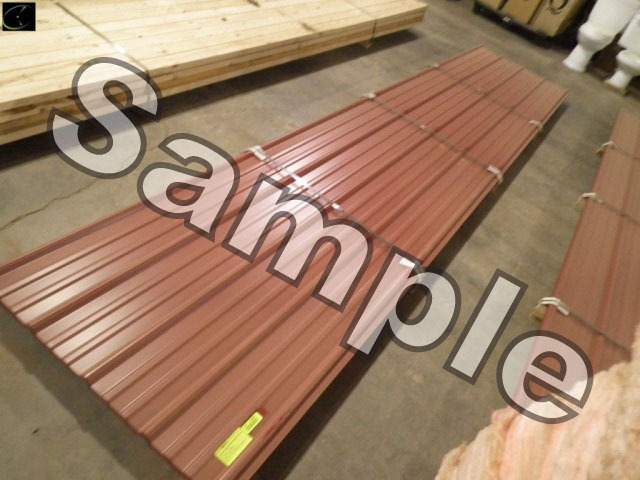 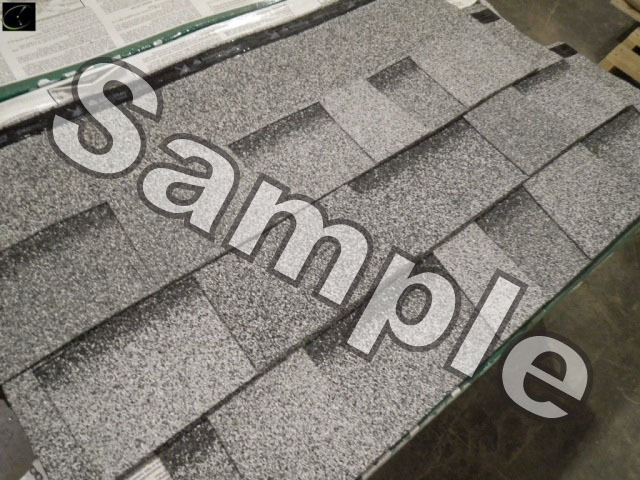 Flooring 13.5mmx5.5″x71.5″ 402 4 strip, 18 boxes, A grade, *Additional flooring of this style MAY be available. 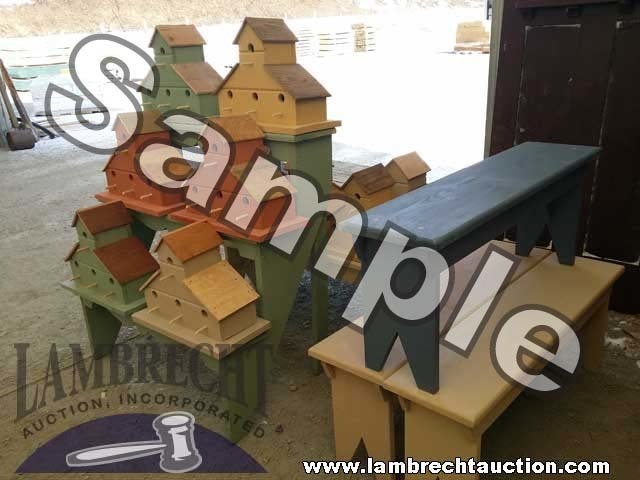 Please be sure to call our office at, 607-865-6951, if you are looking for an additional amount. 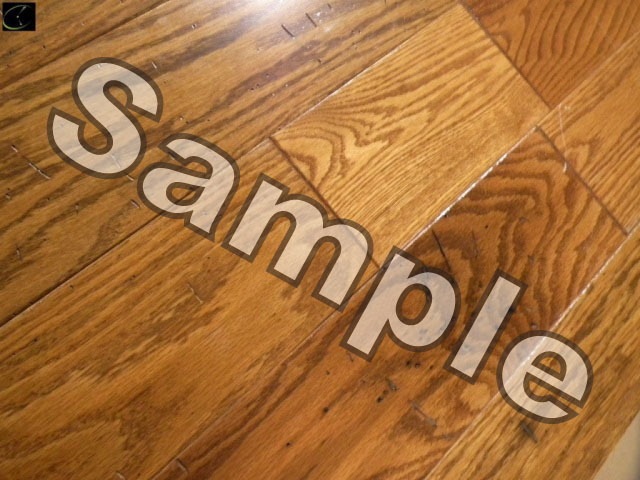 Please don’t assume that we have extra. Red Oak Natural Hardwood Flooring 3/4″x2 1/4″ 405 By Delta, 20 boxes, cabin grade, *Additional flooring of this style MAY be available. 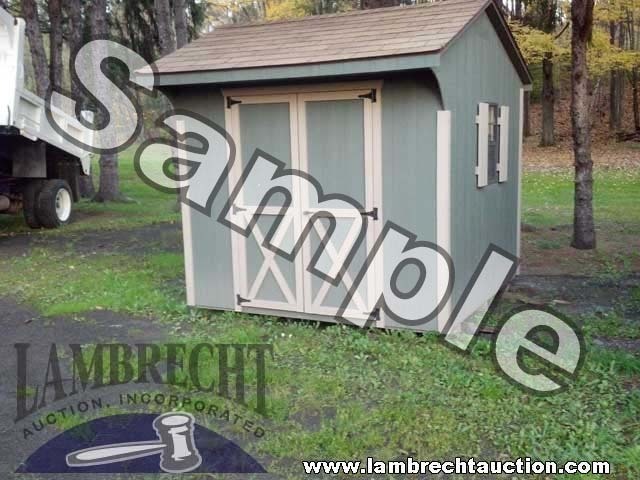 Please be sure to call our office at, 607-865-6951, if you are looking for an additional amount. 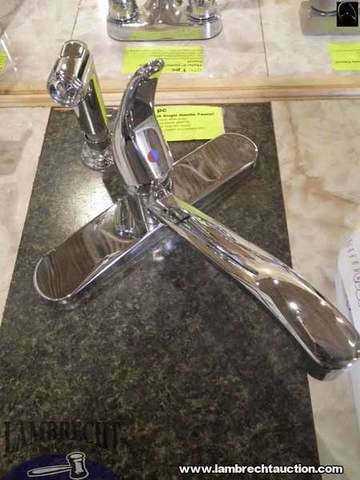 Please don’t assume that we have extra. 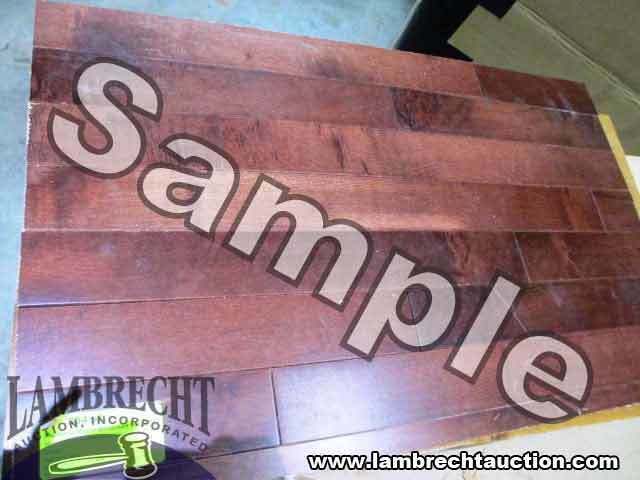 Chestnut Laminate Flooring 12mmx7 1/2″x54″ 787 By Kronotex, B grade, *Additional flooring of this style MAY be available. 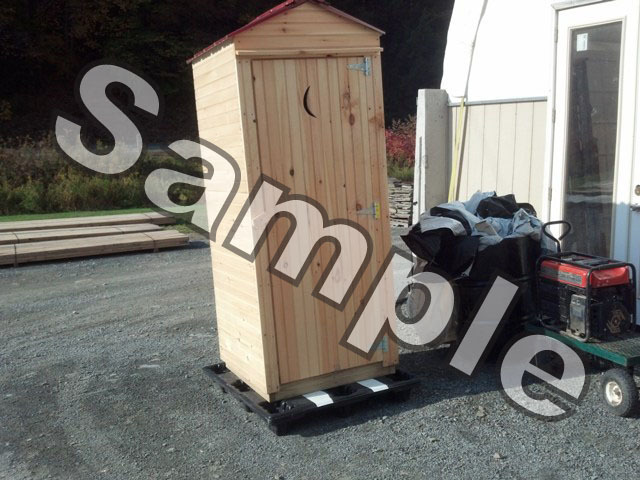 Please be sure to call our office at, 607-865-6951, if you are looking for an additional amount. 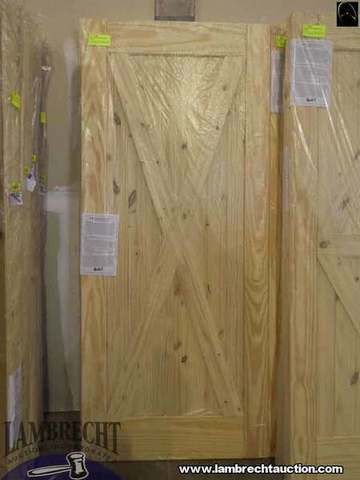 Please don’t assume that we have extra. 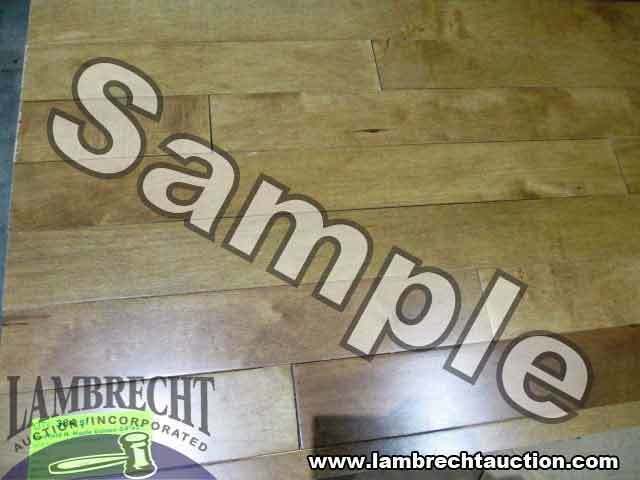 Refined Oak Laminate Flooring 12mmx6″x48″ 241 By Uniboard, 21 boxes, B grade, *Additional flooring of this style MAY be available. 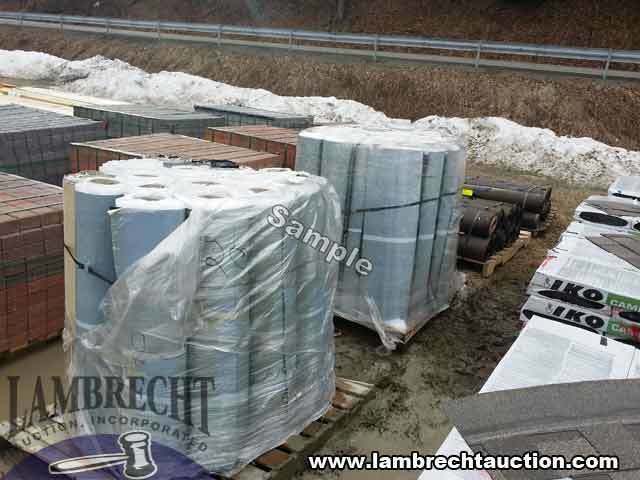 Please be sure to call our office at, 607-865-6951, if you are looking for an additional amount. 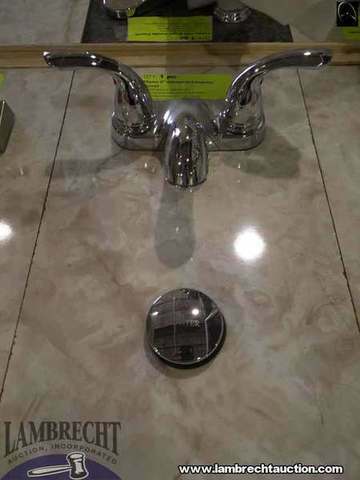 Please don’t assume that we have extra. 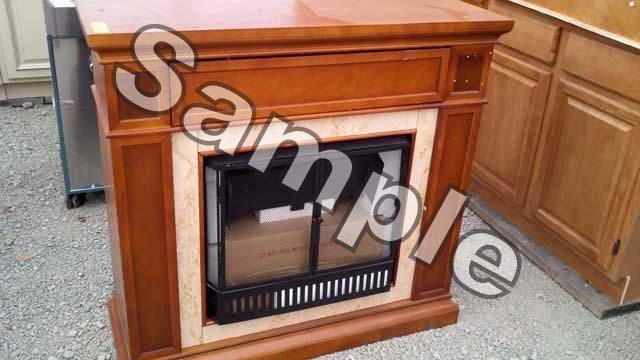 13% buyers premium when paying with credit card, 10% when using cash or good check. 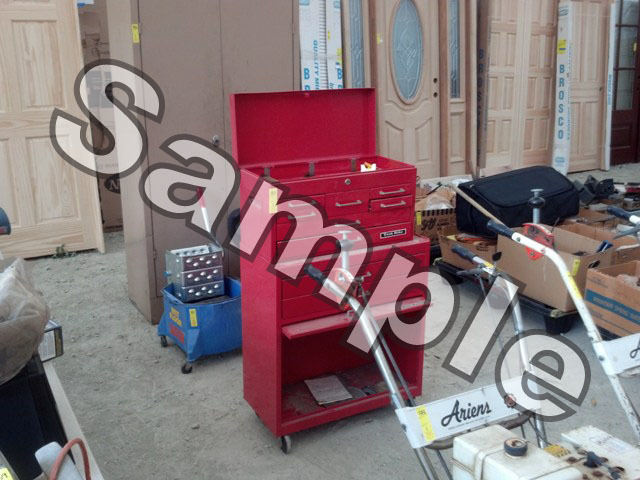 All items must be picked up by Wednesday, May 9th. 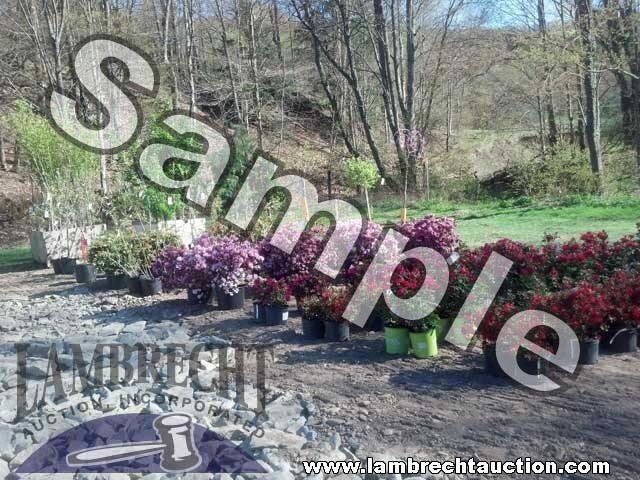 All items must be paid for by 5pm on Saturday, May 5th. 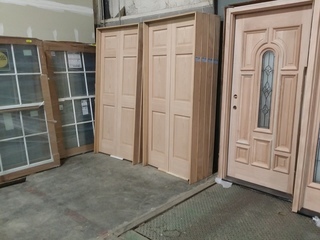 If you need to pickup on a different day than the noted pickup days you will need to contact our office, (607) 865-6951, and schedule an appointment.